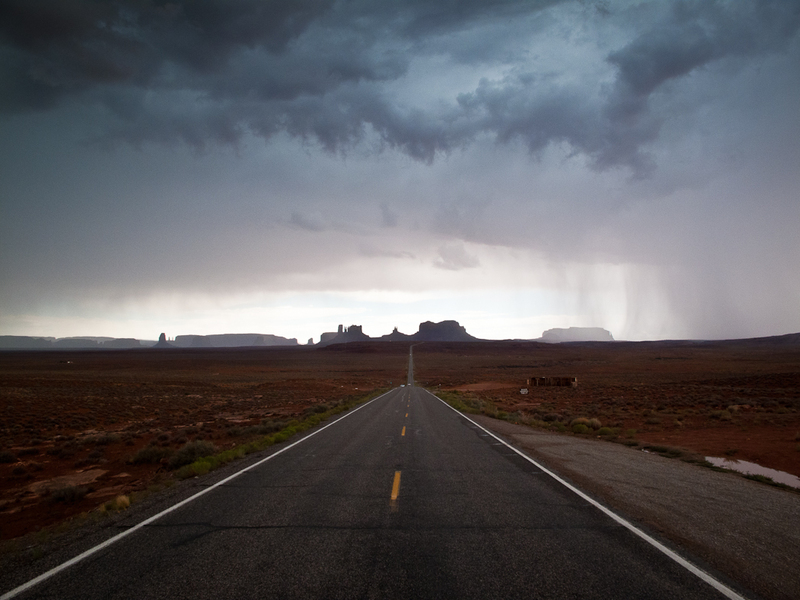 INTO INDIAN COUNTRY – THE DESERT SMELLED LIKE RAIN and CALIFORNIA HERE WE COME! 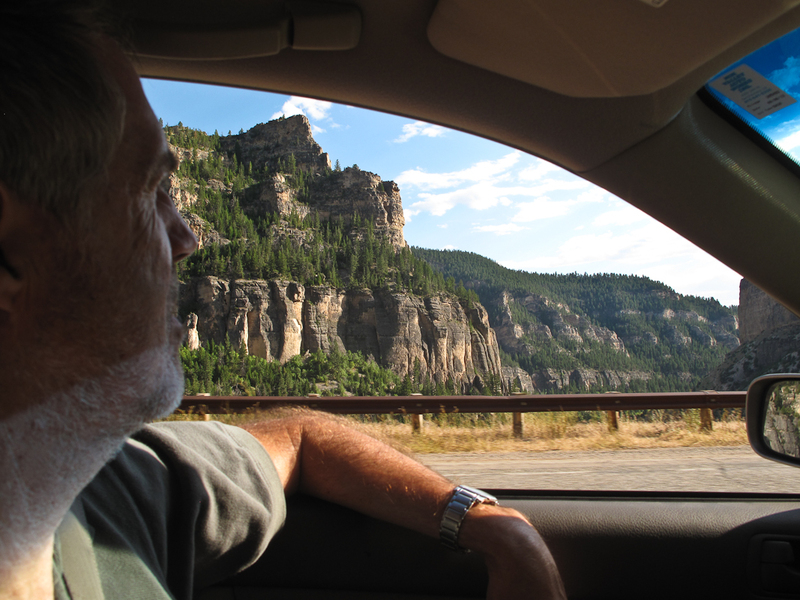 7/15/12 – We headed west from Durango to the Ute Mountain Indian Reservation. We knew that this was a poor tribe and we wanted to see if they had a library. We found it in a low office building shared with other tribal agencies. As far as we could tell the town was completely empty. 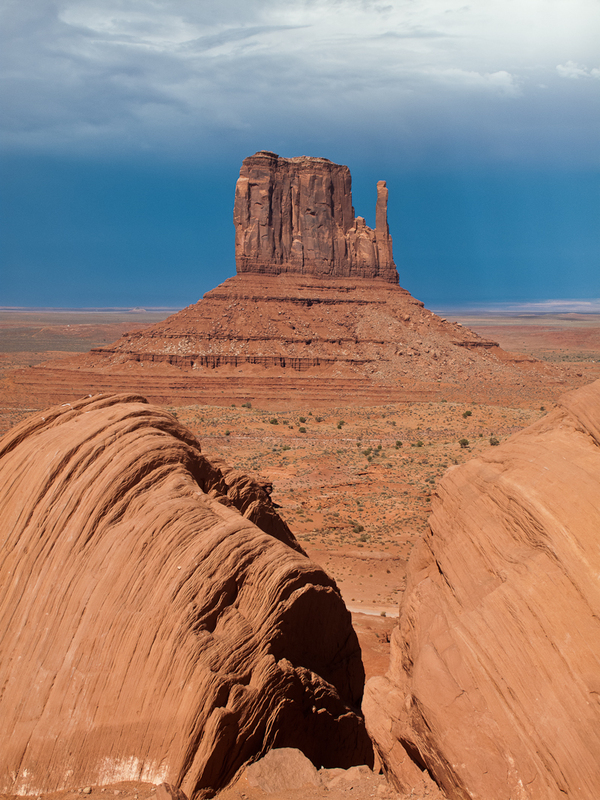 I photographed the library and the surrounding desert including some far-off buttes. Just as I finished, out of the empty streets came a Ute man who asked if we had gotten permission to photograph. I explained that we hadn’t seen any signs stating that we needed permission but we certainly would have asked had we known we needed it. Plus everything was closed and there were no people to ask. He then said that we would have to pay a fine and he would have to confiscate my film. I could see that he was quite serious. I started talking about the library project and how it was intended to point out the importance of public libraries across the country. I told him how I came out of a working class background in West Sacramento and how my local library and my education helped show me a bigger world. He started to soften. His name was Seleyin White Skunk and he had served as an Army Ranger. 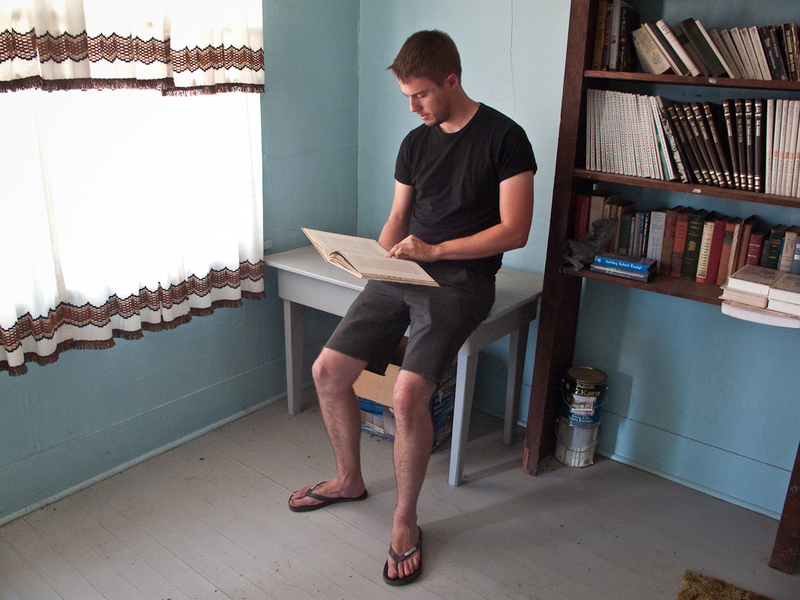 He too had found that reading and education were essential to broadening his own worldview. 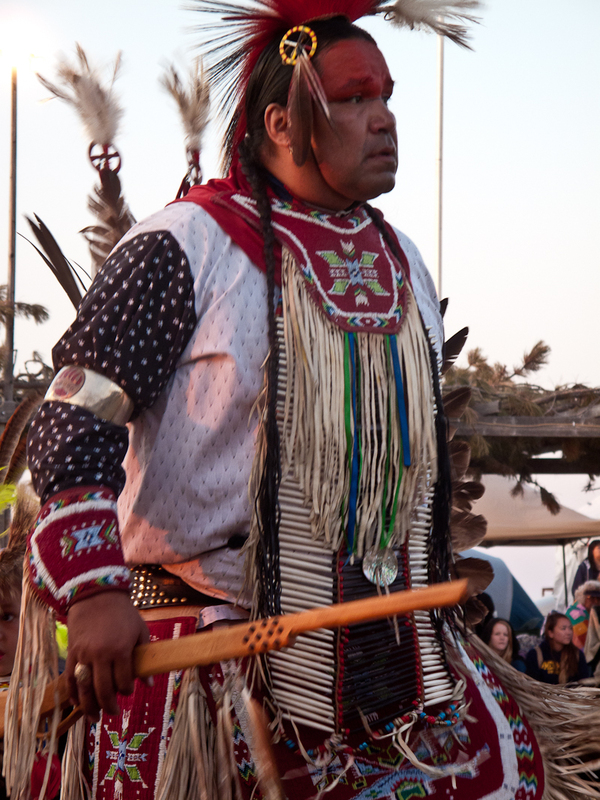 He was now Tribal Chairman and he said that they were struggling to get their kids to read or use the library that I had just photographed. 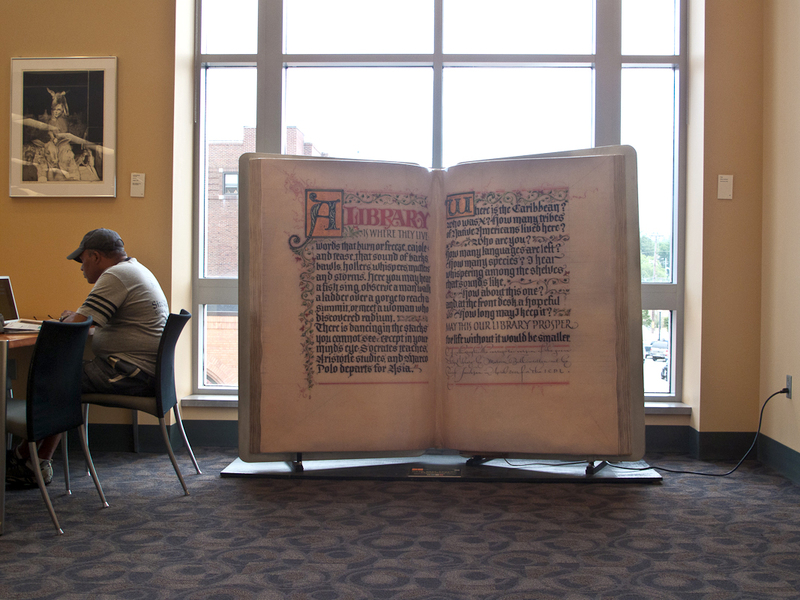 It was interesting to see how the library project became a way to bring us together. We both understood how essential education was for rising above our pasts. In the end he gave us permission and wished us a safe trip. We drove west under increasingly cloudy skies. Bluff, Utah was a fascinating town made up of Navajos, Mormons and Mormon Navajos. The library was housed in the old jail with a sign still above the door saying “Obedience To The Law Means Freedom”. It was made of very solid bricks. It was an interesting building with the Mormon Church and bright red desert buttes in the background. 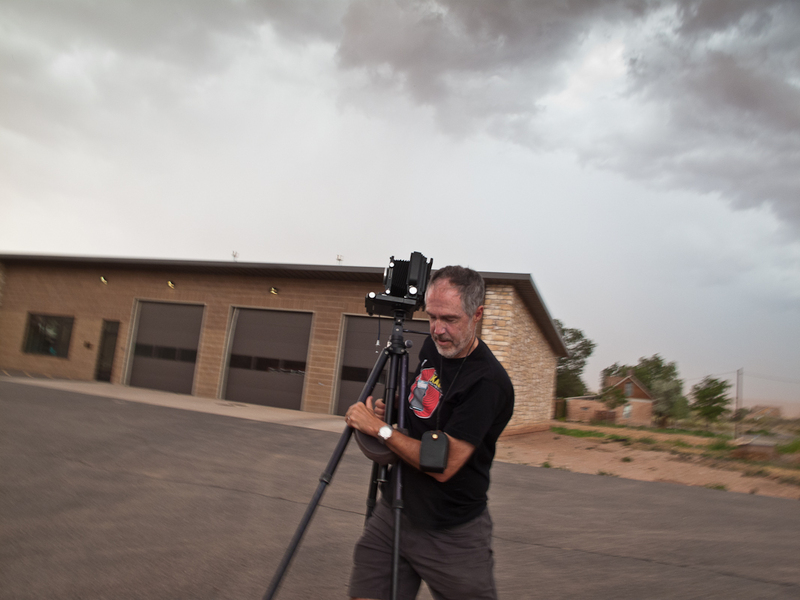 As I focused the 4X5 camera for the last shot a huge desert sand and rainstorm hit like a slap. I quickly put one foot down on my dark cloth that was starting to fly away. At the same time I reached over to grab my tottering camera on its tripod before it blew away. Just then Walker came running over and I yelled for him to put my large camera backpack in the car. I threw the 4X5 in the trunk and got wind blasted and soaked as I retracted the legs of my tripod. We were all shocked at how quickly and furiously the storm hit. 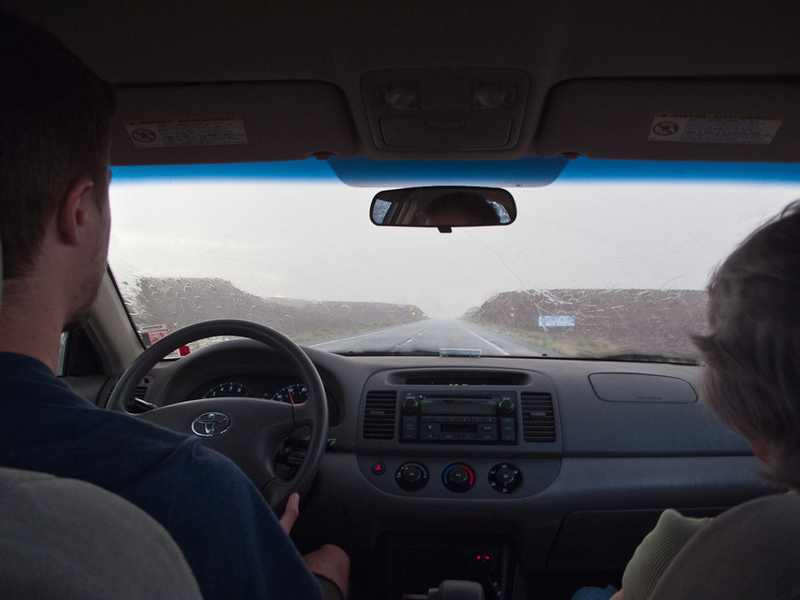 We tried to wait out the storm in the car but eventually drove off into the wind and rain. 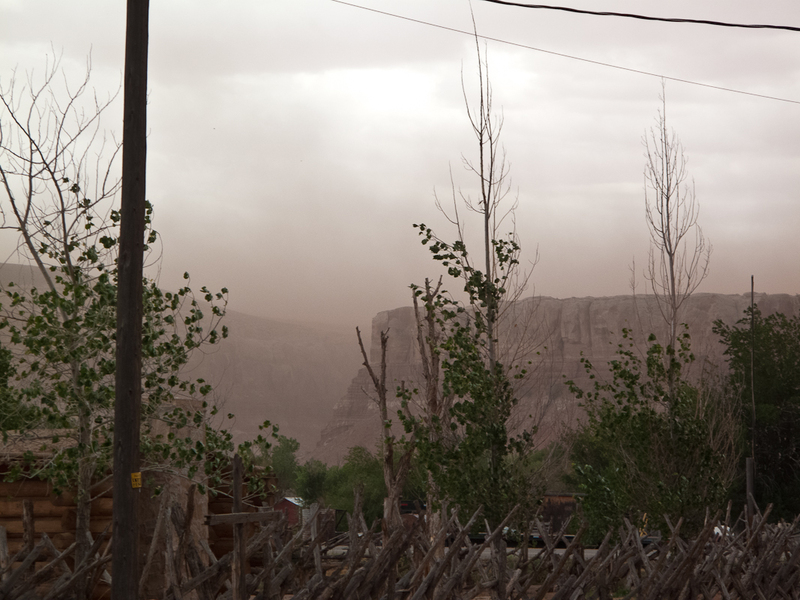 Like the title of the Gary Nabhan book the desert smelled like rain. 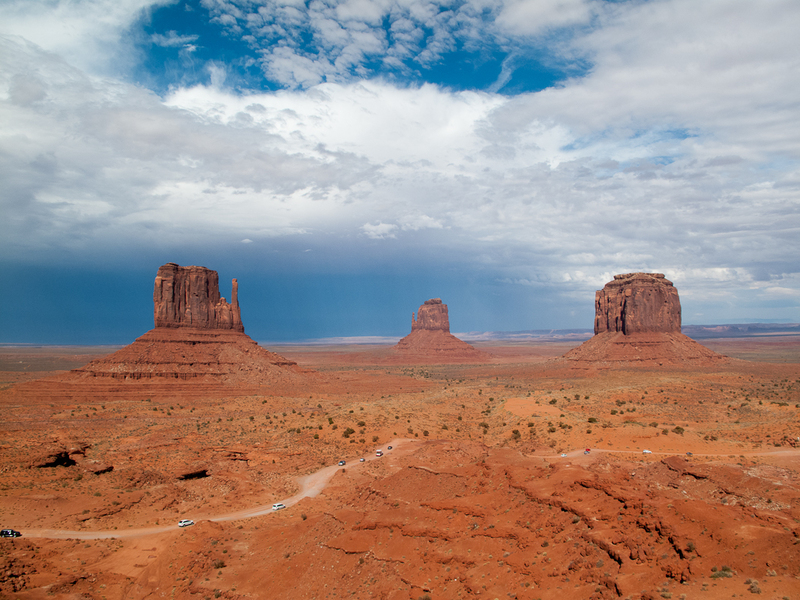 We continued west excited about seeing Monument Valley Tribal Park. The rain came in waves of violent downpours followed by cloudy darkness. As we approached the famous desert buttes of Monument Valley the sky was black except for a small light part in back of the buttes. Even thought it was raining we jumped out of the car and took what may be very interesting photos of the ironic rock formations. 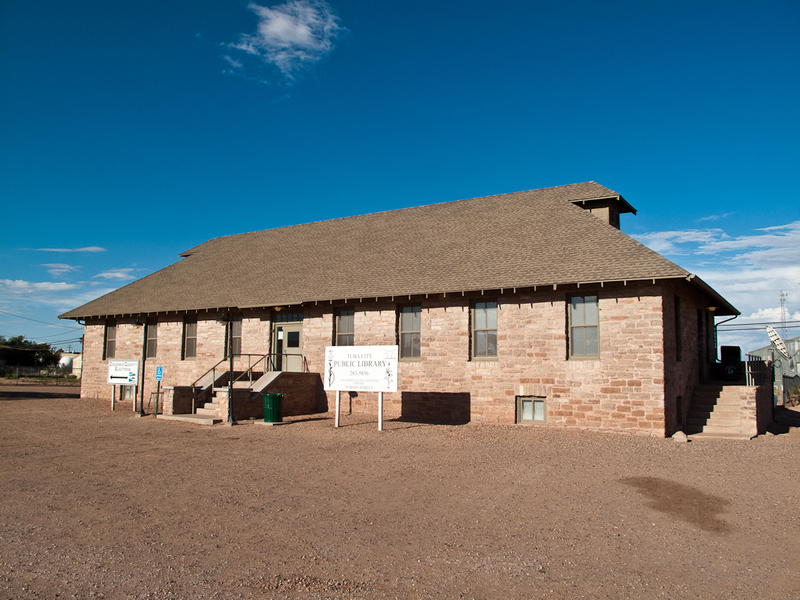 The Visitors Center was interesting because the Navajos, not the National Park Service, ran it. 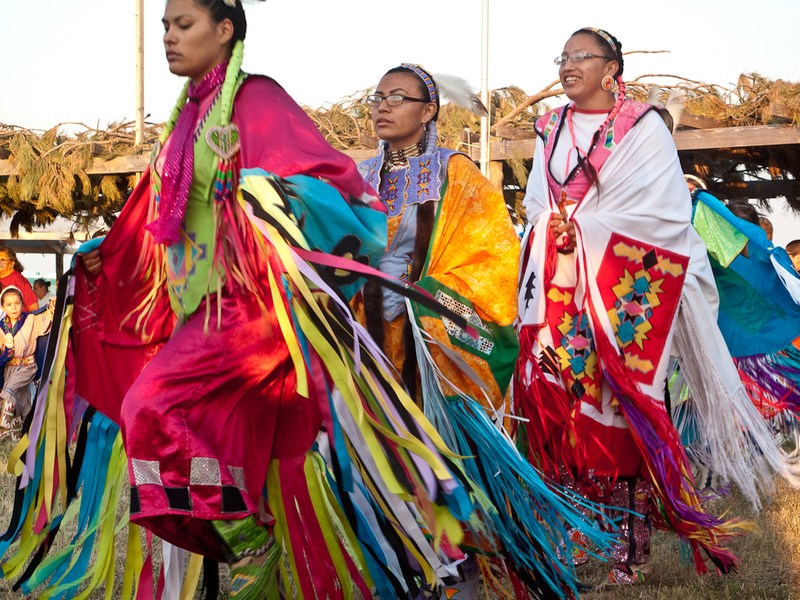 The Navajo Nation is one of the largest Indian Reservations in the country and includes the Hopi Reservation within it. 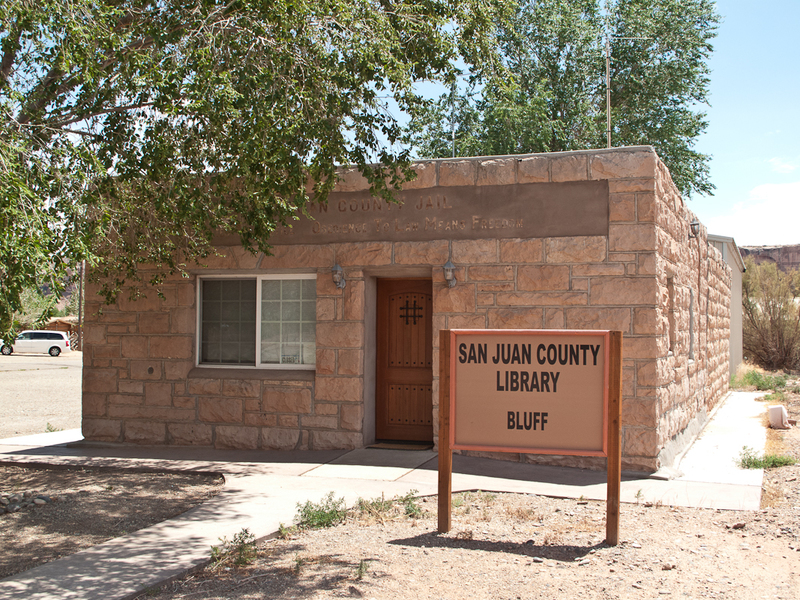 The last library of the day was in the Navajo/Hopi town of Tuba City, AZ. 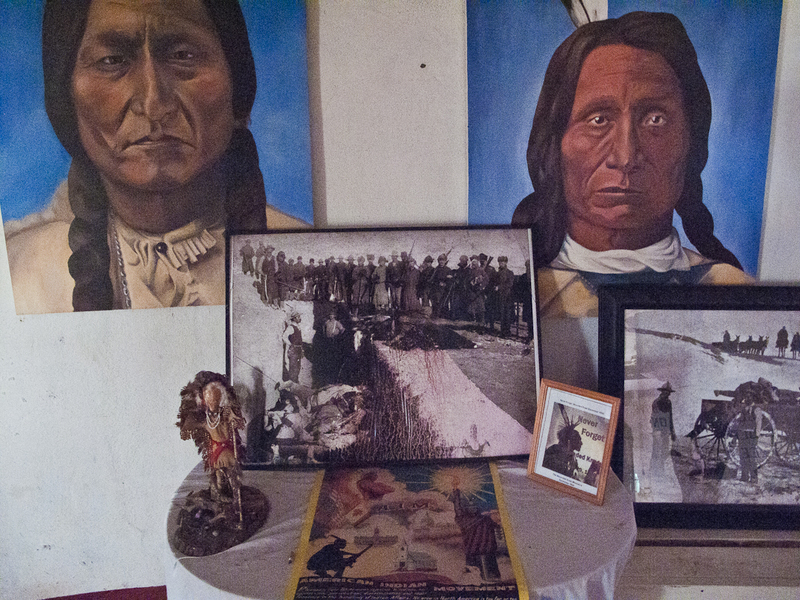 Originally built as a Trading Post it now contained what a local Hopi man called “a lot of history”. Etched against a bright blue sky and sharp desert light I wished that this beautiful building could tell me its stories. We continued on into the changing weather. 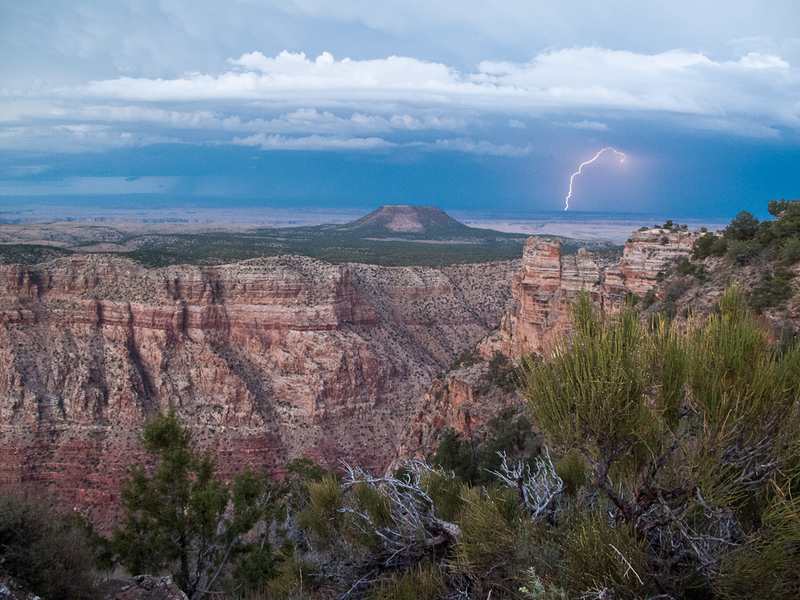 As we approached the eastern edge of Grand Canyon National Park we were treated to another whopping downpour followed by a weird lightshow in the sky. It was fantastic and unlike anything any of us had seen before. 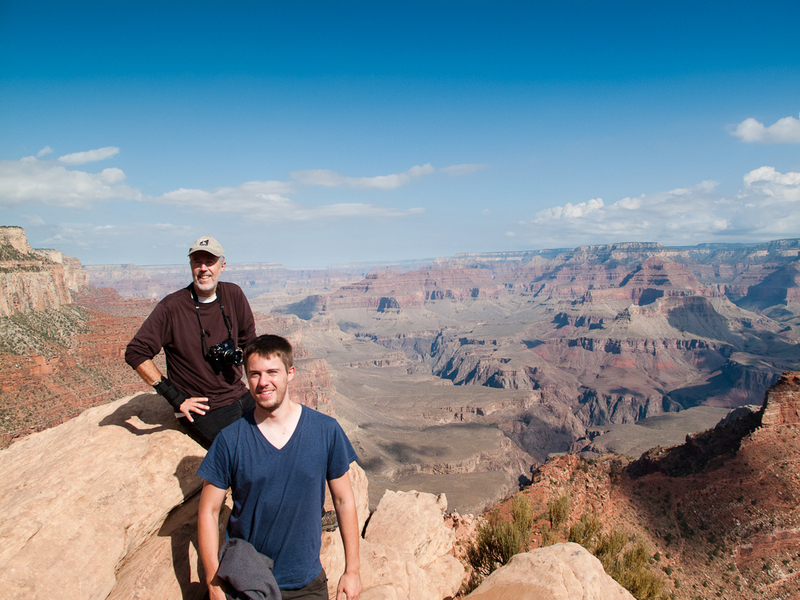 We made it to the Rim of the Grand Canyon in the last light of the day. Flashes of lightening were visible in the east from the storm we had just passed through. Nature never ceases to be endlessly fascinating. 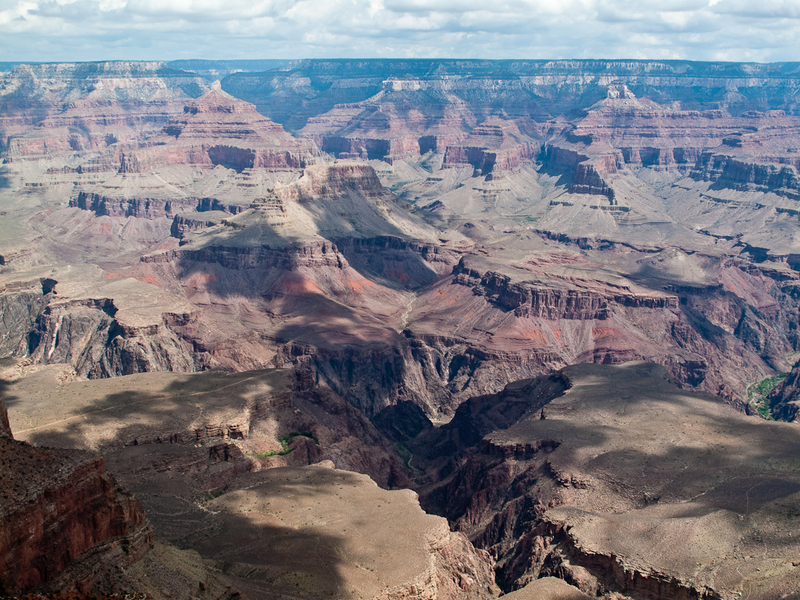 7/16/12 – Grand Canyon – one of the Earth’s most powerful, inspiring landscapes – overwhelmed our senses. 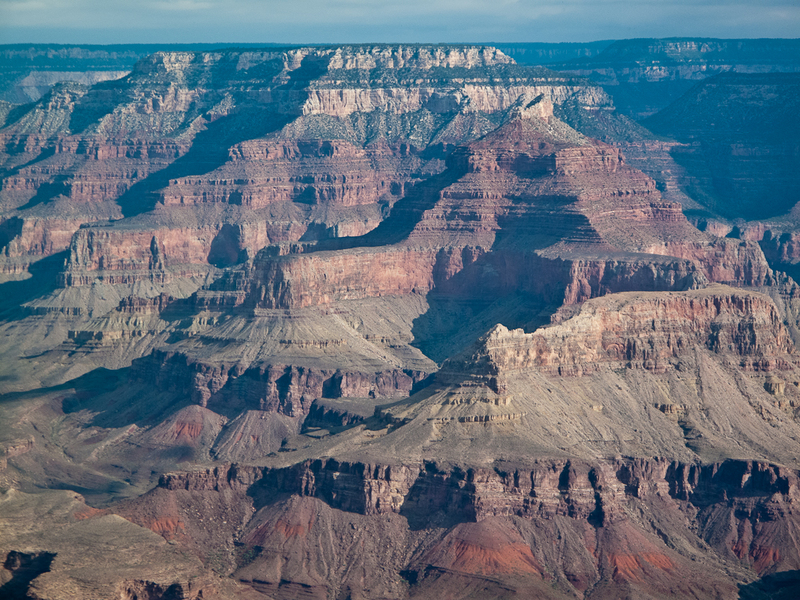 Its story tells of geologic processes played out over unimaginable time spans was a unique combination of size, color and dazzling geologic forms. It was a mile deep and 2 billion years in the making. 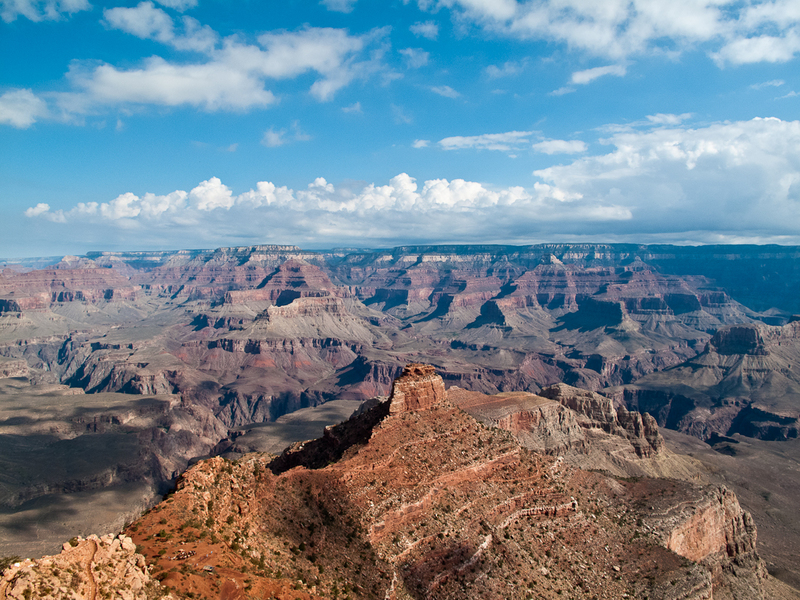 We started the day with an early morning 3-mile hike to Ooh Ahh Point in the Grand Canyon. 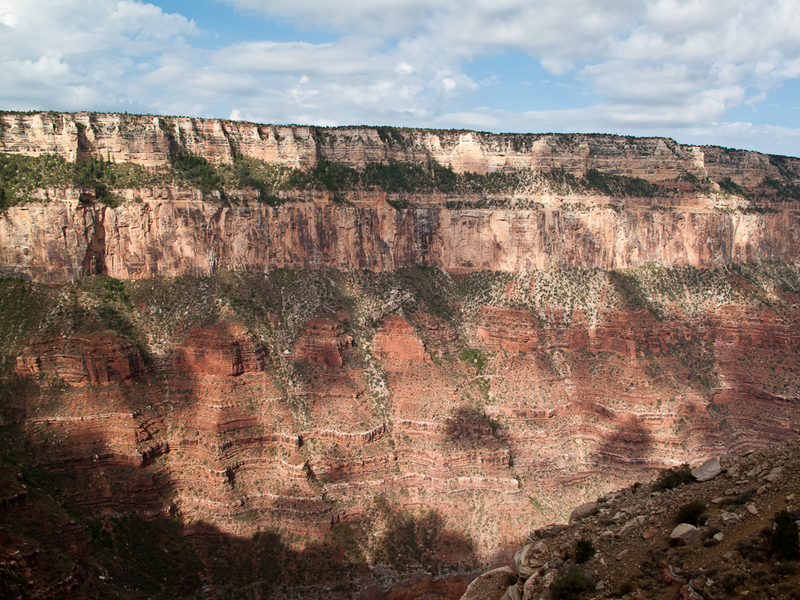 It was a thousand foot drop to a spectacular panoramic overview inside the Canyon. Of course, it was a thousand foot climb back up to the Rim. Walker did it in flip-flops dodging a giant rock that almost smashed his skull. 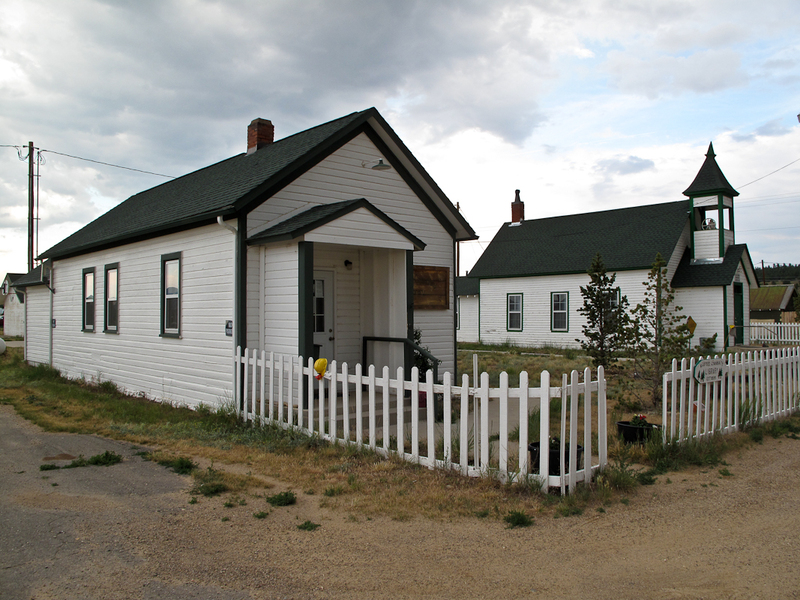 The only library of the day and the last one for this year’s Library Road Trip was the Community Library in the Grand Canyon Village. Like Death Valley and Yosemite this was a public library within the National Park. It was actually a branch of the Flagstaff, AZ library and the librarian was an employee of the Flagstaff Public Library. 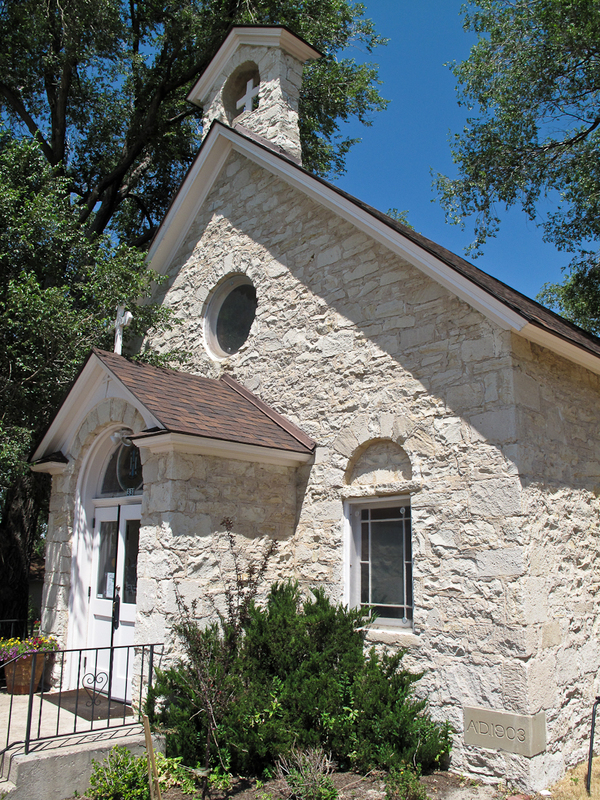 It was originally built as a one-room schoolhouse in 1906. Its rustic cabin features fit nicely into the surrounding pine forest. The librarian apologized for the scaffolding on the front but I explained that I liked to photograph libraries as they actually are rather than an idealized version. 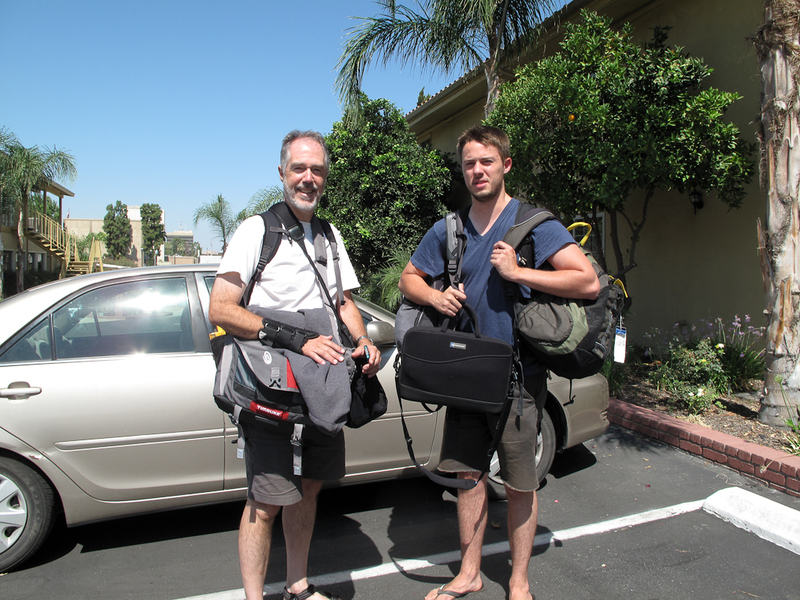 We then drove straight for 500 miles over eight hours until we arrived in Bakersfield, CA. 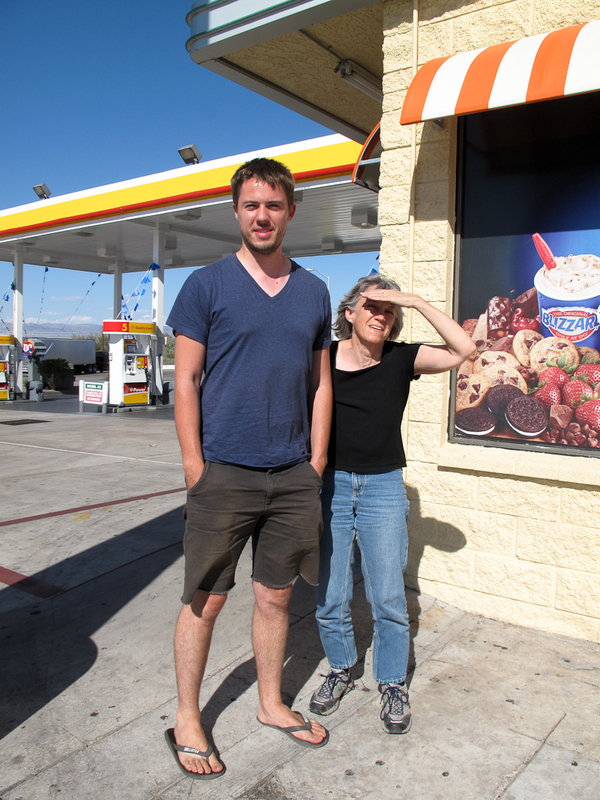 Our only stop was in Needles, CA where we got ice cream at the local DQ. It was 110 degrees outside but it felt great to be back in California. After seeing much of the country on these two big Library Road Trips we are still fascinated by the diversity of our home state including the strange desert of culture of places like Needles. We had the interesting realization that the two Library Road Trips touched here in Needles. The first night of last year was spent here. 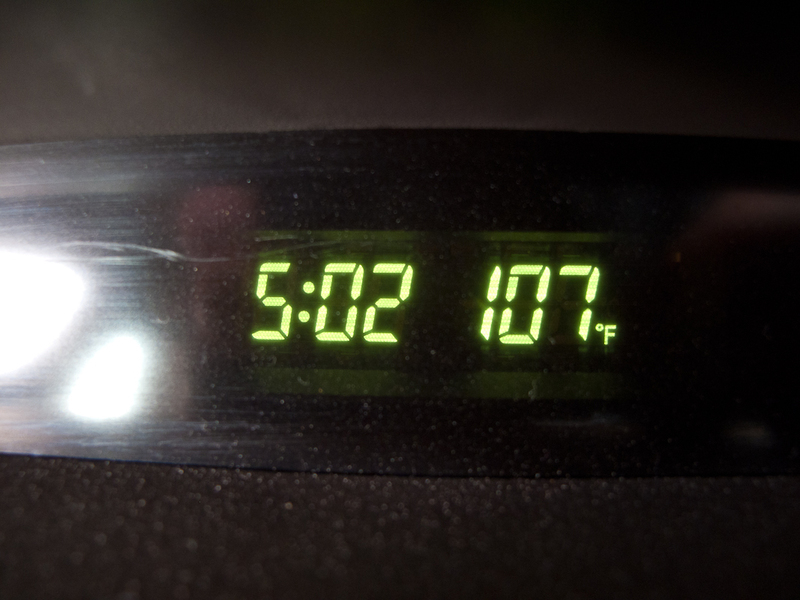 It was only 109 degrees then, but it was at night. Now we were traveling through here again on one of the last days of this trip. As we entered the San Joaquin Valley we thought of the Joad family as they first glimpsed this agricultural paradise in John Steinbeck’s The Grapes of Wrath. We drove into Bakersfield listening to Willie Nelson and mariachi music. According to the American Lung Association’s 2012 study this city has the worst air quality in the nation. Fortunately, we escaped most of the heat and pollution with a cool breeze blowing through the streets of Bakersfield. 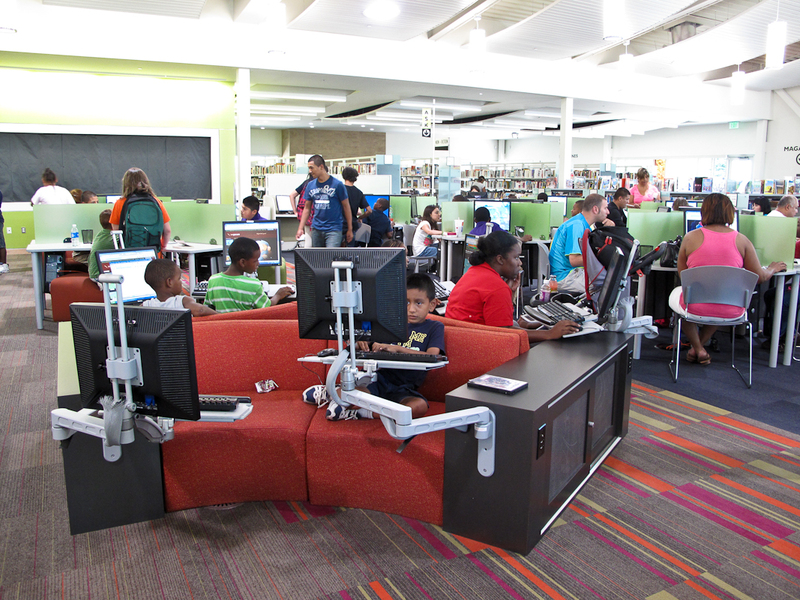 Last year we photographed 189 libraries in eight weeks traveling over 11,000 miles. This year we photographed 110 libraries in four weeks traveling over 10,000 miles. In other words we traveled almost as many miles as last summer in half the time. No wonder we are exhausted! This year’s journey was much faster paced. 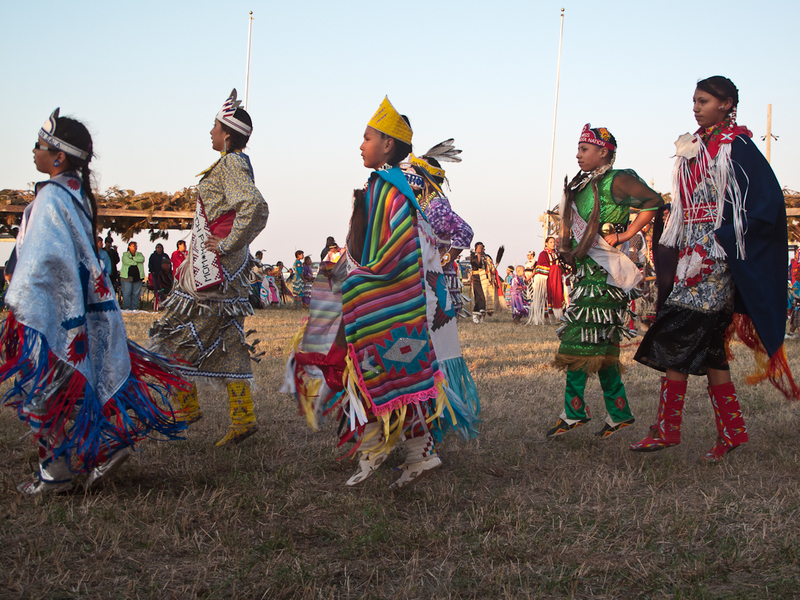 In addition to photographing white culture this year we focused more on Indian culture. Last year we focused more on black and Hispanic culture. 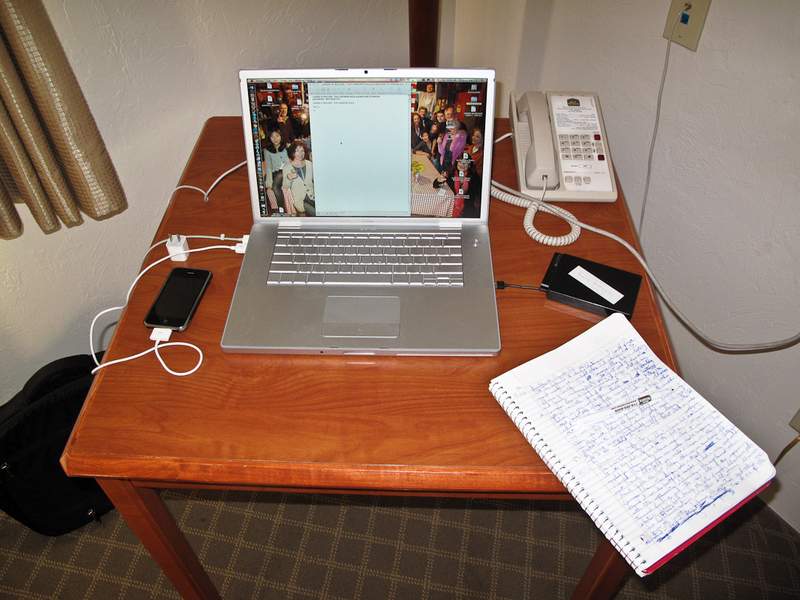 I am now ready to go home and develop and edit the film from this trip. After that I will be working 24/7 on the book. More on that later. Thanks for following this blog. Your comments are appreciated. I will be uploading some of the film images once I get them developed. 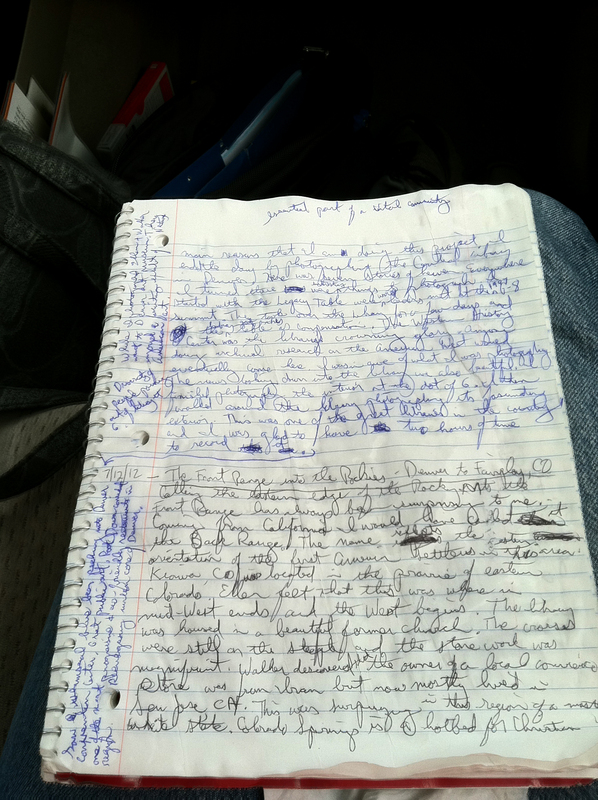 I will also let you know the progress of the book. Until then, happy trails. And give your local librarian a hug. 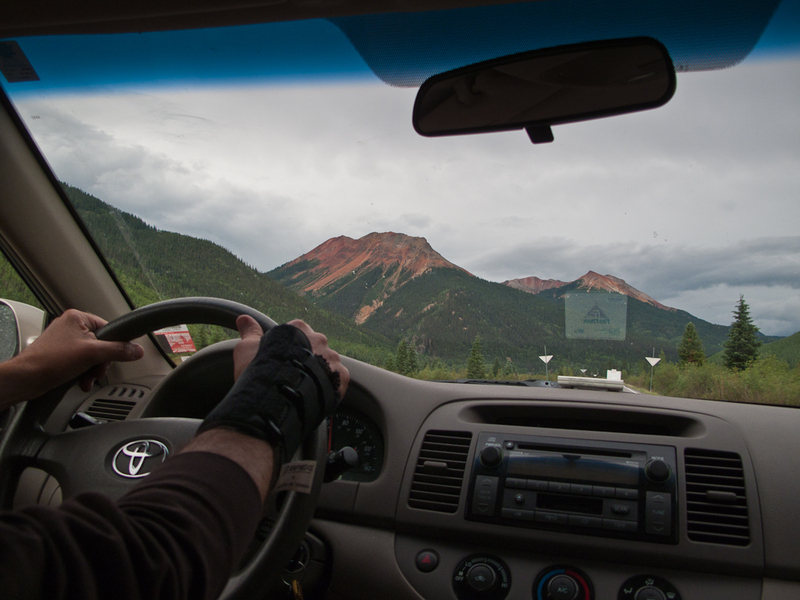 7/12/12 – Calling the eastern edge of the Rocky Mountains the Front Range has always been surprising to me. Coming from California I would have called it the Back Range. The name reflects the Eastern orientation of the first American settlers in the area. 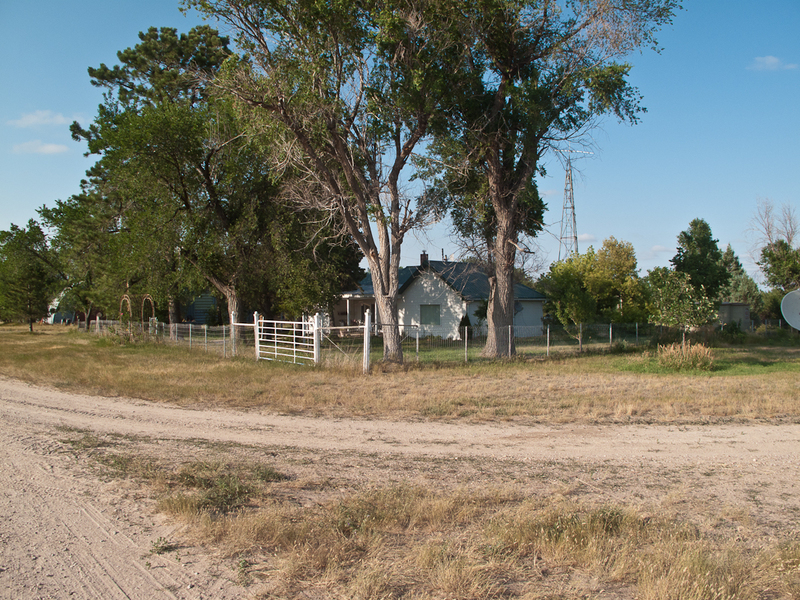 Kiowa, CO was located in the prairie of eastern Colorado. Ellen felt that this was where the mid-West ends and the West begins. The library was housed in a beautiful former church. The crosses were still on the steeple and the stonework was magnificent. Walker discovered that the owner of a local store was from Iran but now mostly lived in San Jose, CA. This was surprising in this region of a mostly white state. 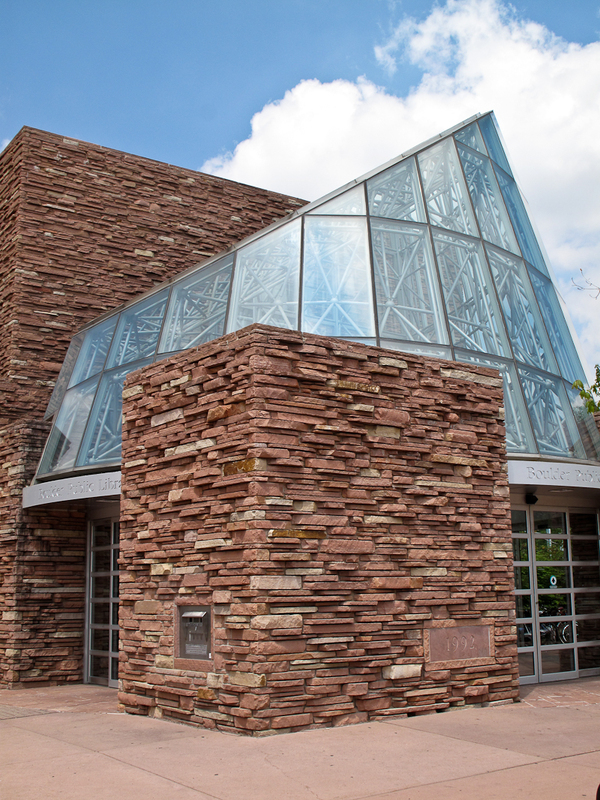 Colorado Springs, CO is a hotbed for Christian conservatism. Years ago the town leaders wanted to diversify the economy from its dependence on the military. They invited in a conservative Christian mega-church that wound up being a magnet for like-minded people. We met our friends from Minneapolis, JoAnn Verberg and Jim Moore, in a great little café in Colorado Springs. 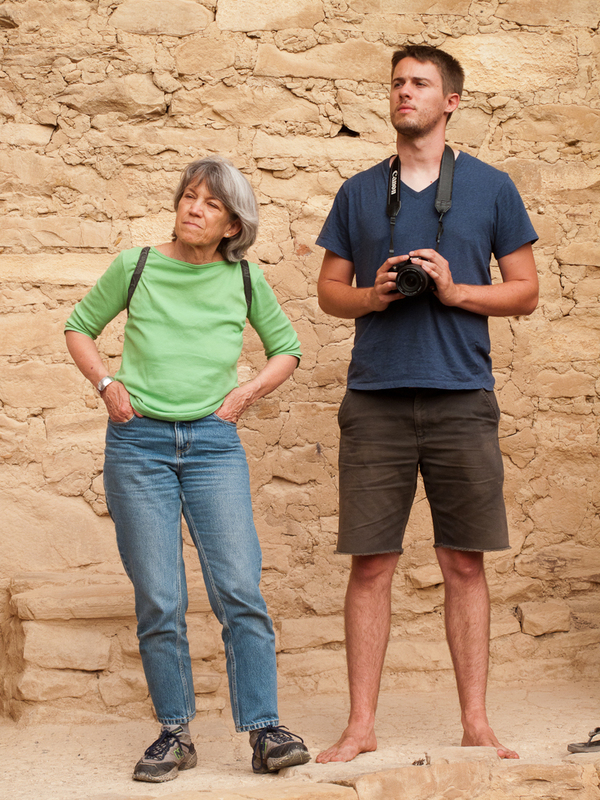 JoAnn was one of the three principle members of the Rephotographic Survey Project along with Ellen and Mark Klett. 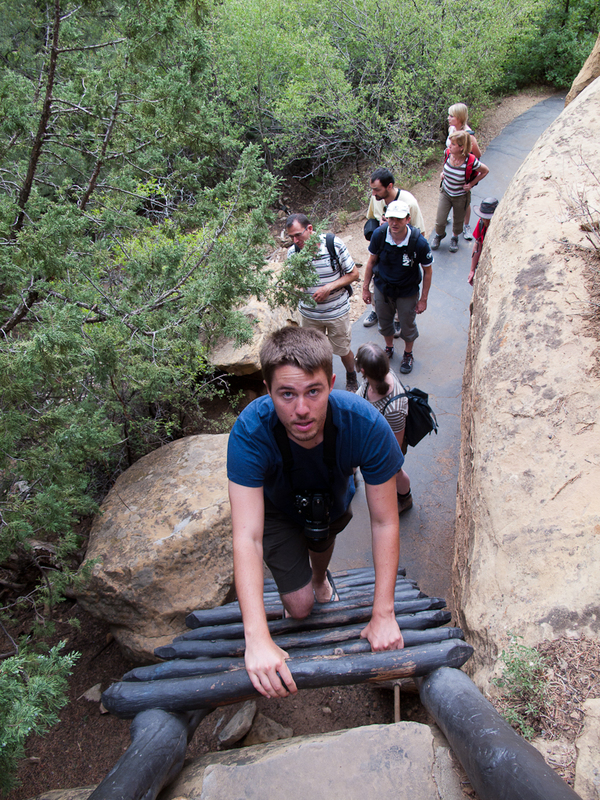 We went to one of their rephotographic sites in the beautiful Garden of the Gods State Park. 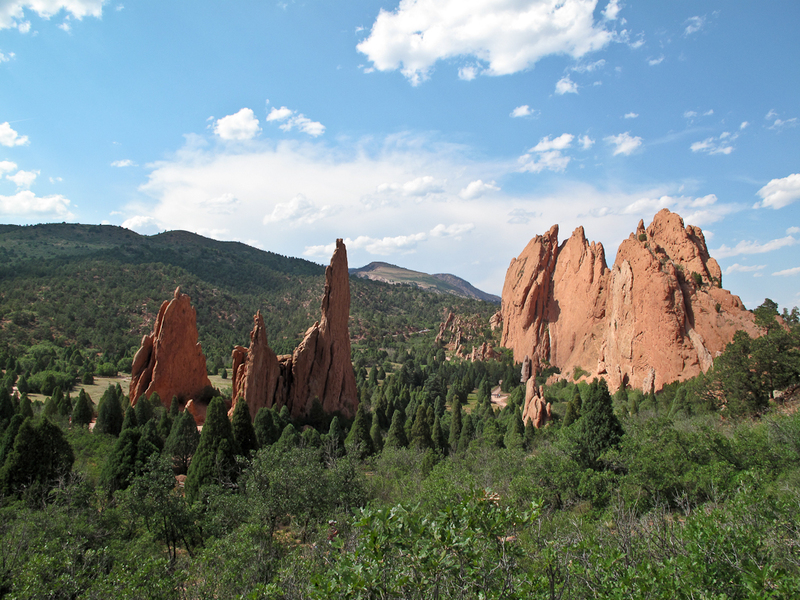 This area had incredible uplifted sandstone rock formations that contrasted nicely with the nearby Rockies. 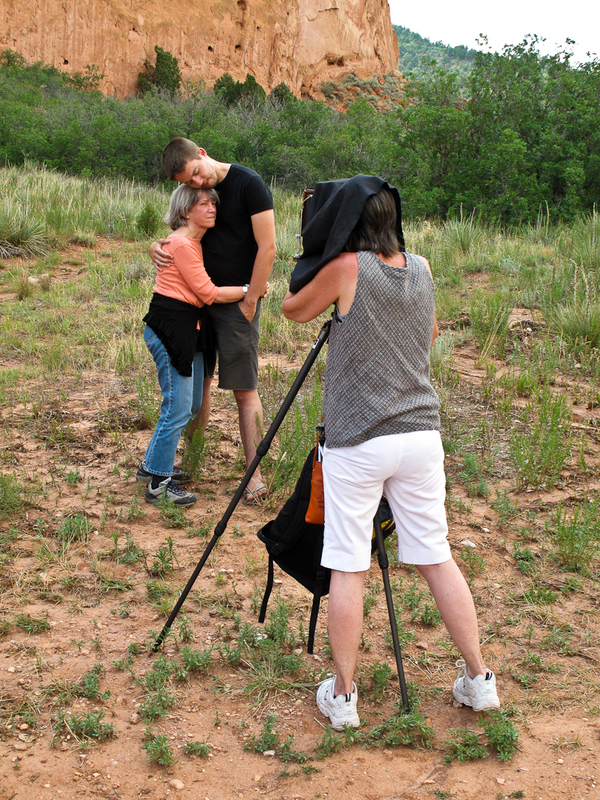 JoAnn set up her 5X7 camera by the side of the trail and did a diptych portrait of our family with the red cliffs as a background. 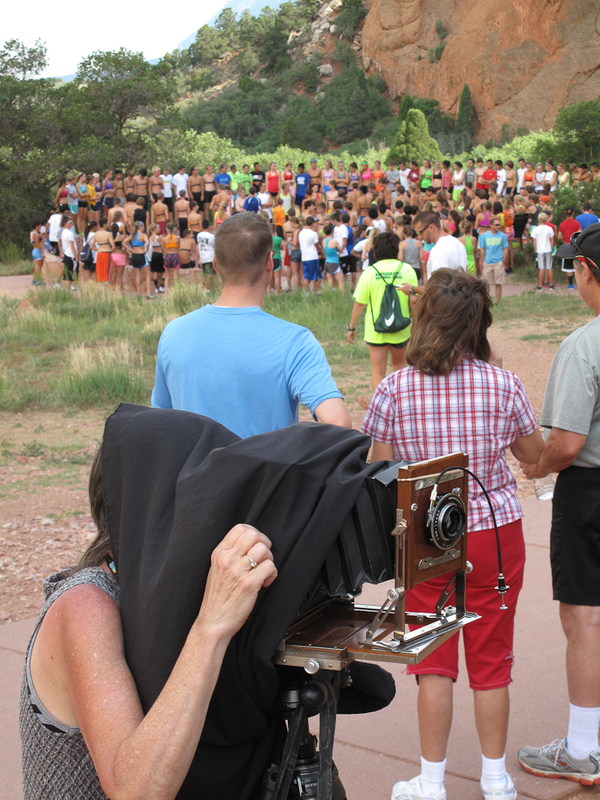 As she was setting up the camera and posing us 192 cross country runners from all over the country came by in their multi-colored running gear. As they posed for their portrait we posed for ours. After we left JoAnn and Jim we drove west into the Rockies under a darkening sky. 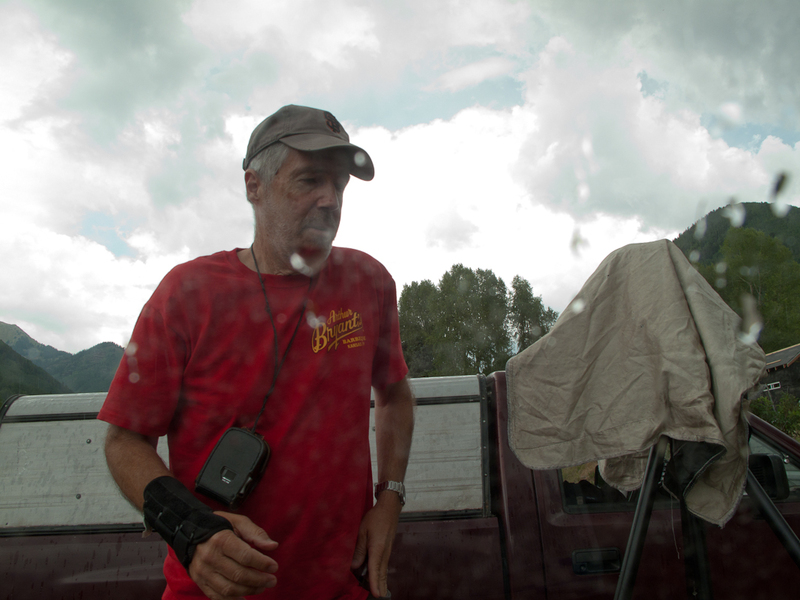 By the time we got to Hartsel, CO it was just about to rain. The old looking library was beautiful in the gray light with the red clouds glowing off in the distance. I made the last shot just as the rain began to fall. Fairplay, CO was located high in the mountains almost at 10,000 feet. I was stunned at the beauty of its tall, old library. I scrambled to set up the 4X5 in the last light of dusk. The automatic lights went on in the closed library as I made my last shot. We drove on in the dark and landed in the mountain town of Buena Vista, CO.
7/13/12 – Ellen lived in Colorado during the 1970s. Since that time many of the quaint, funky mining towns of the area had changed, sometimes drastically. 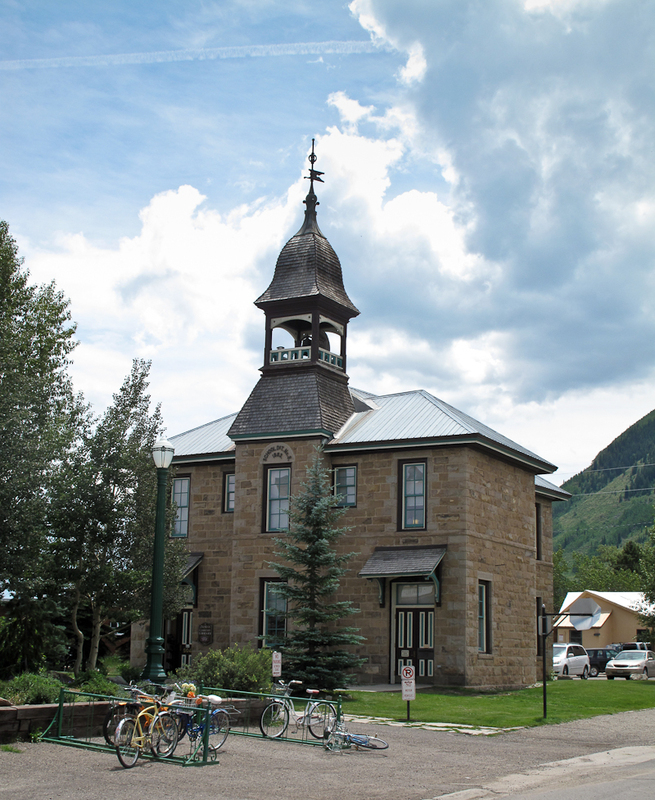 Crested Butte was a case in point. It was almost abandoned in the 70s with dirt streets and tumble down stores. Because of that it possessed a great deal of charm and character. Ellen almost cried when she saw it again today. It really had become a theme park of an old mining town. 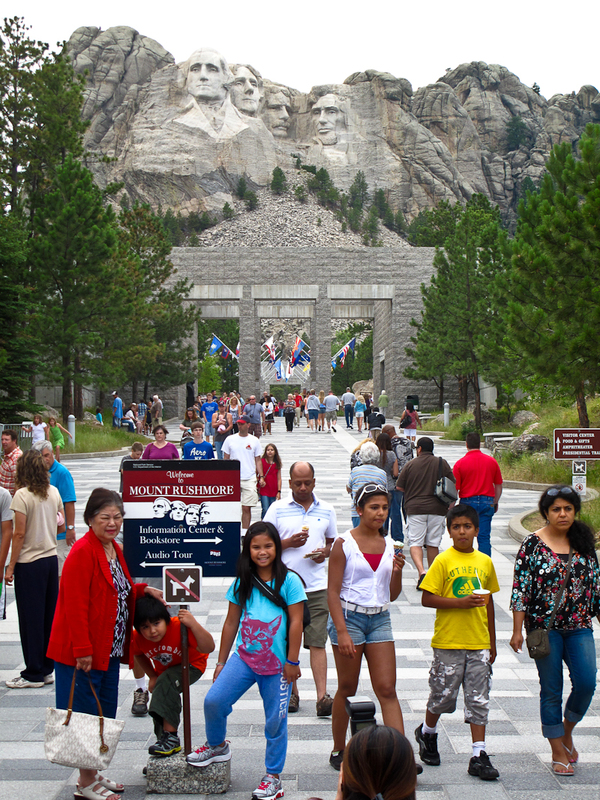 It was jammed with tourists who were mostly middle and upper middle class and all white. What had once been interesting was now replaced by made-safe-for-the-tourists blandness. 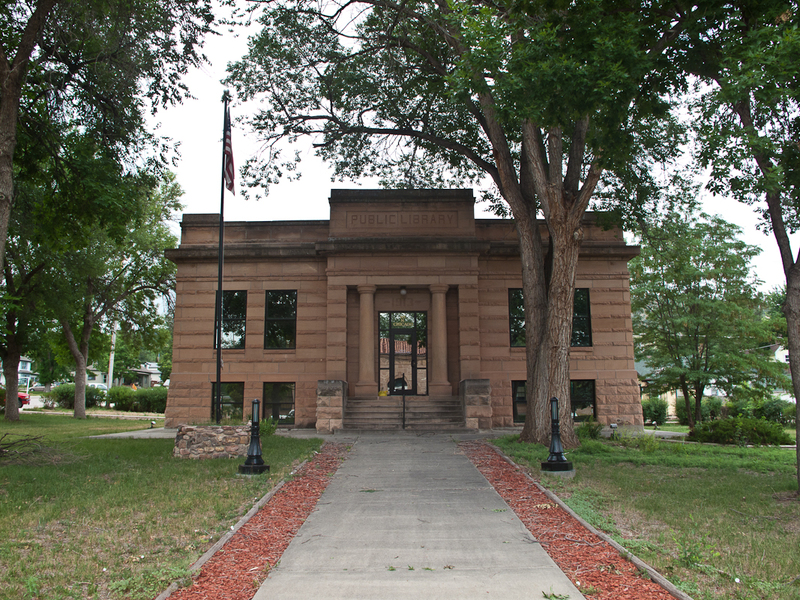 The library was one of the few buildings in town that retained its original character. It seemed real as opposed to the fantasy of the rest of the town. I set up my 4X5 outside. Just as I clicked the shutter a homeless guy wandered into the frame, two young women continued what seemed like an endless conversation and a guy on a mountain bike zoomed by. It may make for an interesting photograph. Crested Butte was out of our way so we had to quickly move on to our next stop. 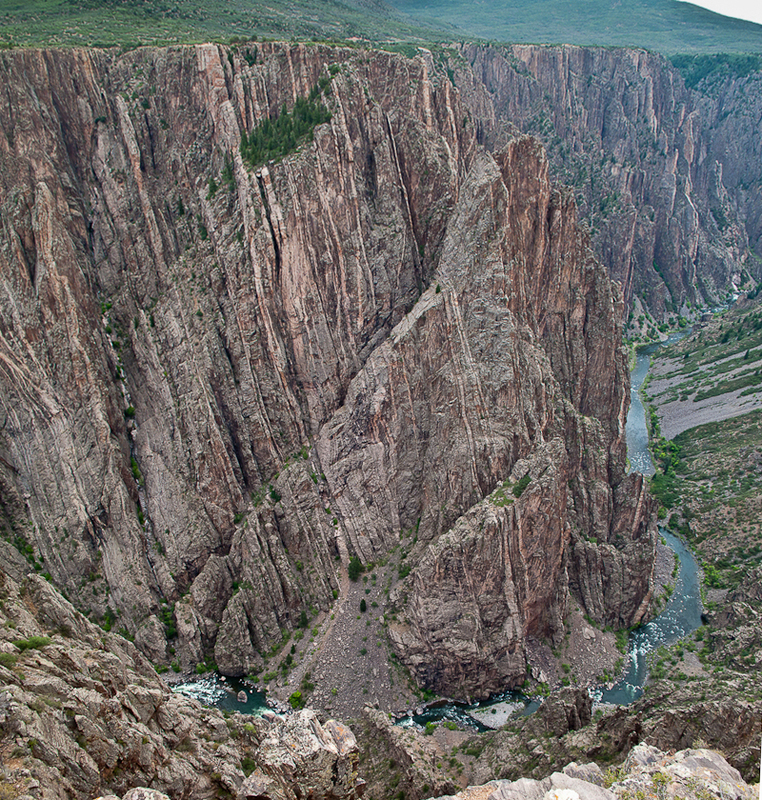 The Black Canyon of the Gunnison was an outstanding natural landmark in an area full of them. 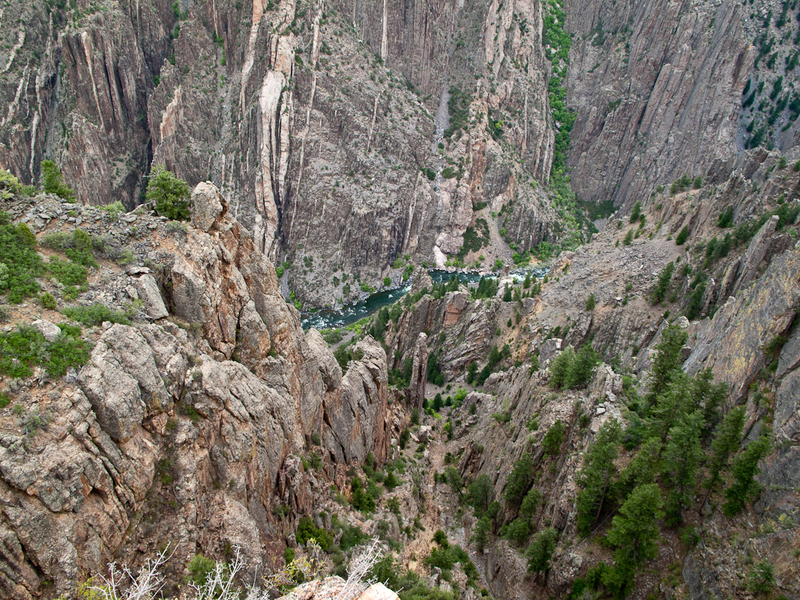 We peered down 2,000 feet to the canyon floor with the fast-flowing Gunnison River looking like a silver sliver. 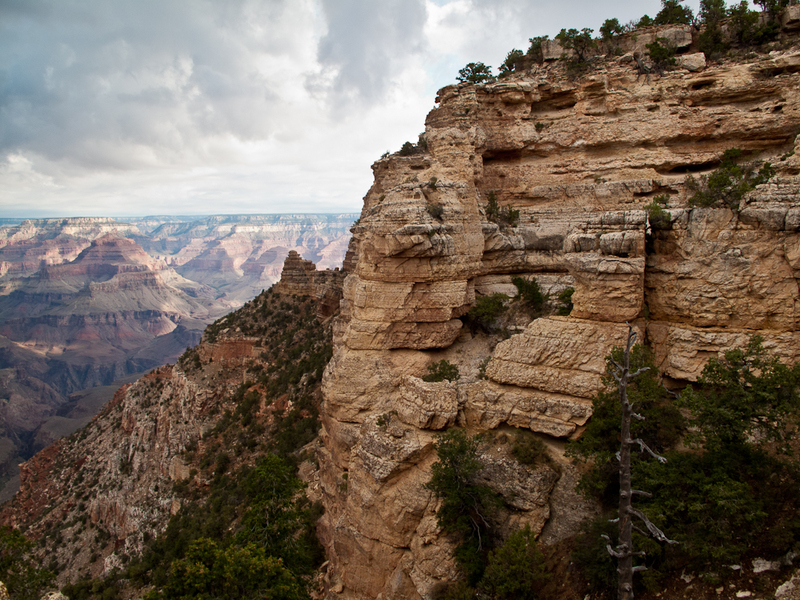 Geologist Wallace Hansen wrote “Some are longer, some are deeper, some are narrower, and a few have walls as steep. 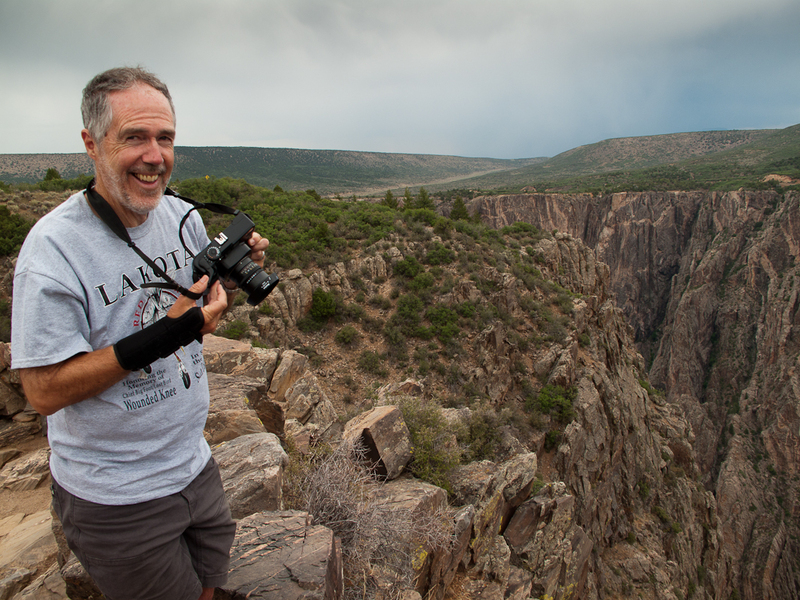 But no other canyon in North America combines the depth, narrowness, sheerness and somber countenance of the Black Canyon of the Gunnison.” We were overwhelmed by the beauty of the place and spent far more time here than we had planned. 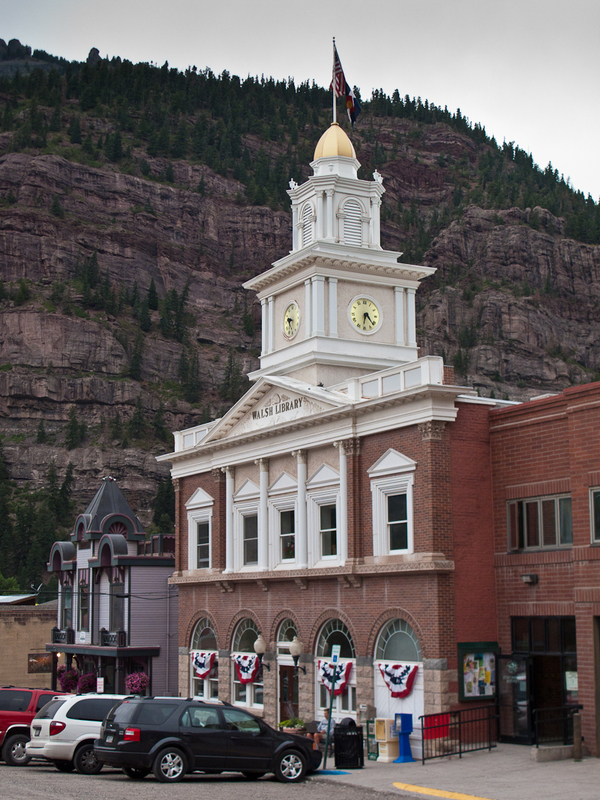 After a long drive we arrived in the old mining town of Ouray, CO. Like Crested Butte it had become a tourist town. But as Walker explained it didn’t matter because the setting was so spectacular. On top of that the library with its beautiful steeple was one of the best of the trip. I had a hard time doing it justice with my 4X5 camera. The light was flat, it was starting to rain and we were in a hurry. Hopefully, I got something good. Shooting film means that you never know what you captured until the end of the trip. Then it is like opening presents at Christmas. 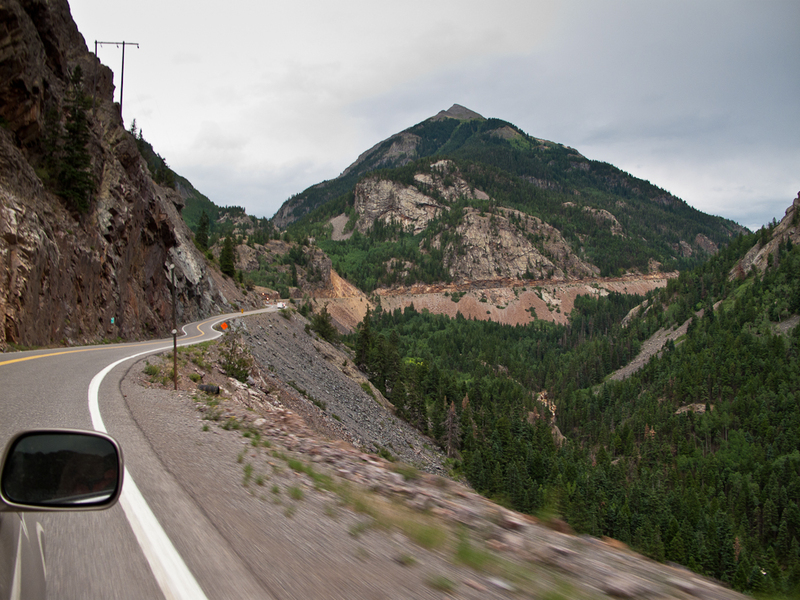 After Ouray we immediately started up the “million dollar highway” to the 11,000 foot Red Mountain Pass. 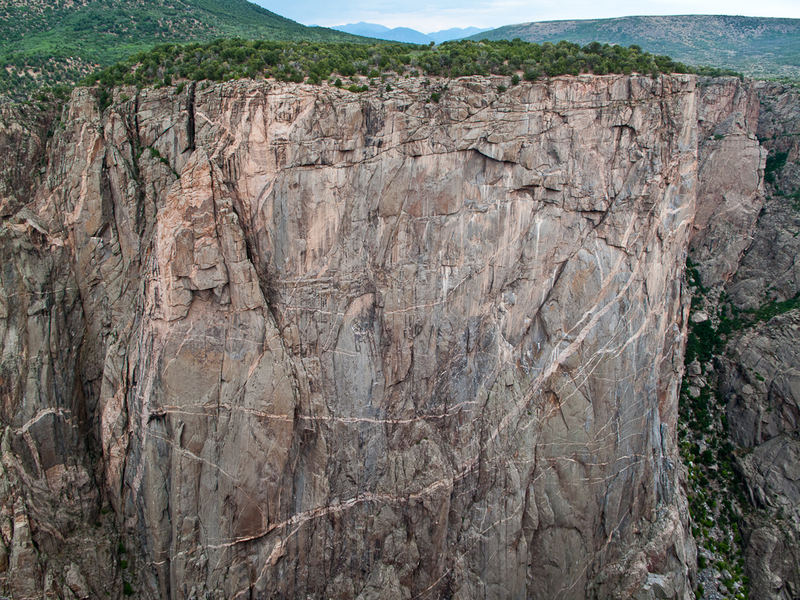 Sheer drops, granite walls, fading light and a rainstorm greeted us as we climbed up this incredible road. The drive was both terrifying and thrilling producing feelings of vertigo along the way. 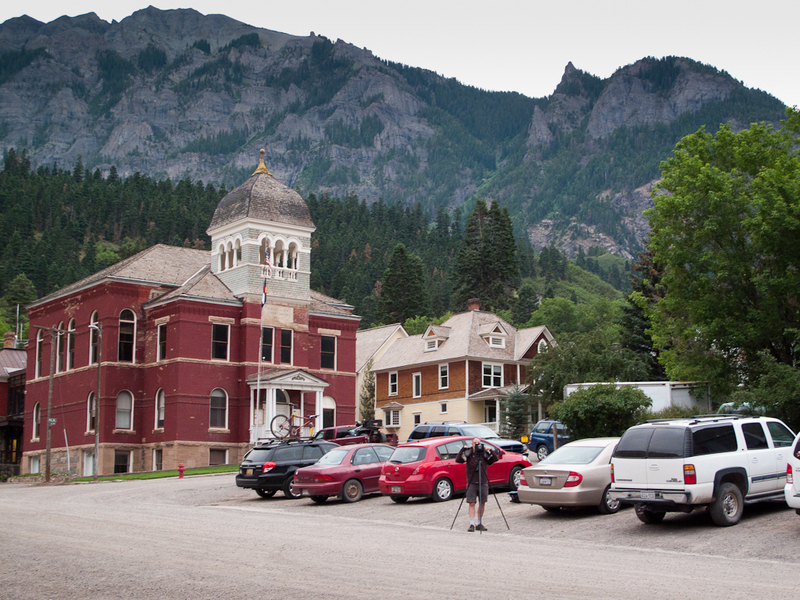 We eventually made it to the very cool mining town of Silverton. In the last light with long exposures I tried to capture the town’s red brick library. I tried to place it in the spectacular setting but the most interesting photo may have been the Hispanic kids playing on the play structure in front of the library. The fast moving children and my one-second exposures may be interesting. Leaving Silverton we crossed over two more 10,000 foot passes in a light rain. We arrived in Durango, CO late, tired and happy after such a rich day of travel. 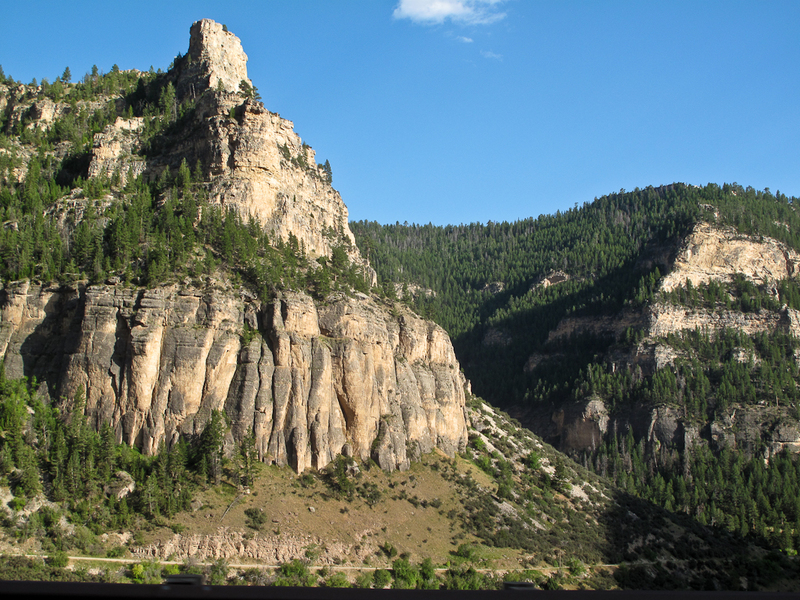 While eating green chili enchiladas and blue corn tortillas in Durango we felt like we had left the Rocky Mountains and entered the Southwest. 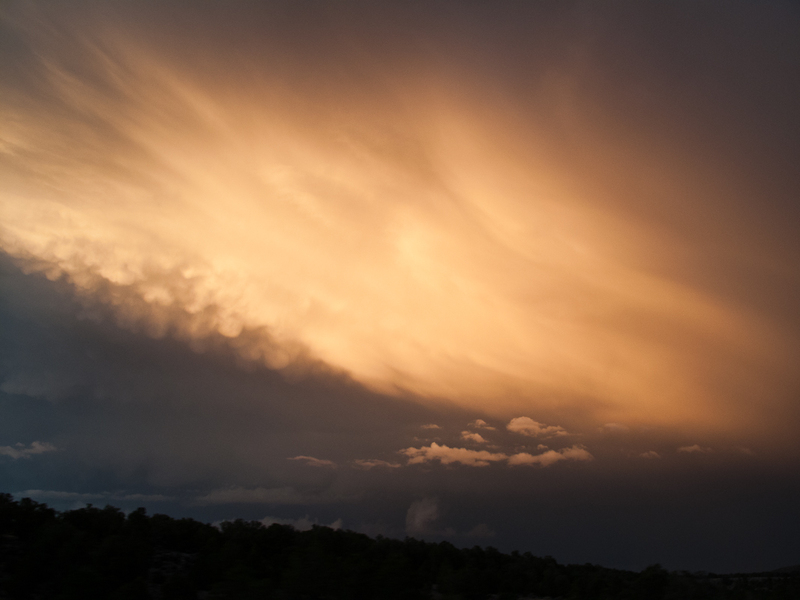 7/14/12 – Last night in Durango we felt like we had arrived in the Southwest. 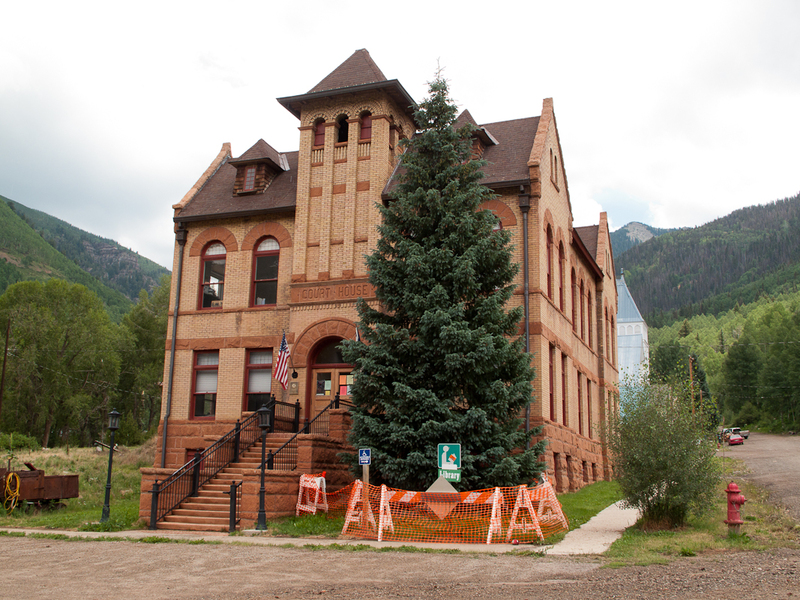 Today we went back to the high Rocky Mountains to visit the little mining-town of Rico, CO. Its Library/City Hall was again one of the best of the trip. Dramatic mountains rose high above us on all sides. The sky was getting darker as I set up my camera. After I took one photo the rain starting pouring down. 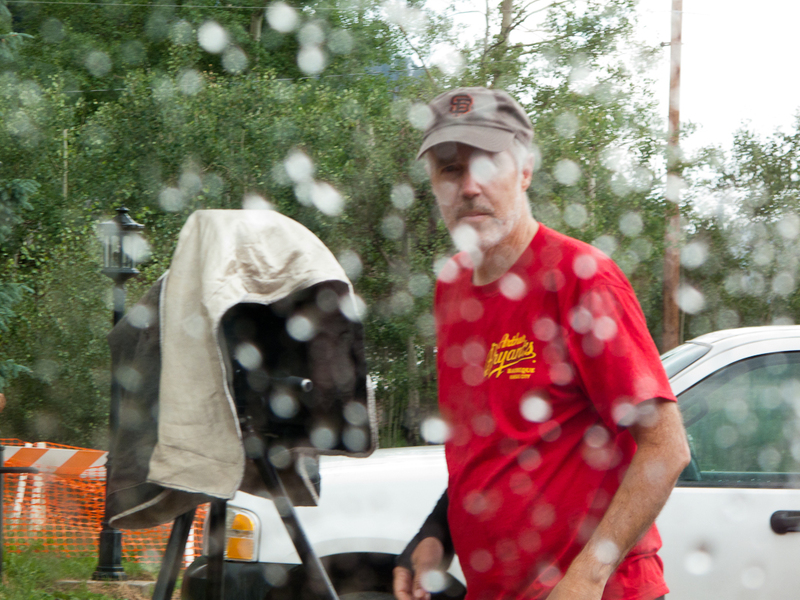 I scrambled to toss all of my equipment back in the car before it got soaked. 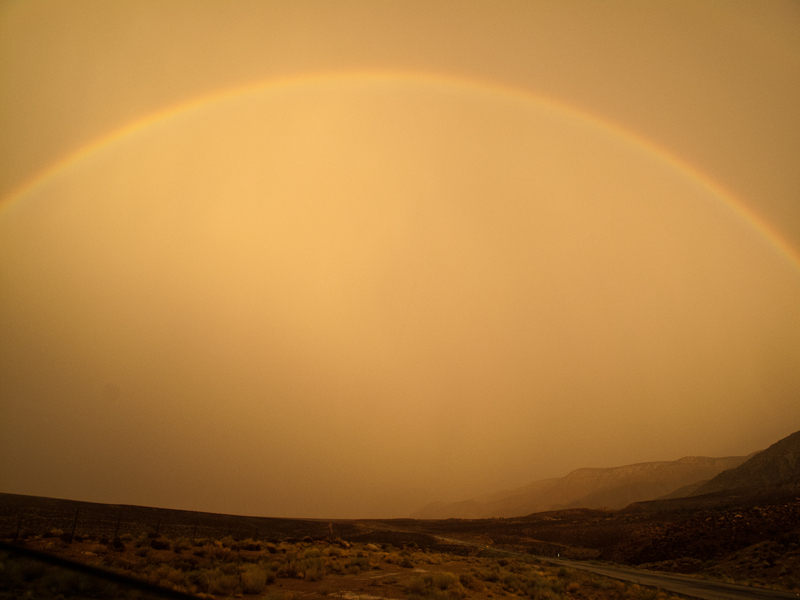 Two more times I got out to photograph and two more times the sky dumped. Eventually, I finished with the beautiful exterior and then went inside to photograph the interesting, small, dark library. As I did, I looked outside and noticed the rain coming down again in earnest. The library was built when Rico was a very rich boomtown. After the collapse of the mining industry here it fell on hard times. But it seemed to be struggling back while still retaining its unique character. We drove out of the mountains and back to the southwest. 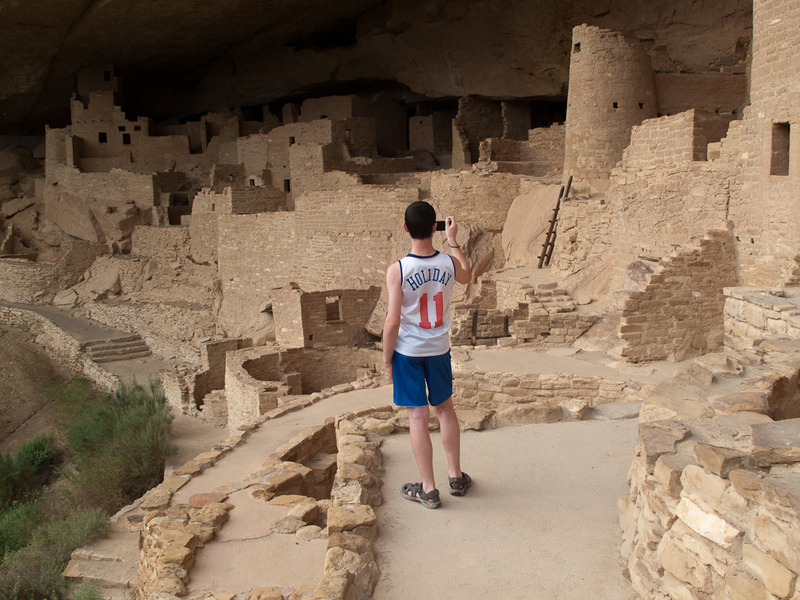 We spent the afternoon in Mesa Verde National Park. 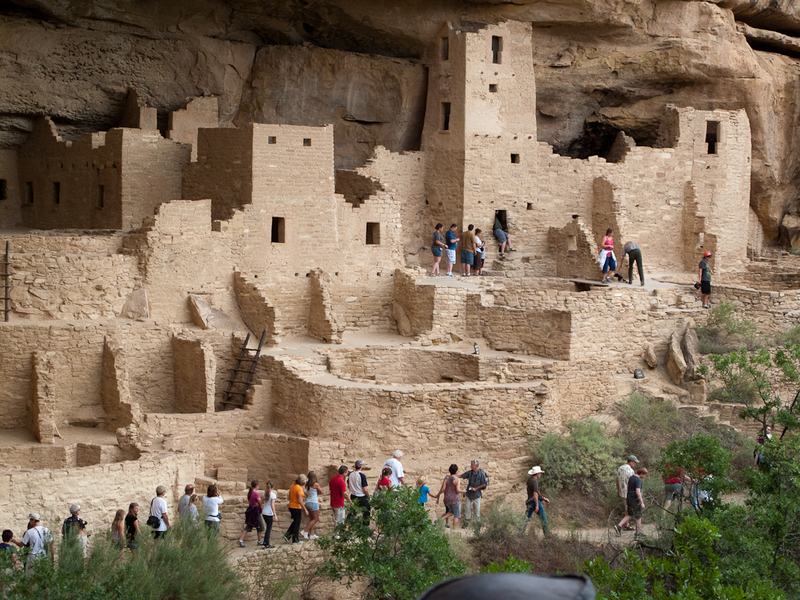 This area is home to the famous ancient cliff dwellings. Not much is known about them but the structures they left behind speak with a certain eloquence. They tell of a people adept at building, artistic in their crafts, and skillful at making a living from a difficult land. No one knows why they abandoned the area in the late 1200s. Perhaps, like Cahokia in Illinois these Ancient Puebloans overused their natural resources or left because of extended drought. 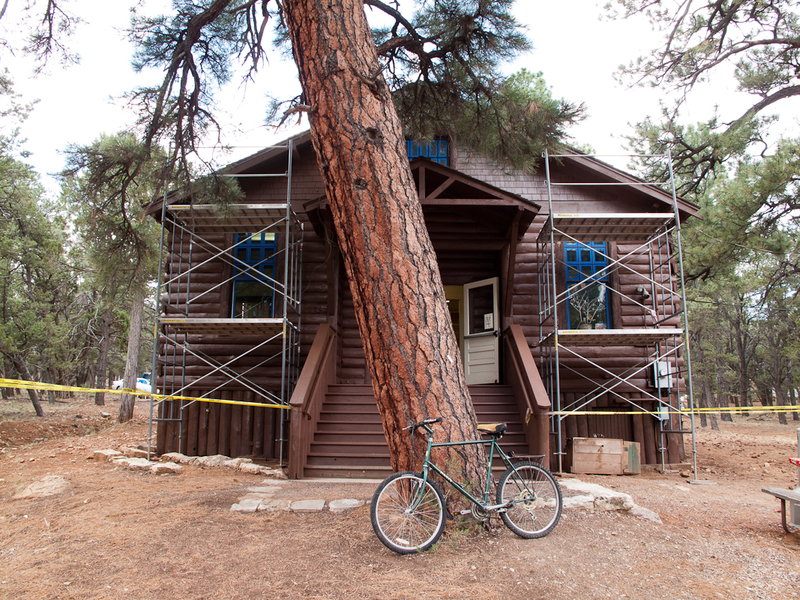 We did a self guided tour of the Spruce Tree House, the best preserved of the ancient structures. 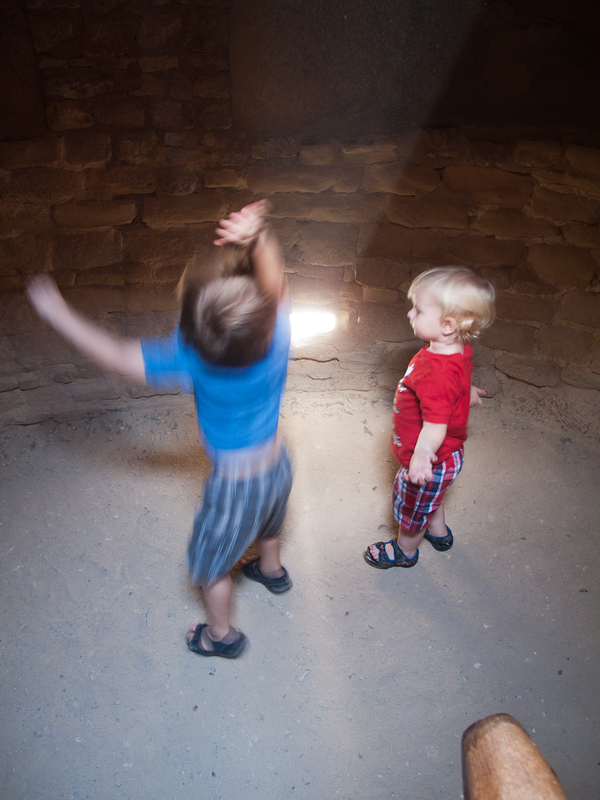 Later, we thoroughly enjoyed the hour long, ranger led tour of the Cliff Palace, the largest of the cliff dwellings. We ran out the clock on the daylight, dashing from site to site until dark. 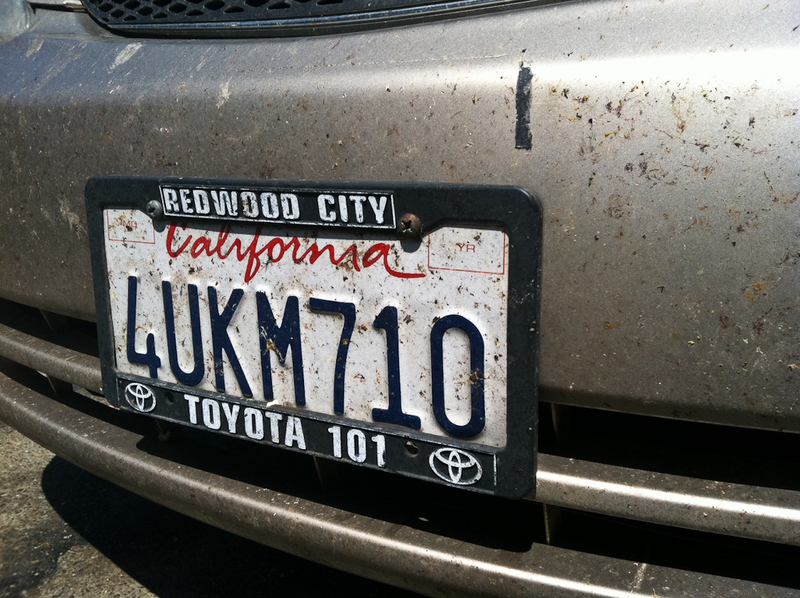 7/9/12 – Lander was a delightful Western town. It had a great main street with a good coffee shop. 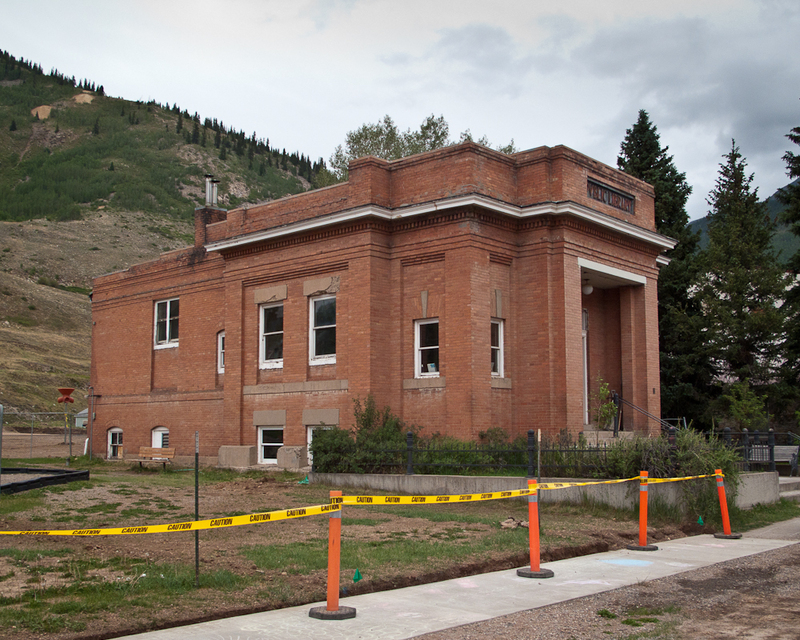 Its Carnegie library had a new addition that divided it into old and new. 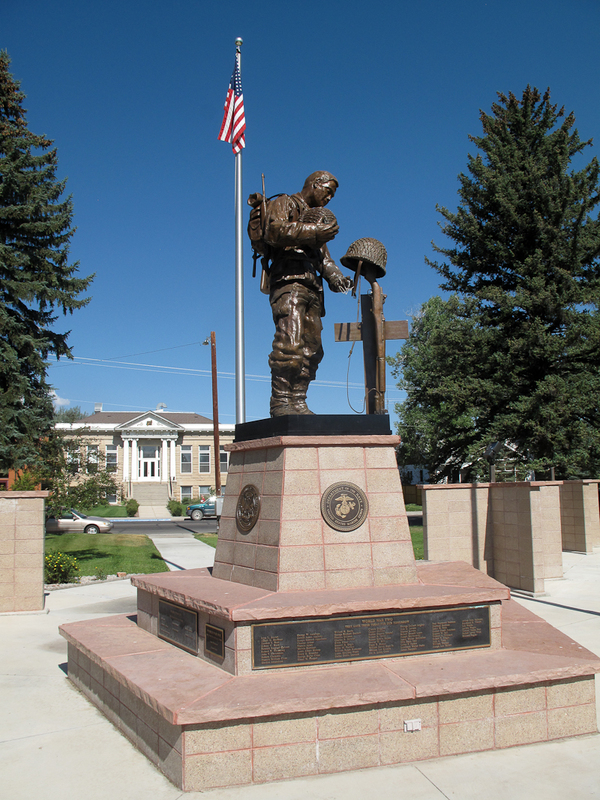 I photographed the Veteran’s Memorial across the street with the library in the background. 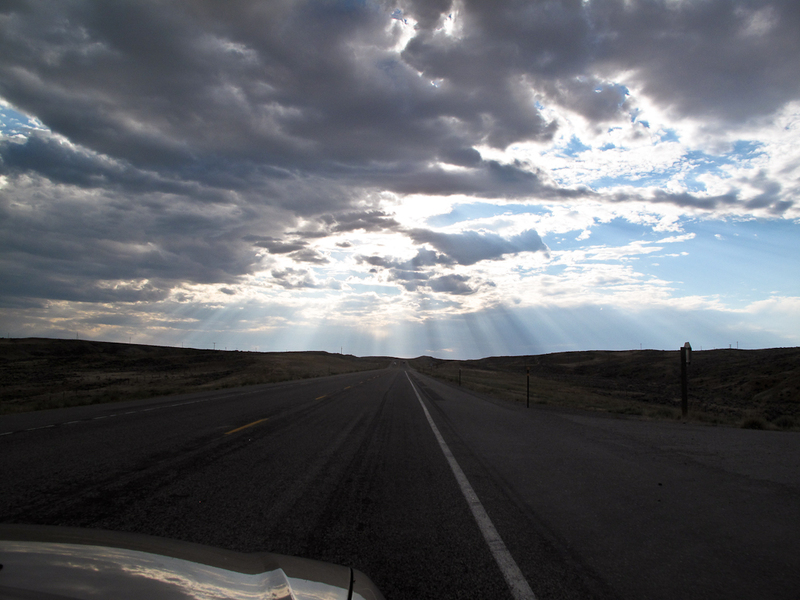 We drove on into Wyoming’s awesome open space. 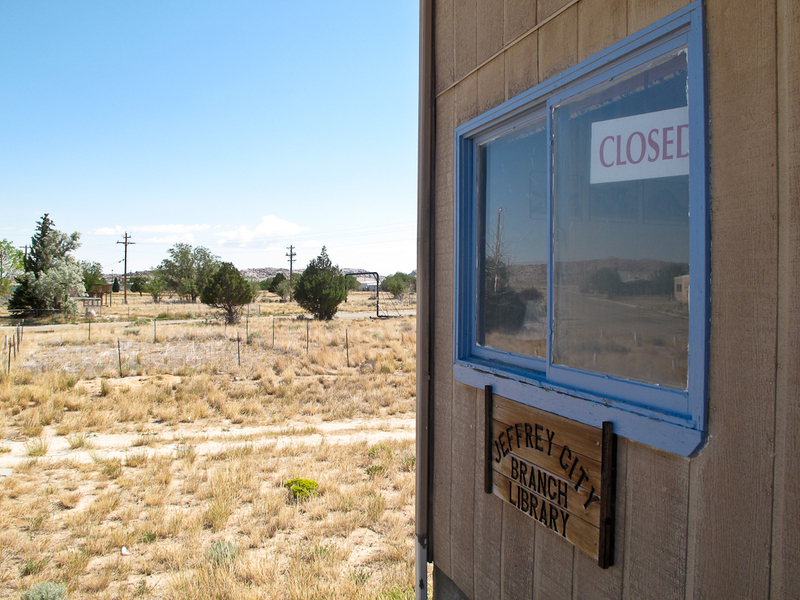 During our research we had discovered an abandoned library in the abandoned town of Jeffrey City, WY. 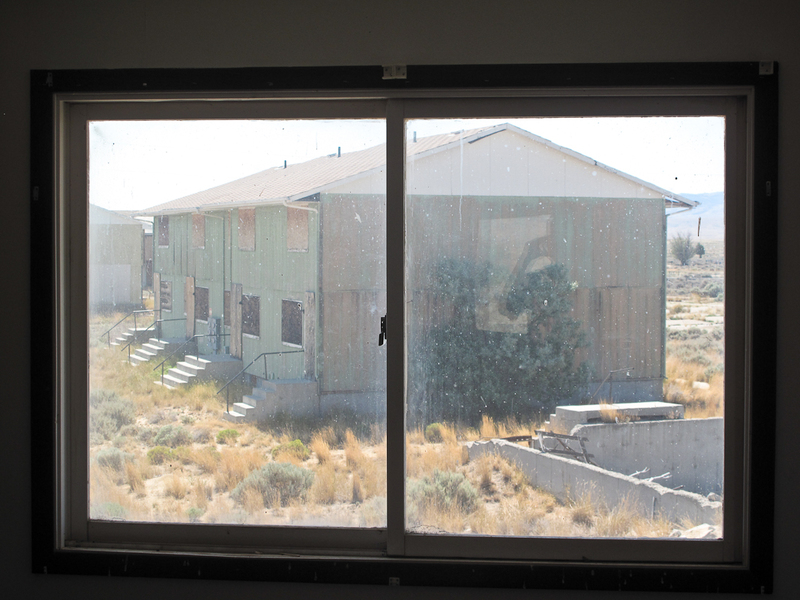 The town had formerly housed uranium miners and the empty library was in a ghostly, Soviet looking apartment block. 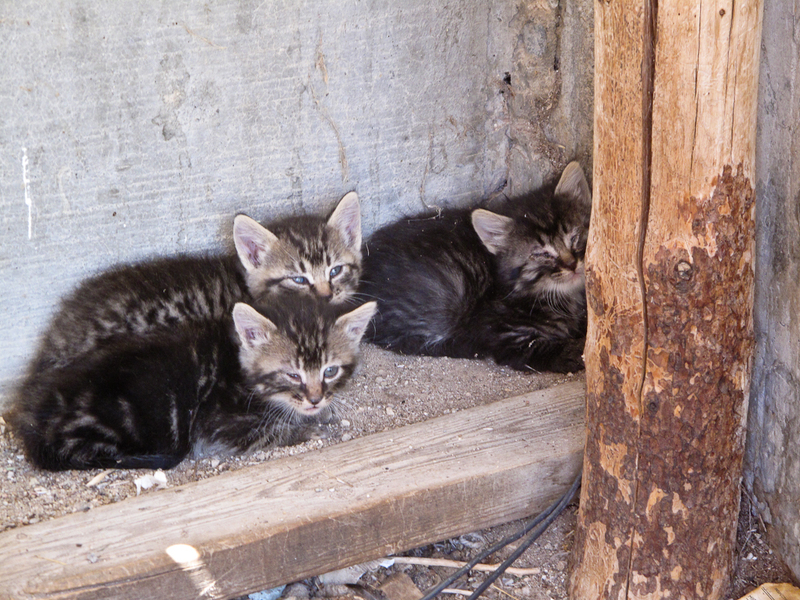 Feral cats and kittens were everywhere. While I photographed the library Walker photographed the adorable kittens. Hopefully they won’t starve. 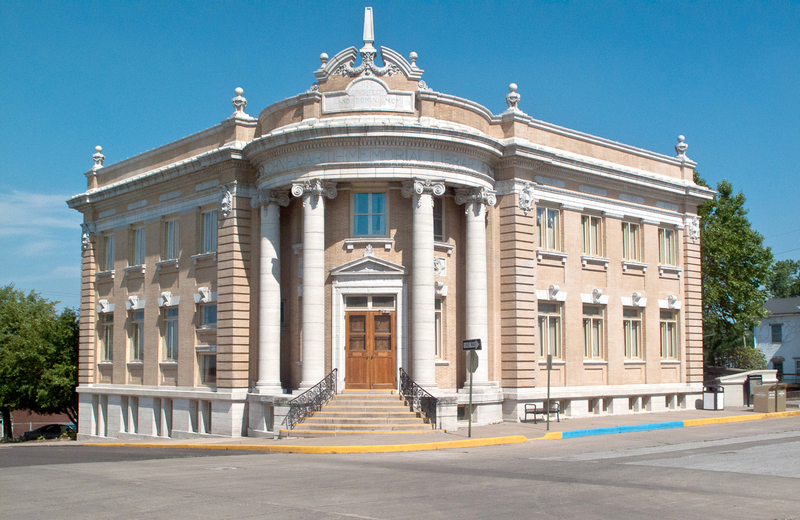 Walker and I debated whether or not to go out of our way to photograph one really good library in Lusk, WY. We decided to take a more direct route. 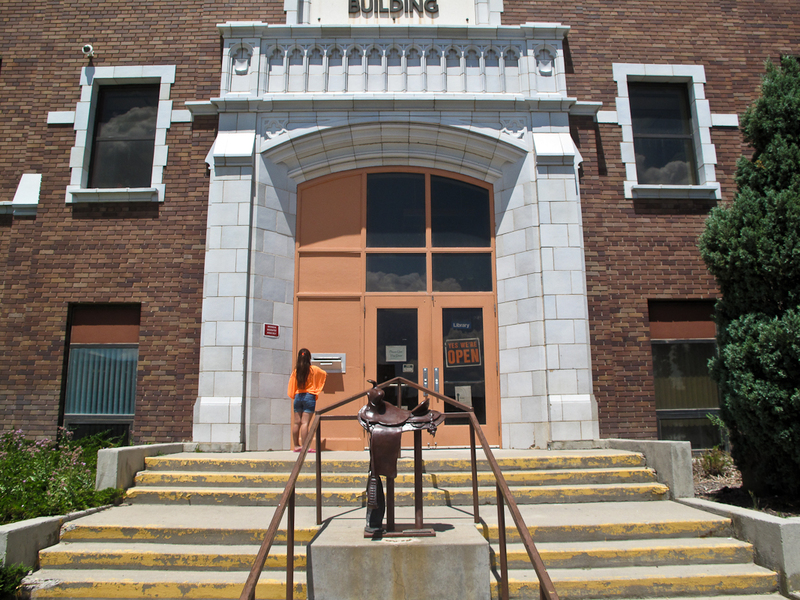 I quickly photographed the library in Rawlins, WY with its great sculpture of a saddle in front. Sinclair, WY was an oil town with a huge refinery in its center. It’s small library was very nice, no doubt because of the oil money. The last library of the day no longer existed. 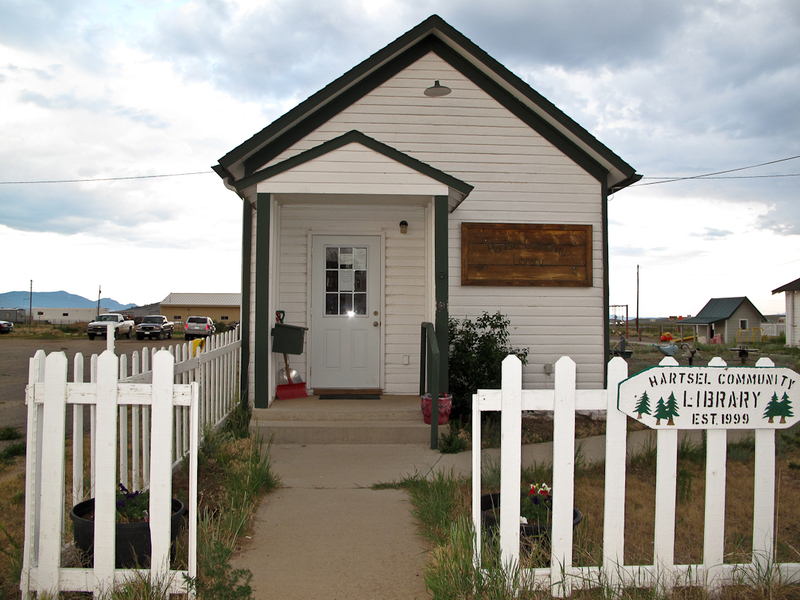 We had researched the tiny library in the tiny town of Bosler, WY. When we finally arrived in town we asked where was the library. 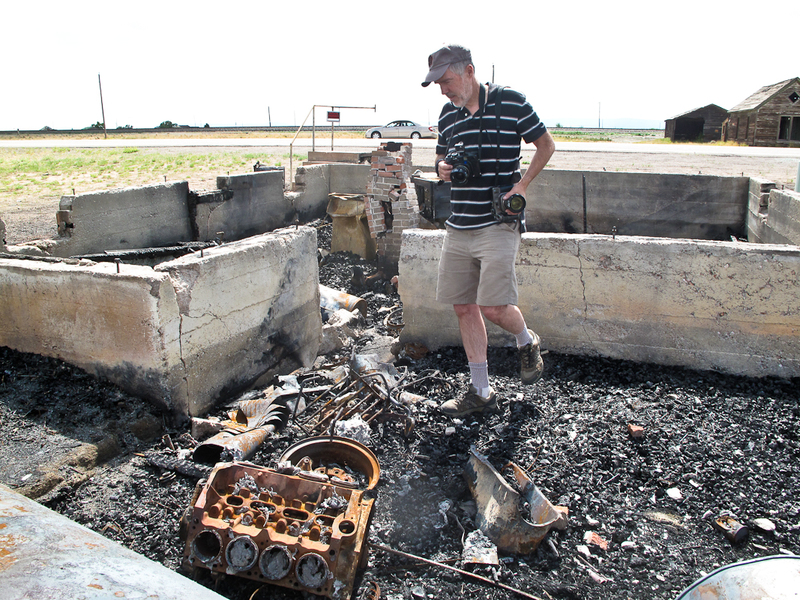 We were told that it had burned down two weeks ago. I photographed the charcoal remains. 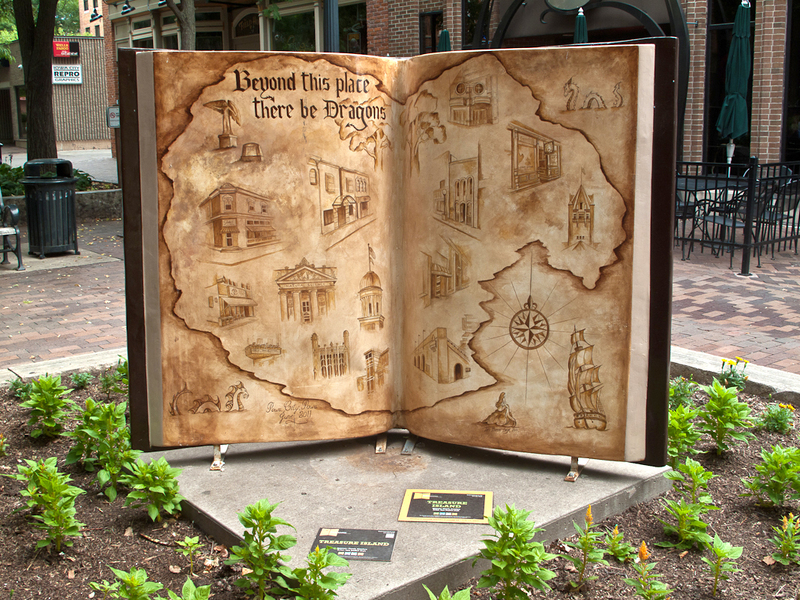 I even hauled out my 4X5 camera to photograph a beautiful but forlorned burnt book. We ended the day at the Chautauqua in Boulder, CO. Everyone there seemed perpetually drunk on happiness and soon we were too. What a delightful place? 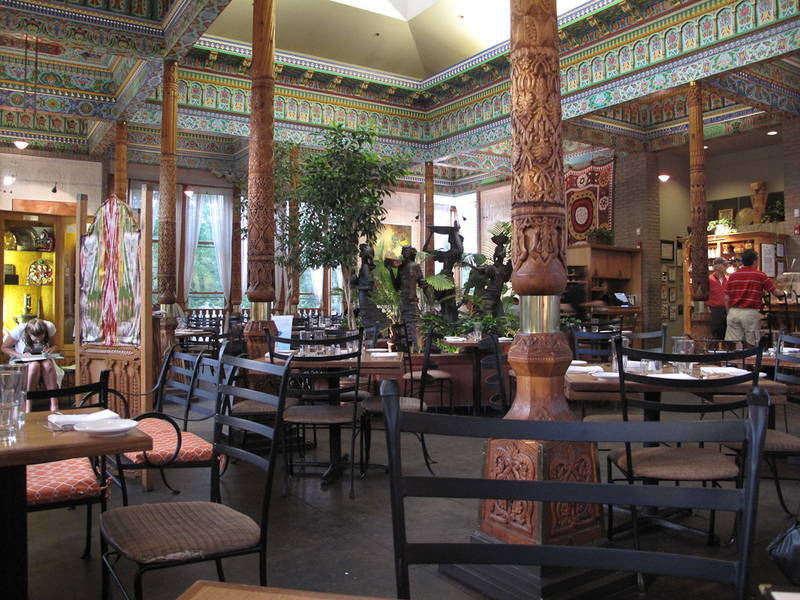 We had dinner at the famous restaurant Boulder Duchambe Tea House. It was a gift from the city of Duchambe in Tajikistan. We then walked to the amazing Book Store. 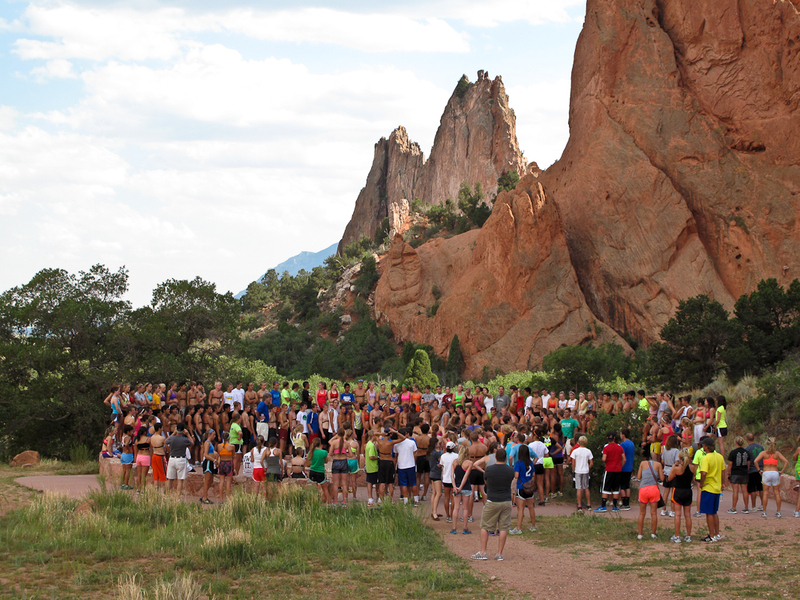 Boulder rocks! 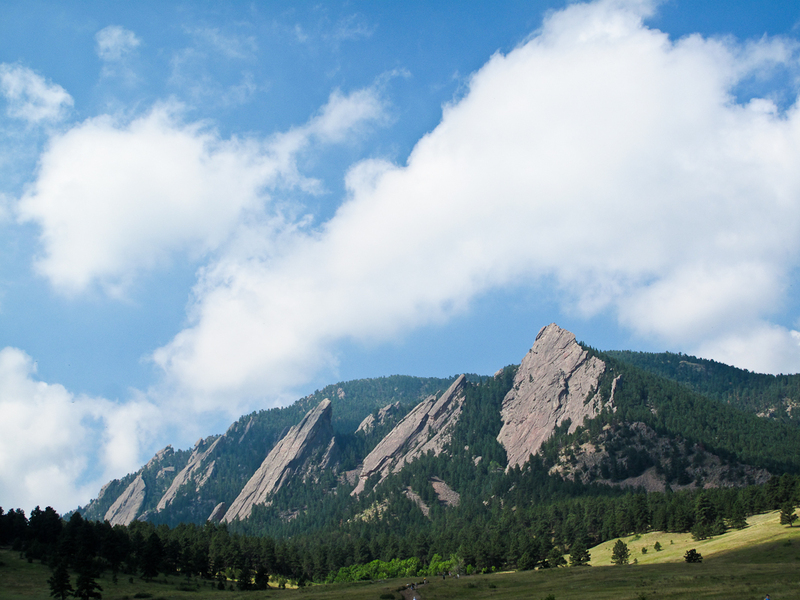 7/10/12 – It was difficult to leave Chautauqua. I could have spent weeks in this wonderful place. 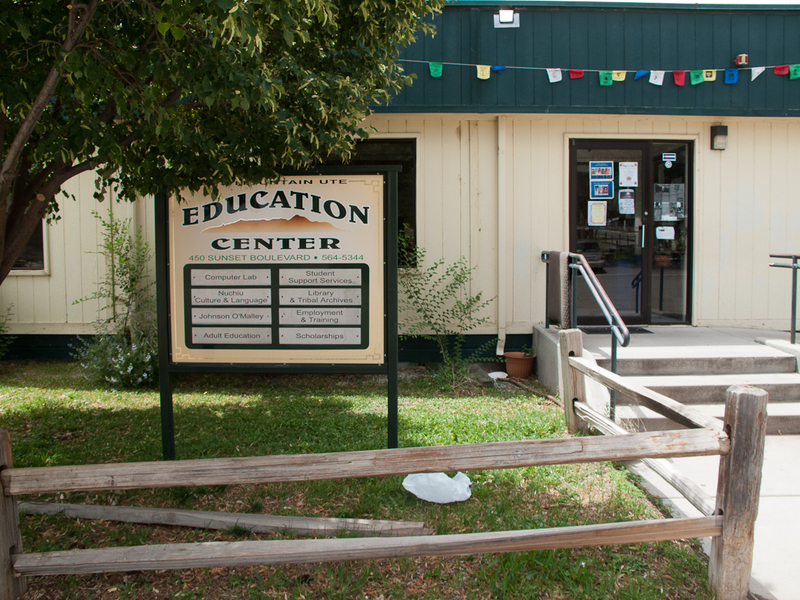 I photographed two libraries in Boulder. 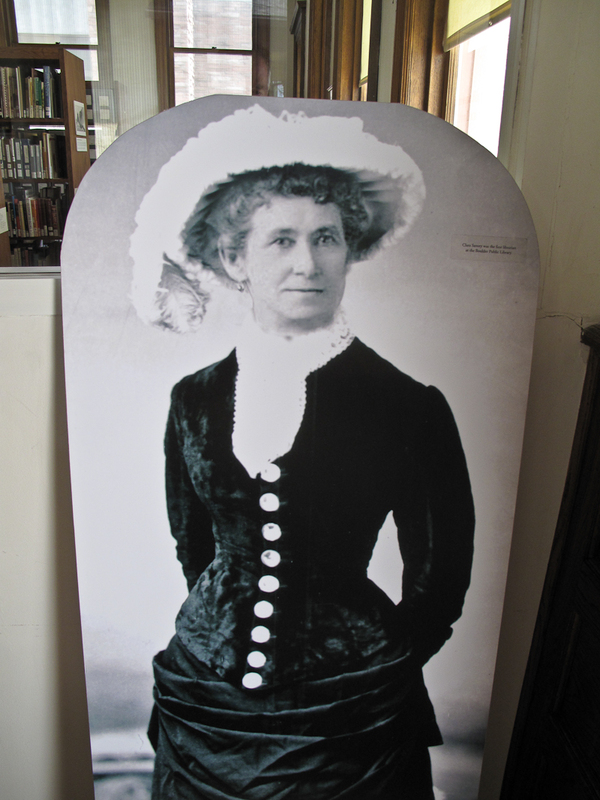 The Carnegie library was a history and family archive center. It felt good to have these Carnegies begin to feel familiar. Because of this I know that I am getting near the end of this project. 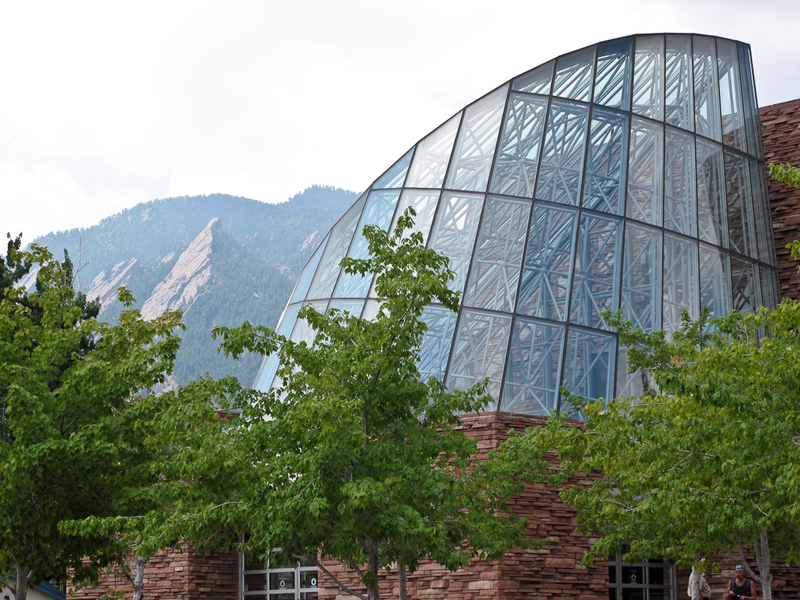 The new Boulder Library was very cool and the outside had features that echoed the shape of the nearby Flatiron Mountains. The interior was quite beautiful as well. 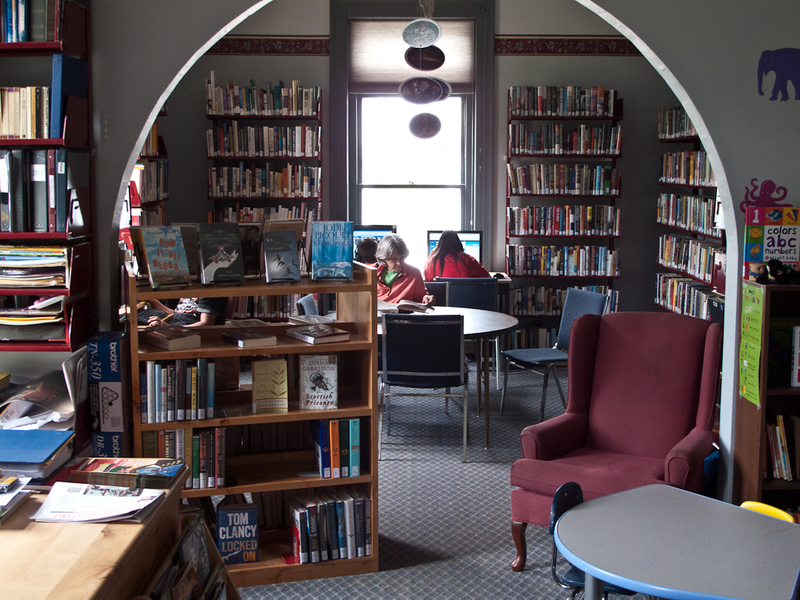 Like most libraries that we have seen on our library road trips, this one was packed. We drove to Golden, CO to meet Ellen who had flown in earlier from San Francisco. We stayed with Ellen’s old friend Stephanie Machen who treated us to a fabulous home-cooked meal. 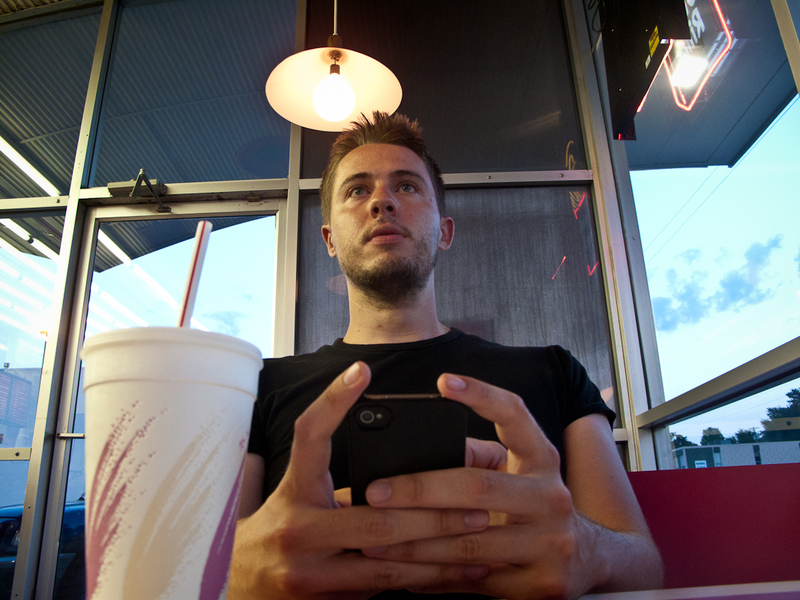 We spent the evening enjoying Denver’s sophisticated nightlife. 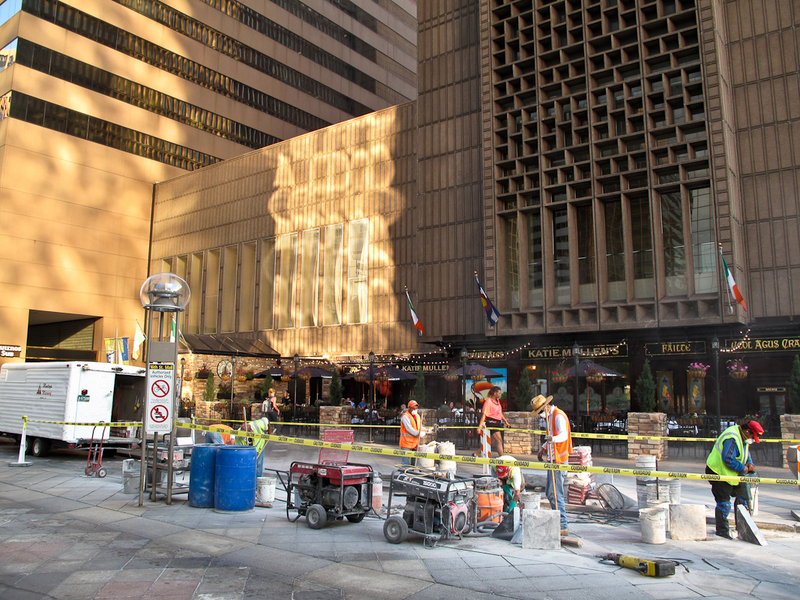 Downtown Denver is going through an exciting revitalization. The streets were crowded with a whole range of people that night. It was quite exciting for us to see after the mind-numbing uniformity of Denver’s outlying sprawl. 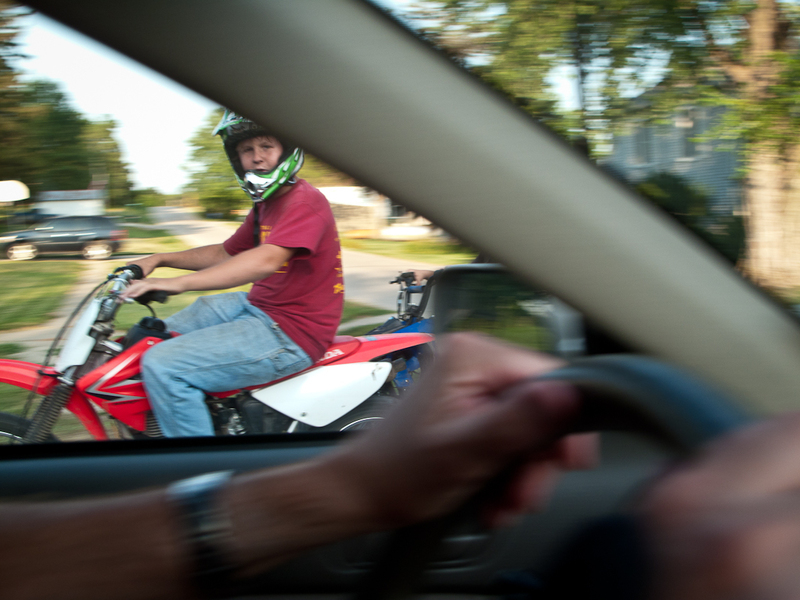 Walker and I had seen this urban-suburban divide in many cities throughout the nation. Later that evening while sleeping in Golden I was awakened by the howl of a Bobcat outside our window. 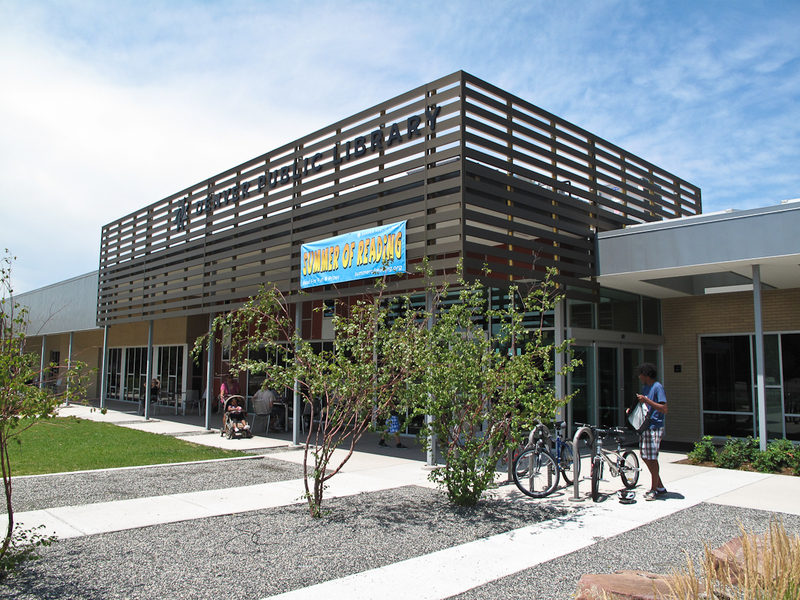 7/11/12 – The Green Valley Ranch Branch library was in Denver but near the endless sprawl of the prairie. It was two weeks old and on the first day 15,000 people applied for library cards. When we were there it was insanely crowded. Surprisingly, the demographics were mostly black and Hispanic. 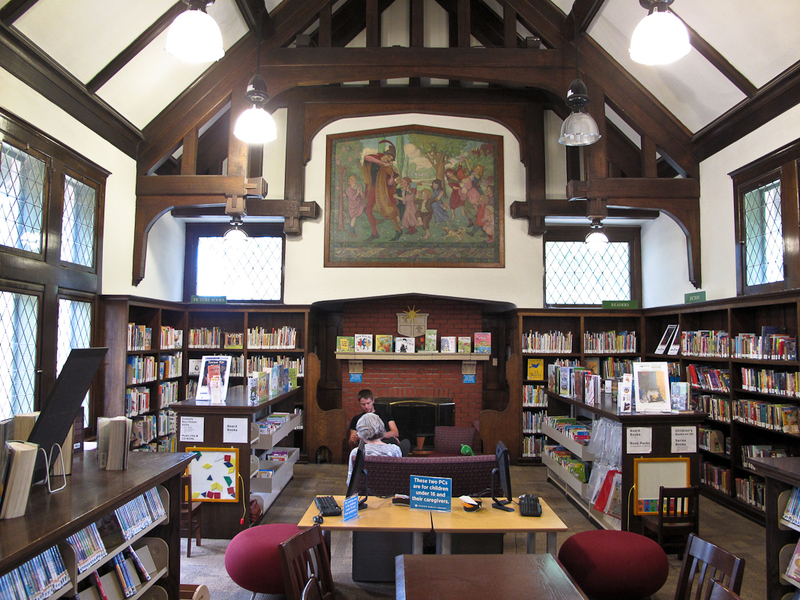 The next branch library that we visited was the Decker branch. Unlike the last library this was an unusual, old Carnegie library. It was a treat to photograph because it was so beautiful and complex. I had a nice conversation with the enthusiastic librarian. She explained their tenuous funding and the nail-biter of an upcoming election that will decide the fate of many librarians’ jobs. I have had depressing conversations like this with many librarians across the country. 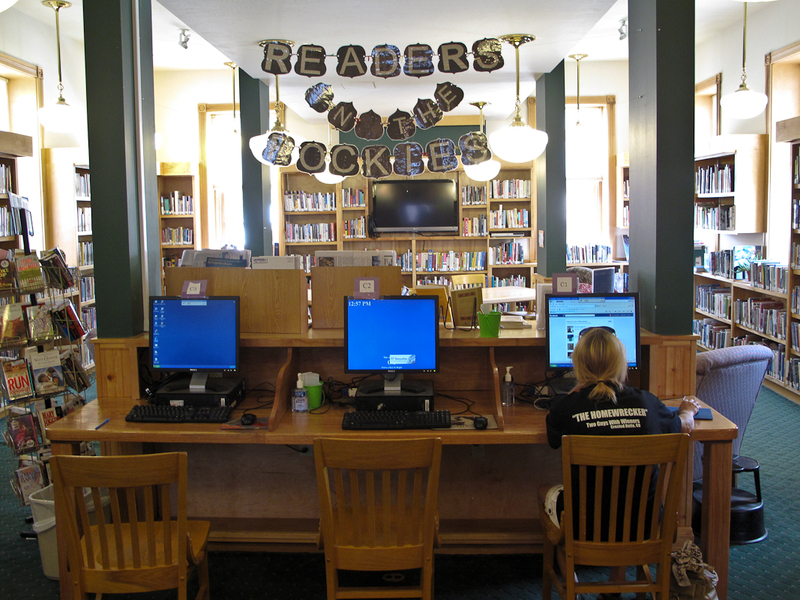 Libraries are essential yet they are threatened with closure throughout the nation. This is one of the main reasons that I am doing this project. I ended the day by photographing the Central Library in Denver. Here are seven stories of heaven. Everywhere I turned there were interesting things to photograph. I started with the Legacy Table where world leaders met at the 1997 G-8 summit. They took over the Library for a few days and the library got the table as compensation. 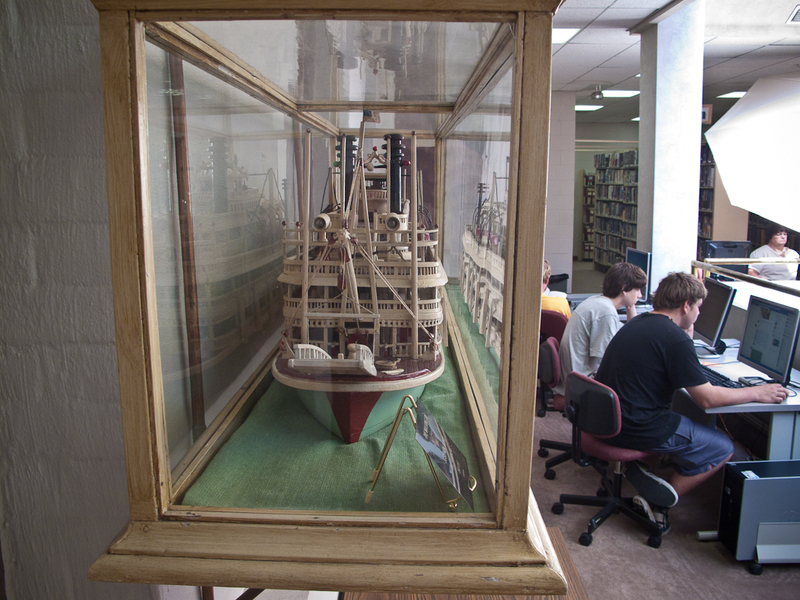 The Western History Center was the library’s crowning glory. Anyone doing archival research on the American West would eventually come here. I was in awe of what I was photographing. The views looking down into the library were also beautiful. I finished photographing the interior at the dot of 6 when the library closed. There was a huge diversity of people exiting the library at that time including a large homeless population. 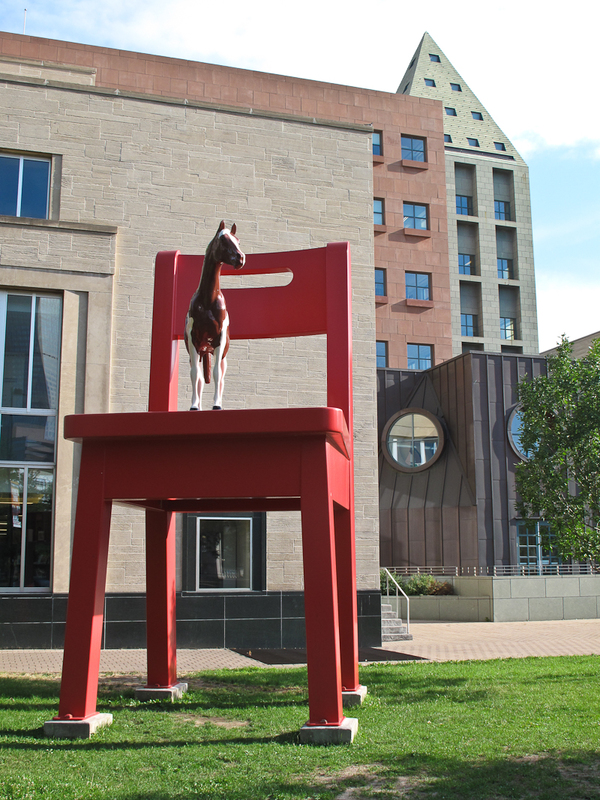 While I was photographing in the library Ellen and Walker went to the Denver Art Museum. They saw a fascinating exhibit of Indian art from all over the Americas. I finished by walking around the library photographing its interesting exterior. This was one of the great libraries in the country and I was glad to have two hours to record it. 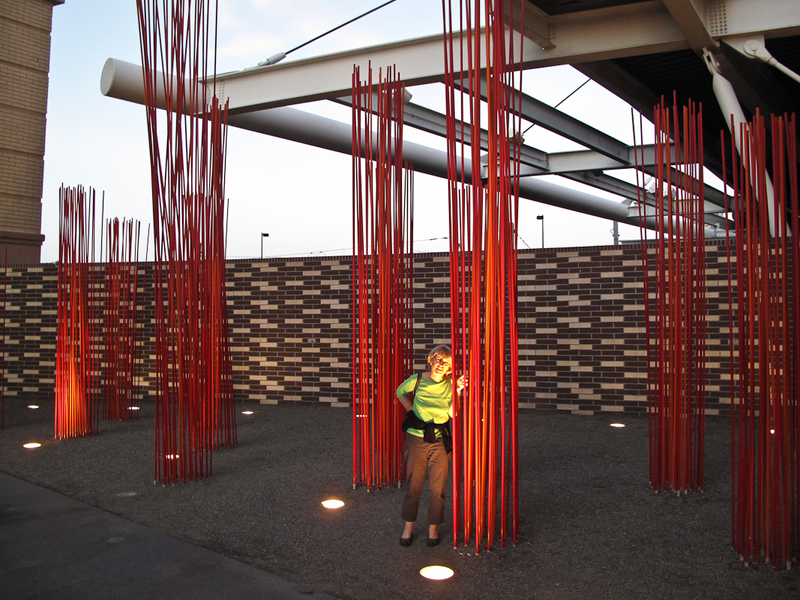 We spent the rest of the evening enjoying Denver’s diversity, great public art and good food. 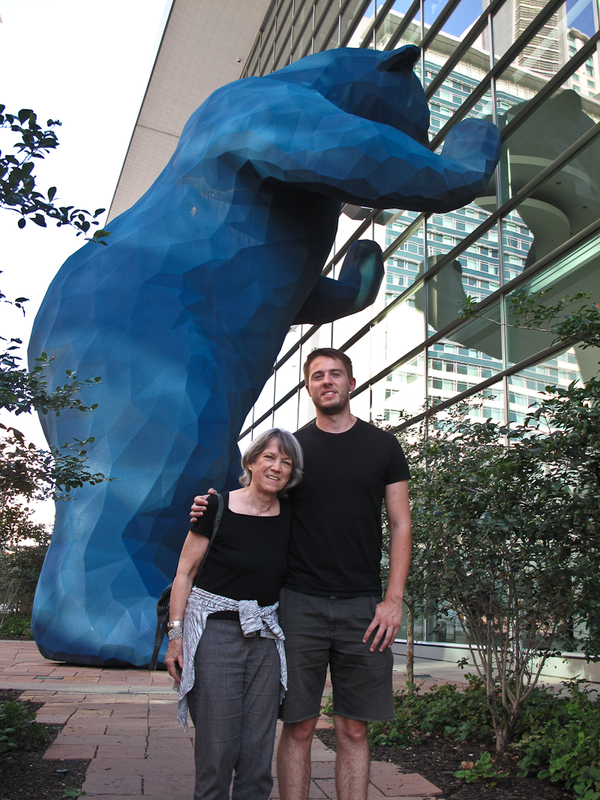 We saw a really BIG bear at the convention center and we ate at Root Down, an eco-friendly, progressive landmark. 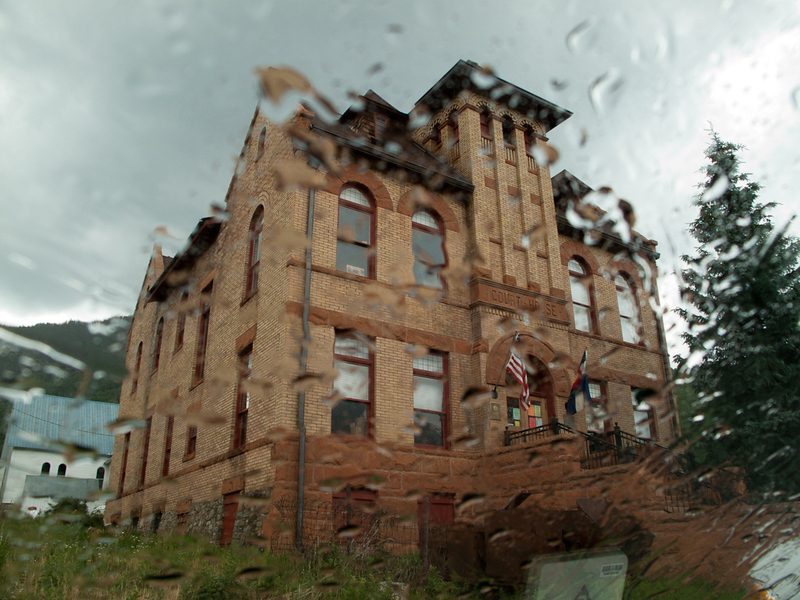 7/8/12 – The Carnegie library in Deadwood was spectacular. I carefully photographed it with my 4X5 camera. We then quickly got out of town driving several hours to Devil’s Tower. 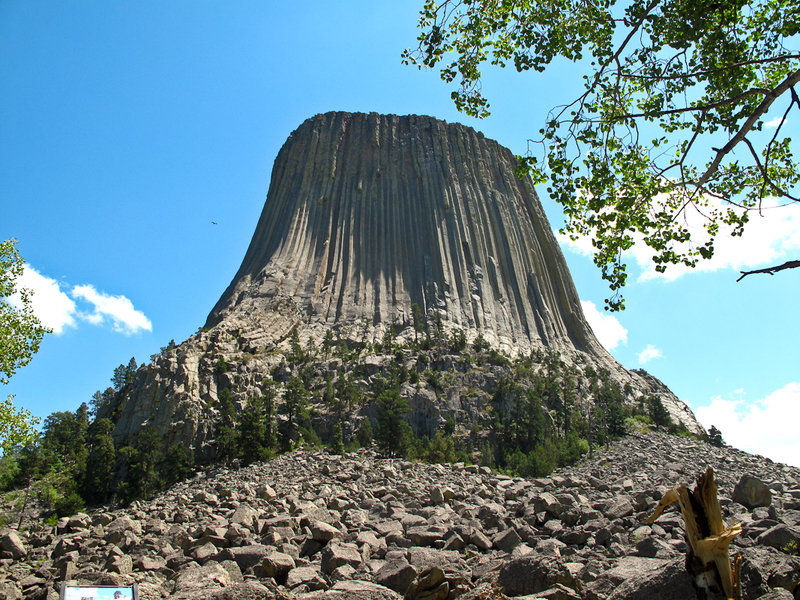 The writer N. Scott Momaday wrote “There are things in nature that engender an awful quiet in the heart of man; Devil’s Tower is one of them.” This massive rock rising up against the sky has a shocking presence. 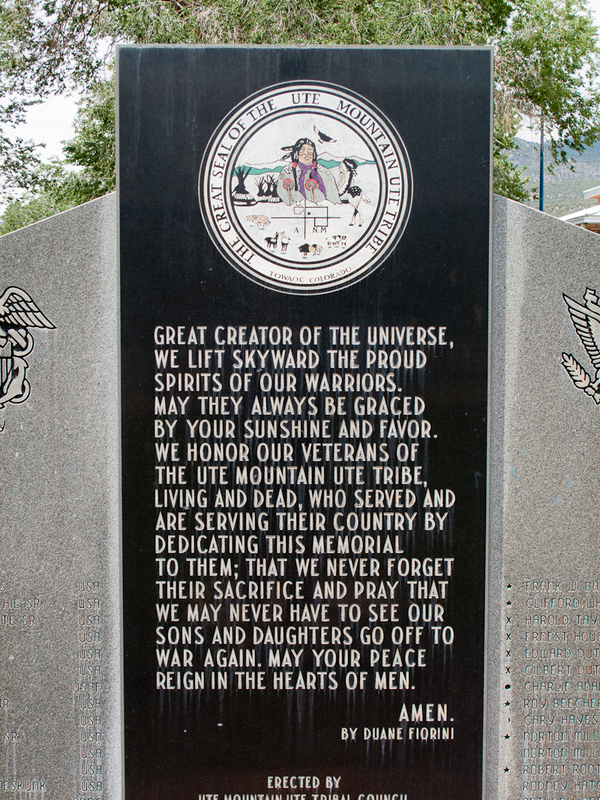 For obvious reasons it was sacred to the Native Americans. 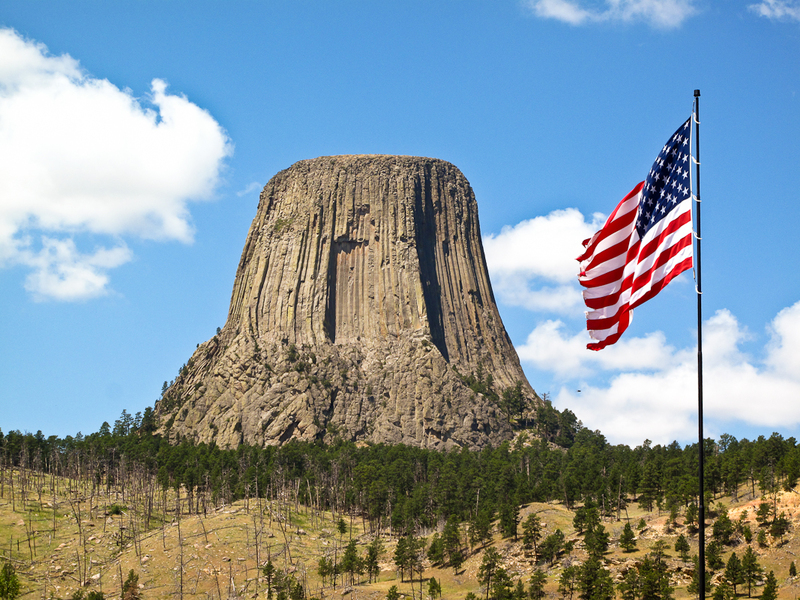 In 1906, President Theodore Roosevelt proclaimed Devil’s Tower the nation’s first National Monument to protect it from commercial development. It was fascinating to see how these parks help bring people together that normally wouldn’t mix. 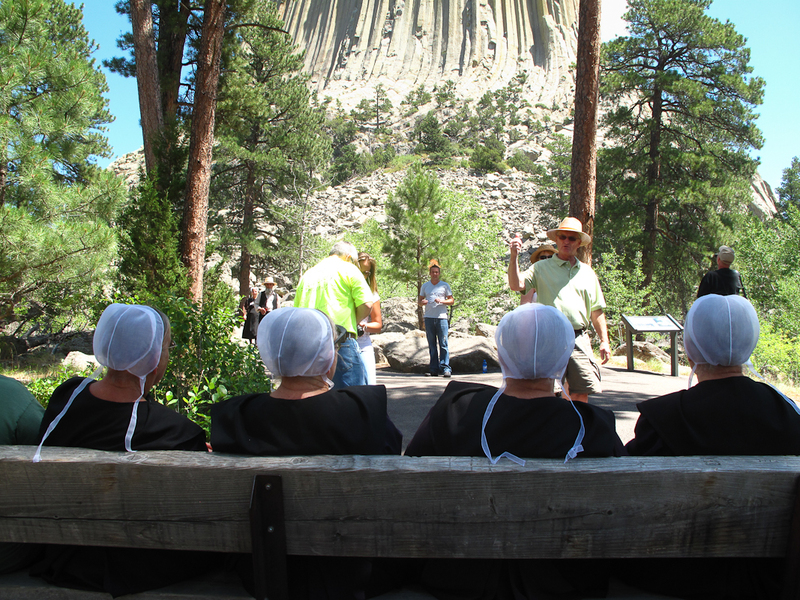 Christian bikers from the South, a Native American family, a family from France, Amish people all shared an awe-inspiring experience in this National Monument. The mingling of different people and the shared experience reminded me of the value of the shared commons in places such as parks and public libraries. Wyoming was big and he distances were vast. 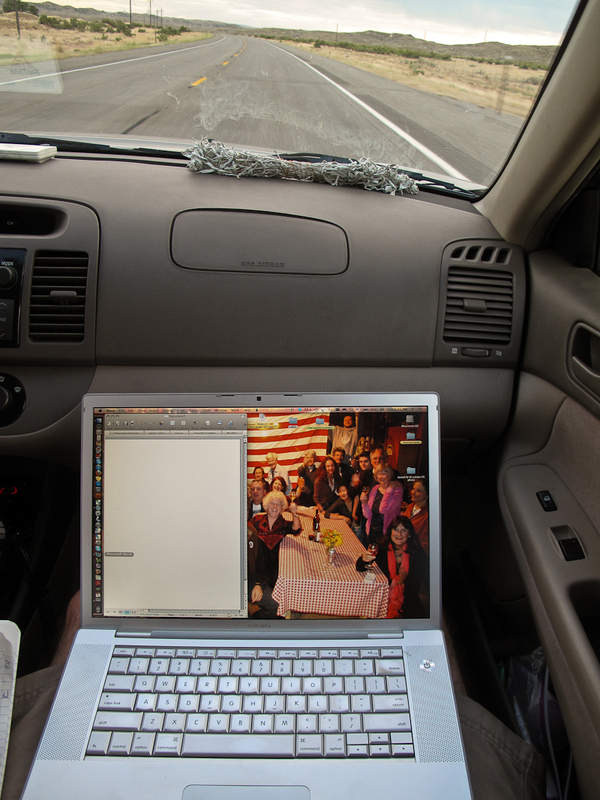 I spent most of the time writing the blog from the last two days while Walker drove. We visited the library and Starbucks in Gillette, WY. The library was new and quite interesting and Starbucks hit the spot. 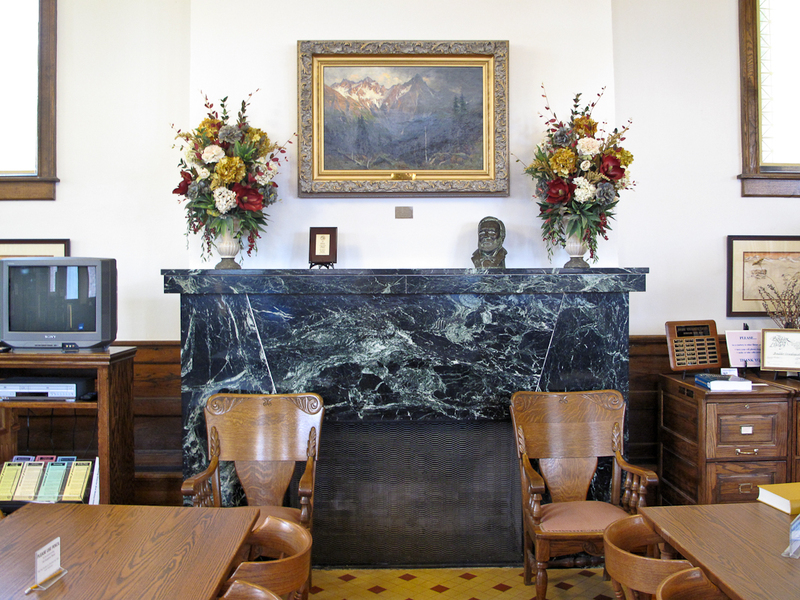 Gillette is a coal boomtown and one bumper sticker on a pickup said “My coal powers your electric car.” The Public Library in Buffalo, WY was a beautiful Carnegie. 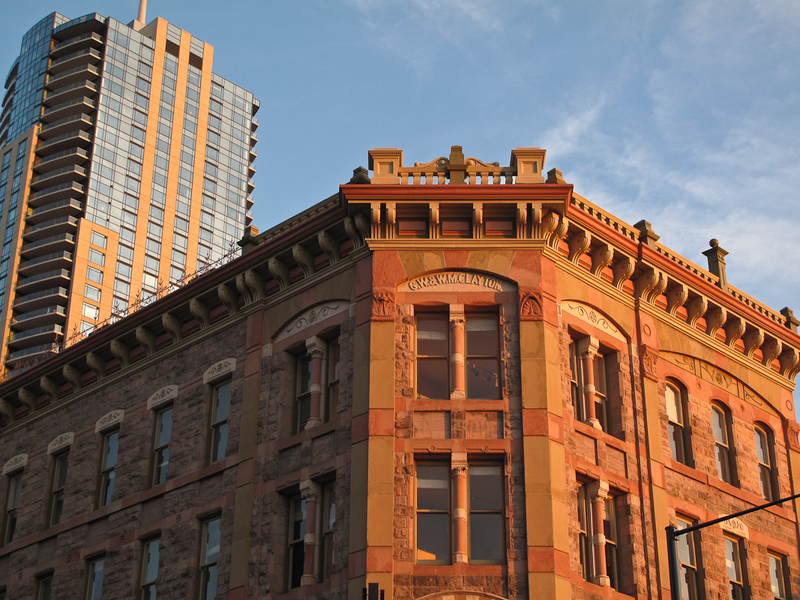 I enjoyed photographing such a pretty building in the afternoon light. Surprisingly, it was open on this Sunday afternoon. I walked inside and told the lady what I was doing. She informed me that this building was now a museum and that the library had moved to the very plain building across the street. 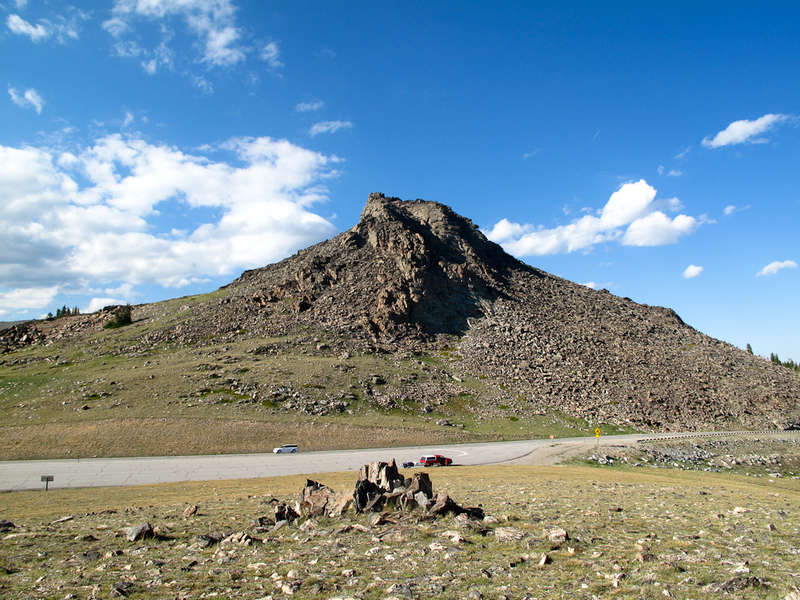 After that disappointment we drove over the spectacular Bighorn Mountains. The pass was almost 10,000 feet and Ten Sleep Canyon was one of the most incredible drives on this trip. 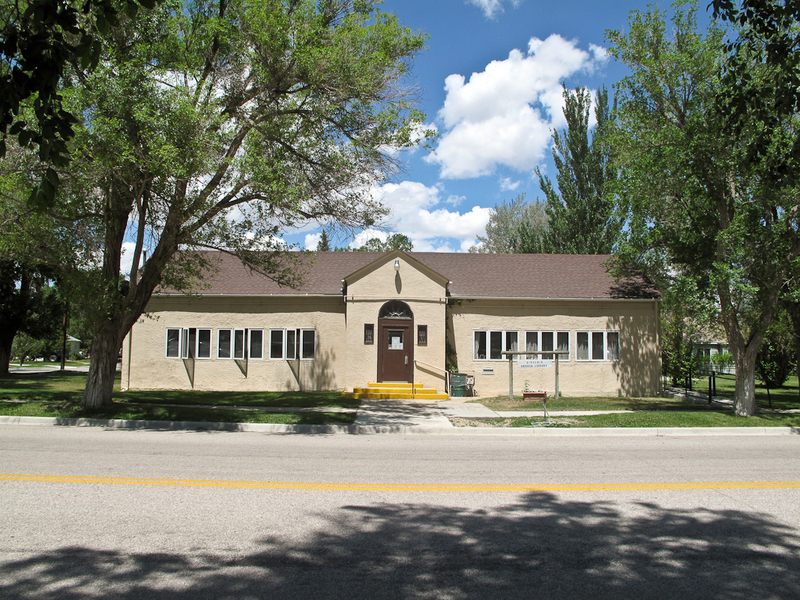 The town of Ten Sleep, WY had a plain library that actually looked good in the late afternoon light. Ellen and I stopped here in 1983 and it hadn’t changed much since then. After finishing writing the blog for the last two days I typed most of it on my laptop in the car while Walker again drove through a Wyoming sunset. After another long drive we landed in Lander, WY. This wonderful, small town on the edge of the Wind River Mountains even had great dining available late on a Sunday night. After finishing most of the blog I crashed at 1 AM. 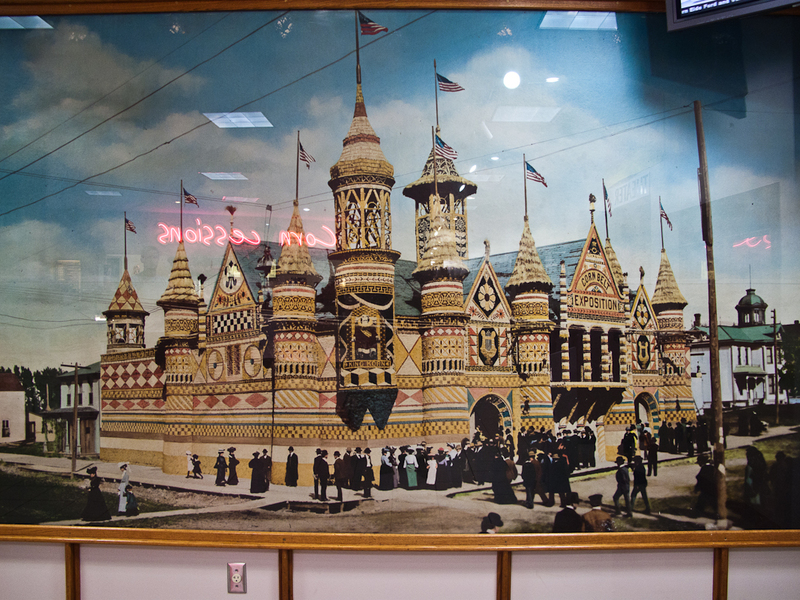 7/6/12 – We started the day by going to Mitchell’s World Famous Corn Palace. The outside walls were covered in corn and the design changes every year. It is classic American kitsch but seemed pretty shallow. 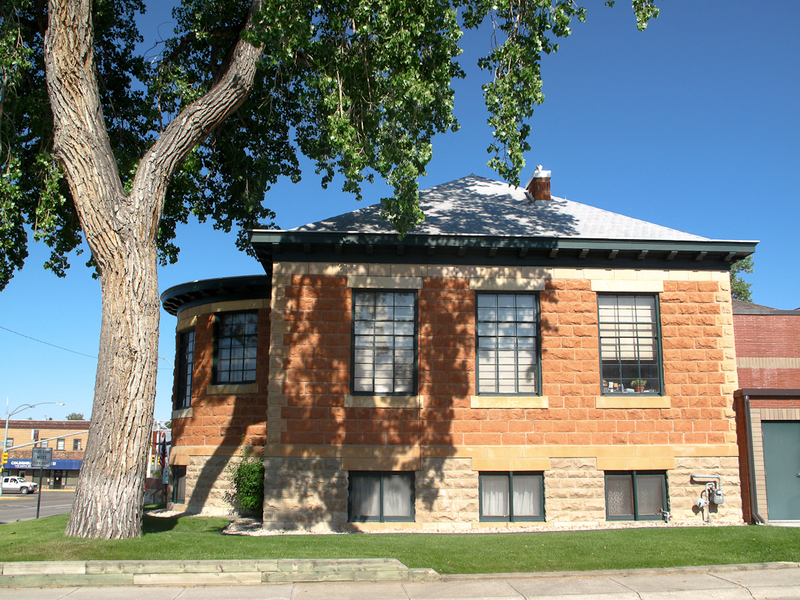 We quickly drove by the very plain library in Mitchell to the former Carnegie Library, now a Resource Center. I had been looking forward to seeing the 1940s WPA mural on the ceiling of the dome designed and painted by Sioux artist Oscar Howe. Unfortunately it was closed. 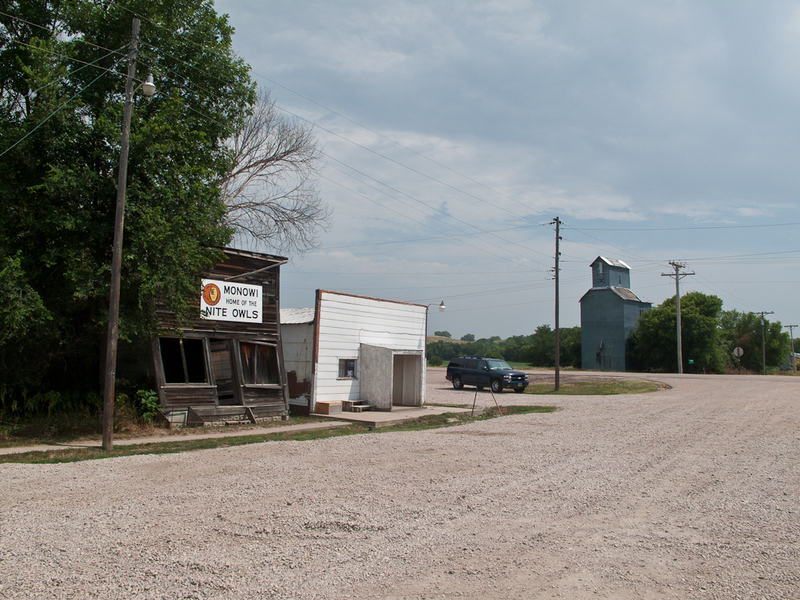 We then drove quickly across the state to the town of Wall, SD. Its Drug Store is also famous but we were both pretty tired of tourist traps. In contrast to Wall’s phoniness the library was a real gem. It was old and made out of stone and had all the substance that Wall Drug lacked. 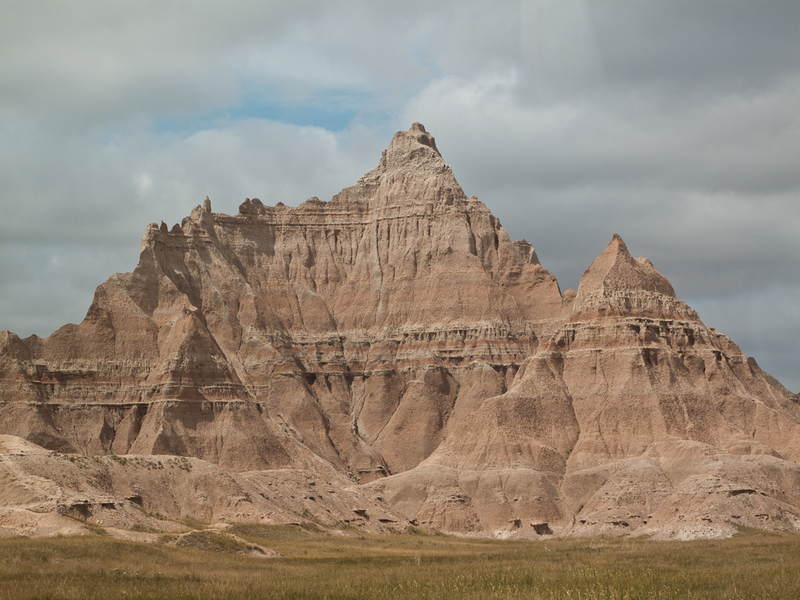 Soon after we left Wall we entered Badlands National Monument. 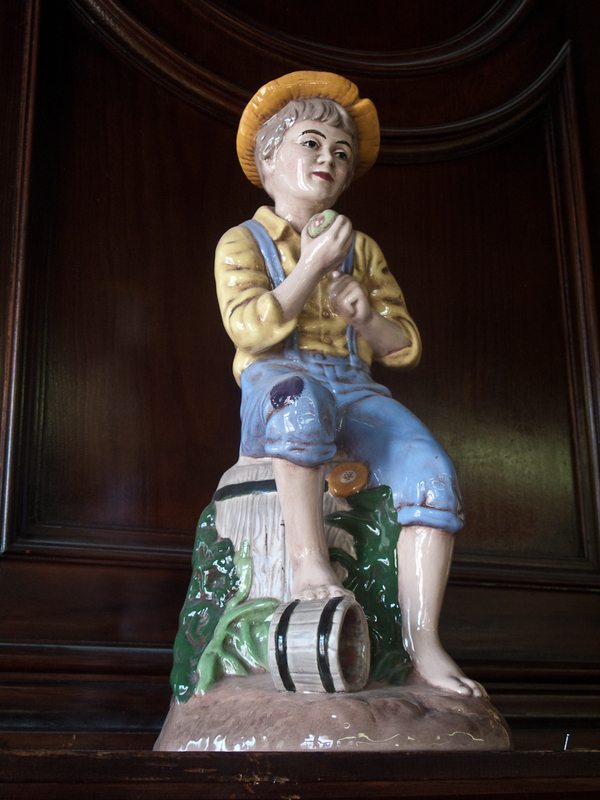 Here the contrast between kitsch and substance couldn’t be greater. We soaked up the subtle color and beauty. As always the National Park System did a great job of managing this national treasure. 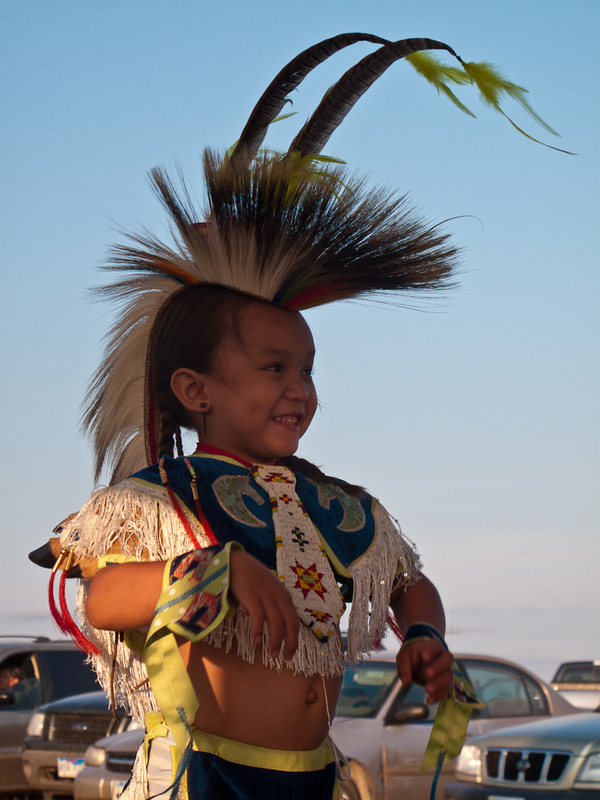 As we entered the Pine Ridge Indian Reservation we entered another world. 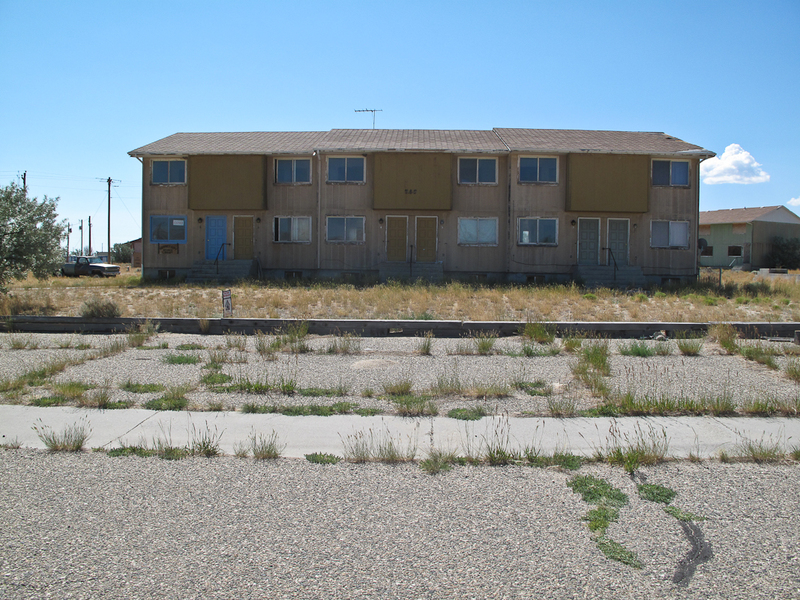 This is one of the poorest places in the country. The average income per capita is $1,500/year. 96% of the population lives below the poverty line. The libraries here are few and far between. 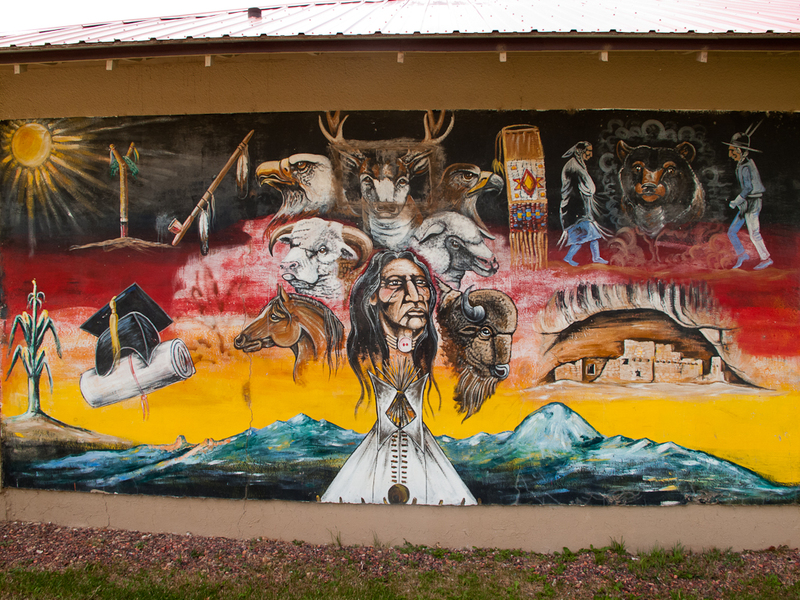 In Allen, SD, statistically the poorest town in the United States, there was a library in the Oglala Lakota College. However, it was only for the students, not the public. 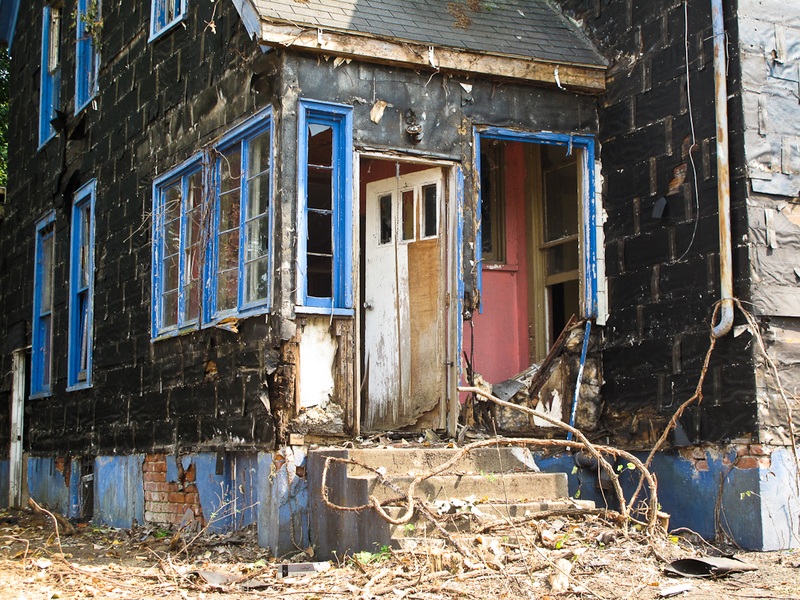 The town looked poor with crumbling houses and trashed yards. Even though the Tribal Center was open it was dark and felt empty. 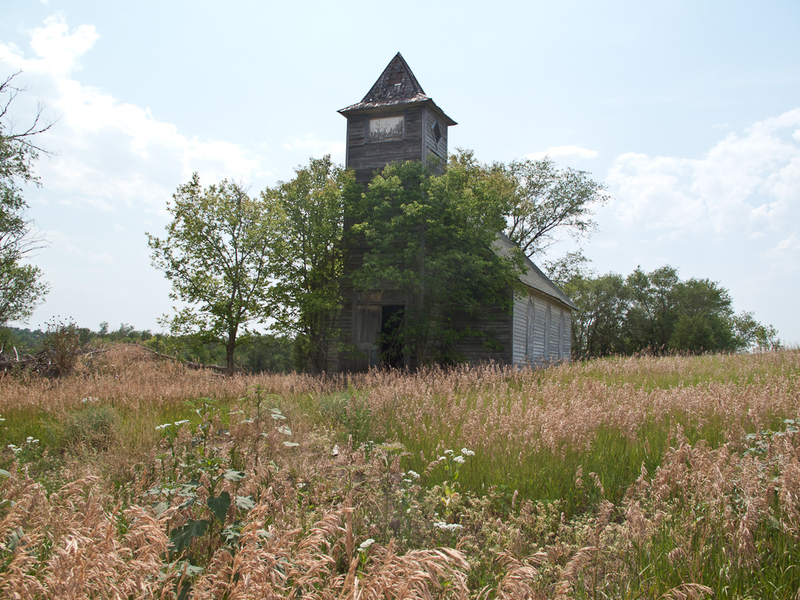 We drove into the really small Lakota town of Batesland, SD. 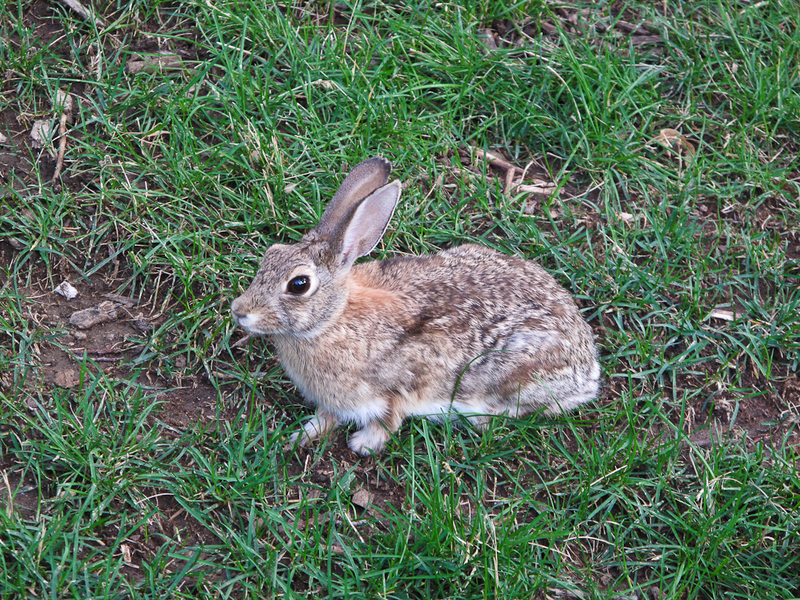 We heard a weird thumping sound from the car. 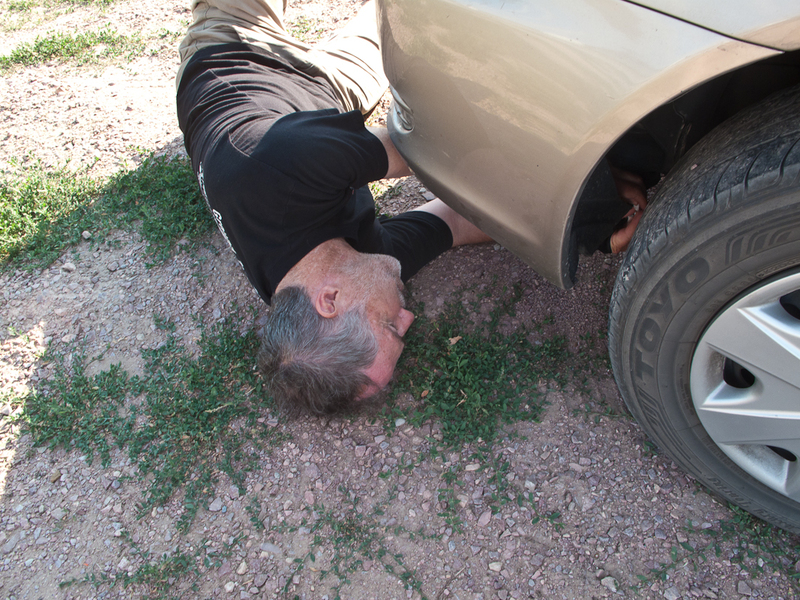 We pulled into a dirt church parking lot where I used a piece of thin wire tie from a food bag to connect the flapping parts until we could get it fixed later. We drove 20 minutes down a dirt road to a B&B that Walker had found on the Internet. It was owned by a white family and is a working farm. They even had the original deed of ownership signed by President Coolidge in the 1920s framed on the wall. Several people told us that we were very lucky with the timing of our arrival. 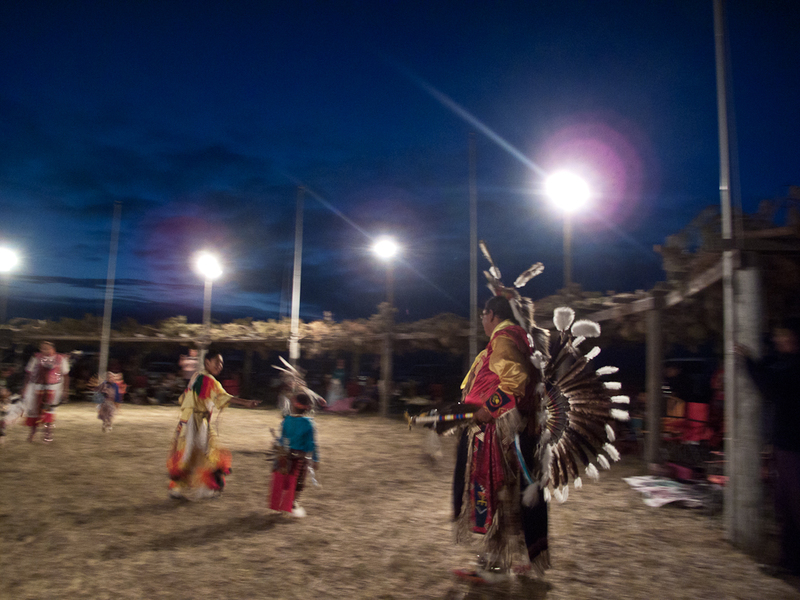 The Lakota Sioux were having their annual Powwow starting this night back in Batesland. 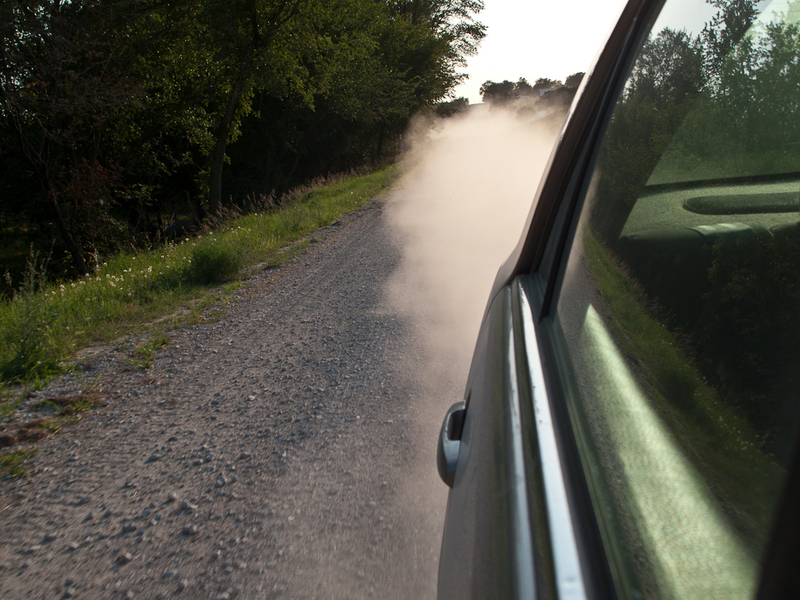 We drove our well-worn Camry down the sandy, washboard road into town. 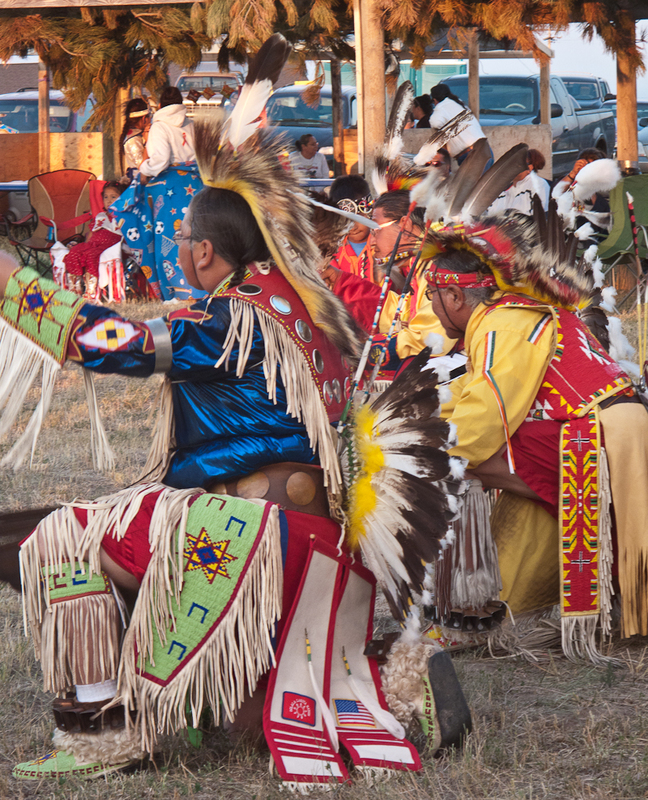 What made this Powwow special was that this was being done by the Indians and for the Indians, not for the tourists. Everyone was friendly in this non-commercial event. 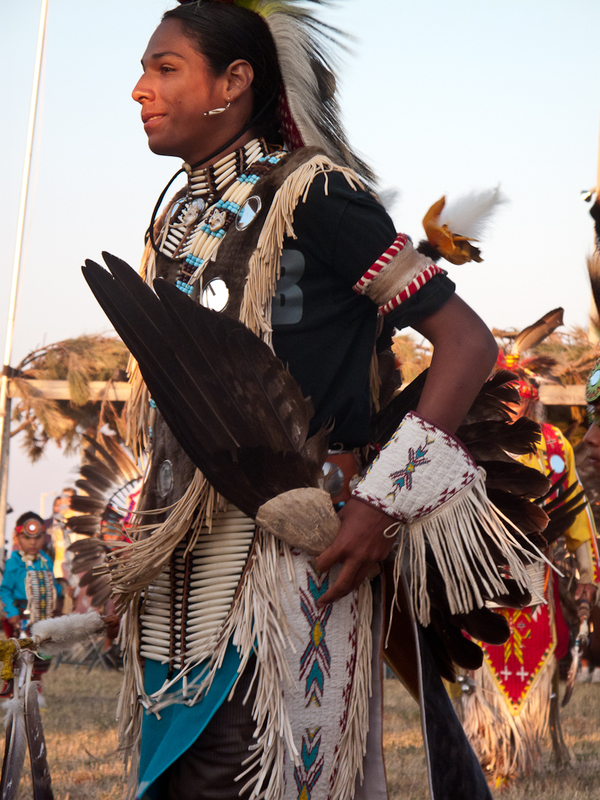 We felt totally accepted as we chatted with a Lakota couple that had originally met at the Stanford University Powwow. The man, Kelly Looking Horse became the main MC as the dances began. 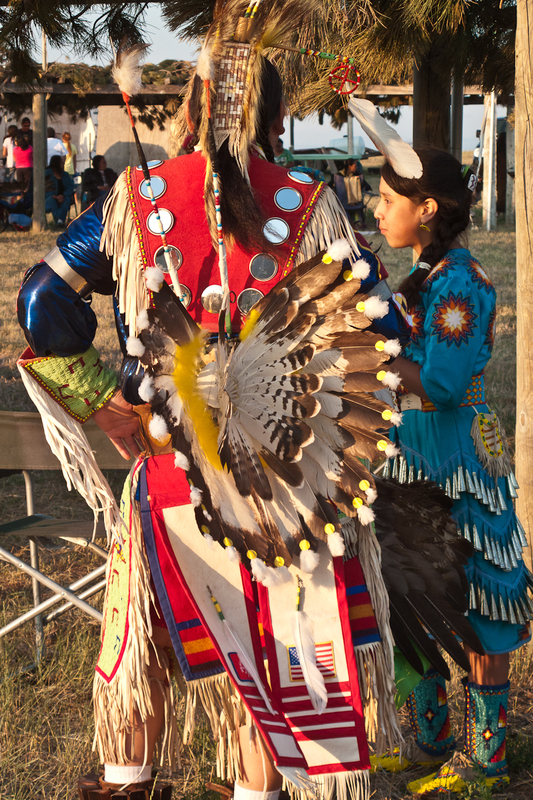 The beauty of the swirling costumes in the red sunset astonished Walker and me. We sampled Indian tacos that were served in an open Doritos bag with meat, onions and cheese over crumpled spicy Doritos. Delicious! 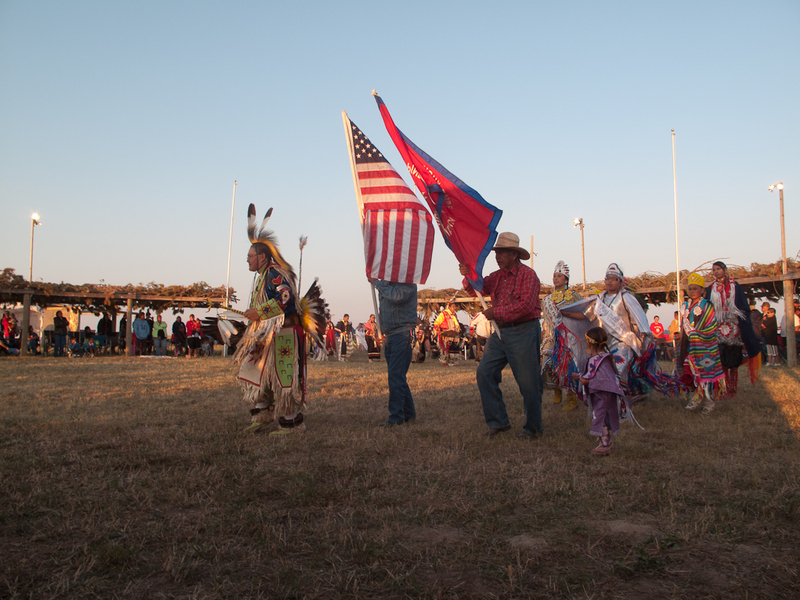 The only other non-Native people at the event were a group of Presbyterians from northern Virginia. They were there to do much needed work on the Reservation. These people gave Christianity a good name. 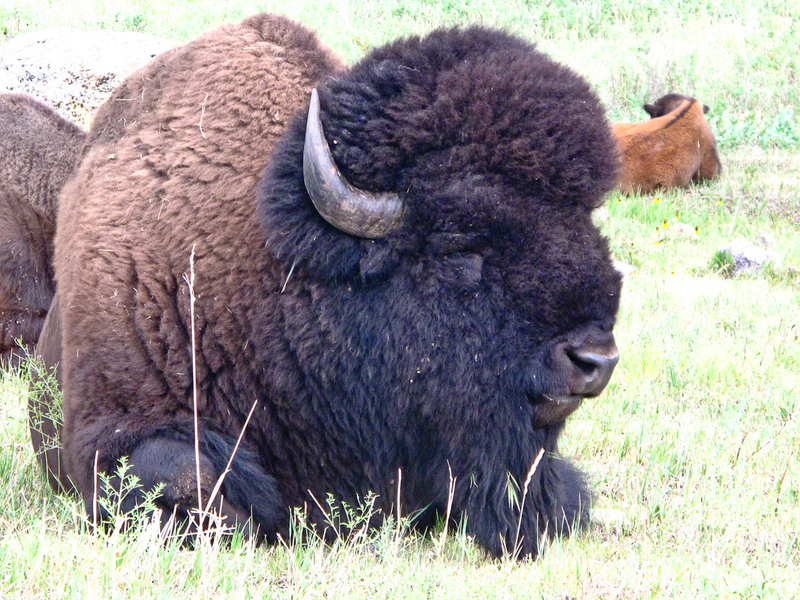 Later, with the haunting sounds of the Lakota drumming and singing in our heads we fell into a deep sleep back at the B&B. 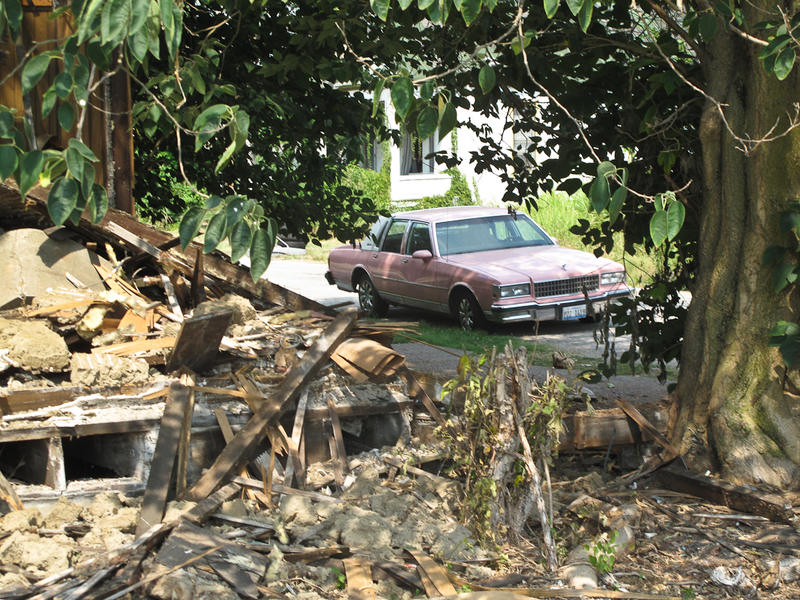 7/7/12 – Walker had never stayed in a bed and breakfast before. We participated in the slightly awkward ritual of having breakfast with our hosts and guests. They all turned out to be great people and even all had a liberal bent. We drove back to Batesland to get the car fixed. The Indian man that worked on it had just come from a memorial service for his daughter who had been killed by a drunk driver. The sky was gray and it was raining as we drove into Wounded Knee, SD, site of the last big massacre of Indians in 1890. The US Army slaughtered over 250 mostly women, children and old men as they were surrendering. This national tragedy felt very current here today. 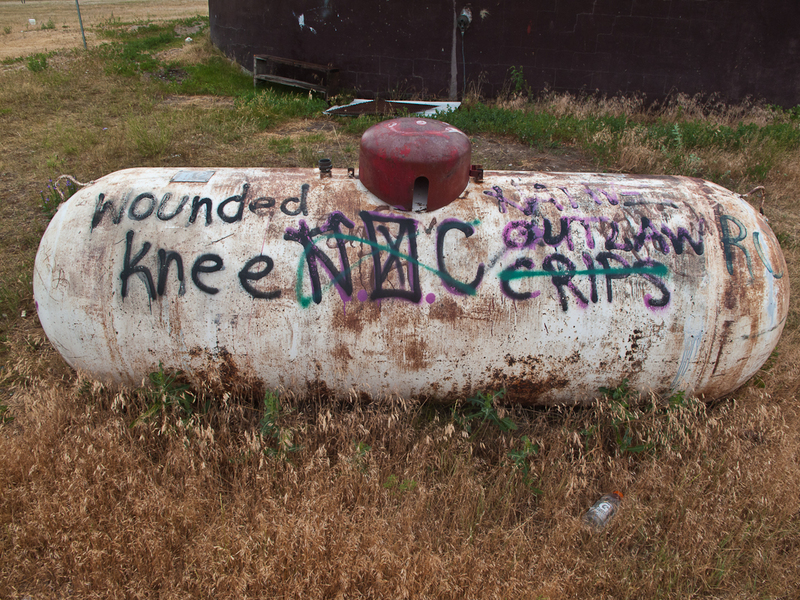 In the 1970s the American Indian Movement occupied Wounded Knee for many days precipitating another tragedy as the government tried to evict them through force of arms. It was drizzling as we climbed the hill to the mass grave for the 1890 victims. 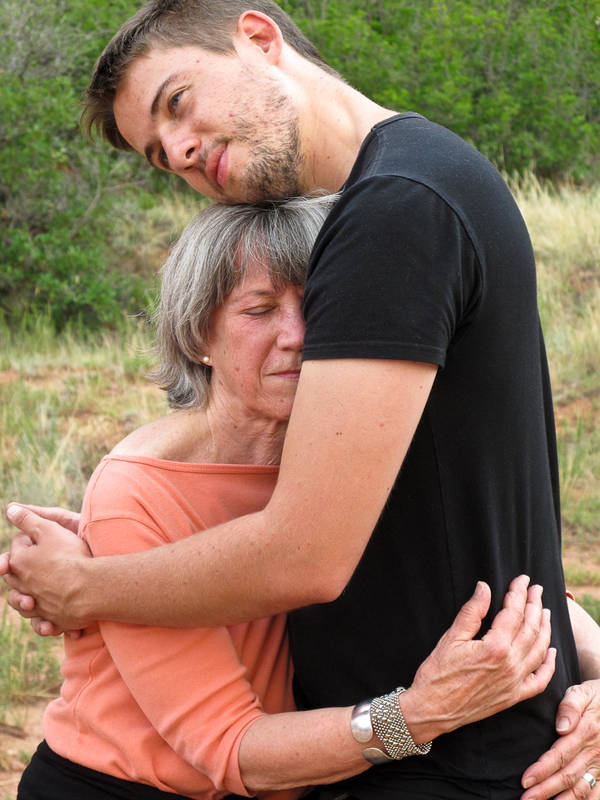 Walker and I felt an overwhelming feeling of sadness and shame. 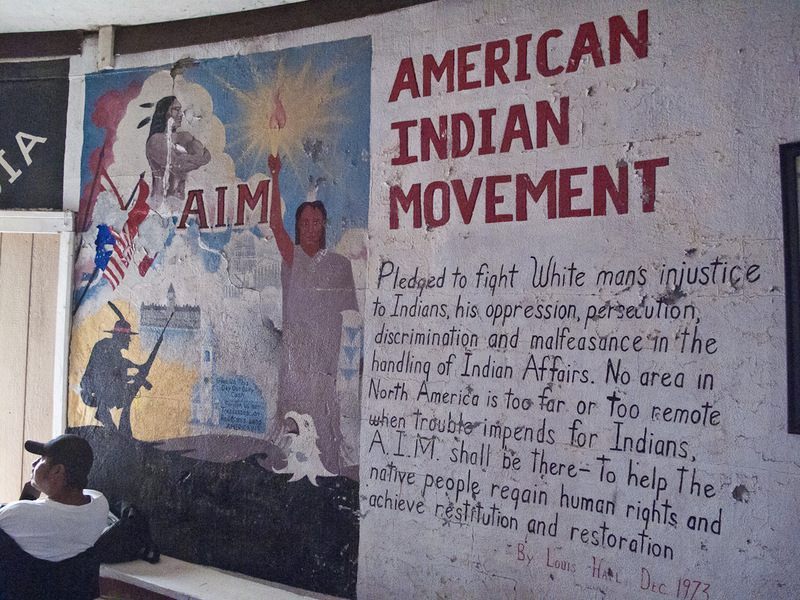 We stopped at the unlit and very poor Visitors Center that was basically a monument to the American Indian Movement. We bought a bundle of sage as a gesture to healing. 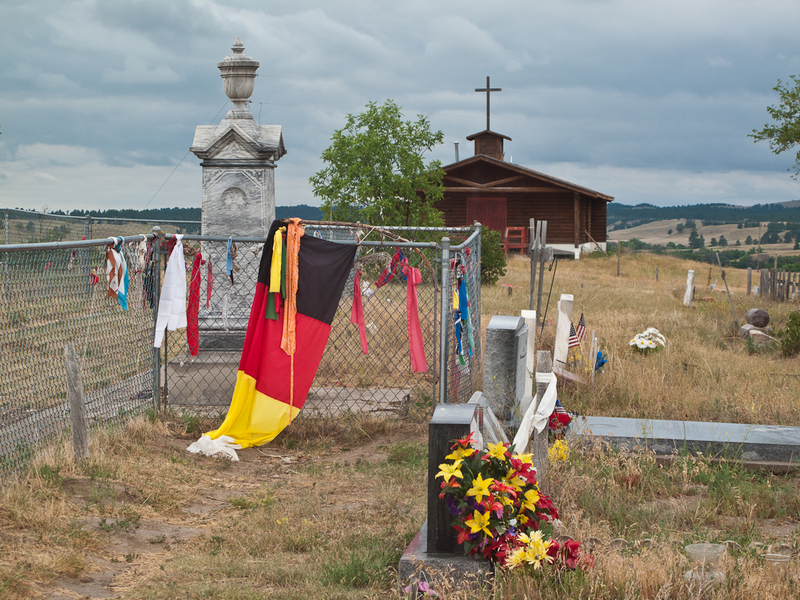 We drove on in silence listening to a Lakota Christian radio station broadcasting hymns sung by local people. The station also broadcast testimonials by locals on why they were Christians. I will never forget the guy with the shaky voice recalling his alcoholic parents who abandoned him, the older man who raped him and his anger turning him to join gangs and worship the devil. He broke into a local house and stole much of what they owned. When the family turned around and prayed for his soul he found God. And then he married the daughter of the family he had robbed. 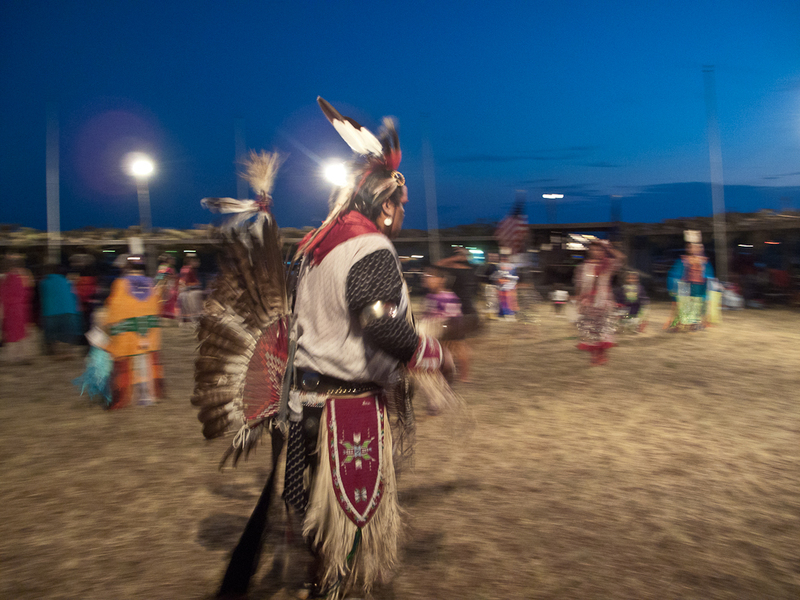 We arrived in Pine Ridge in a dark mood. This town was very poor and filled with problems, especially alcoholism. Life expectancy here is lower than in Afghanistan. We went into the local market and I discovered an amazing photo book on the local area. Walker bought an Oglala Lakota Nation hoodie. 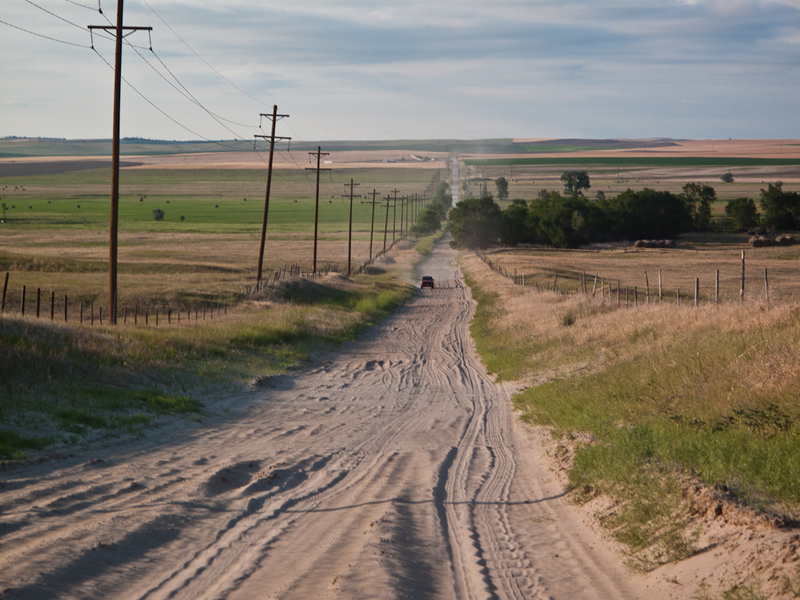 We then drove two miles south to the Nebraska border town of Whiteclay. Located just outside the dry Reservation it is a magnet to Indians looking for alcohol. 13,000 bottles of beer and malt liquor are sold here everyday in a town of 11 people. The New York Times did a recent story about this national tragedy (see attached article) and the businesses fueling this addiction. 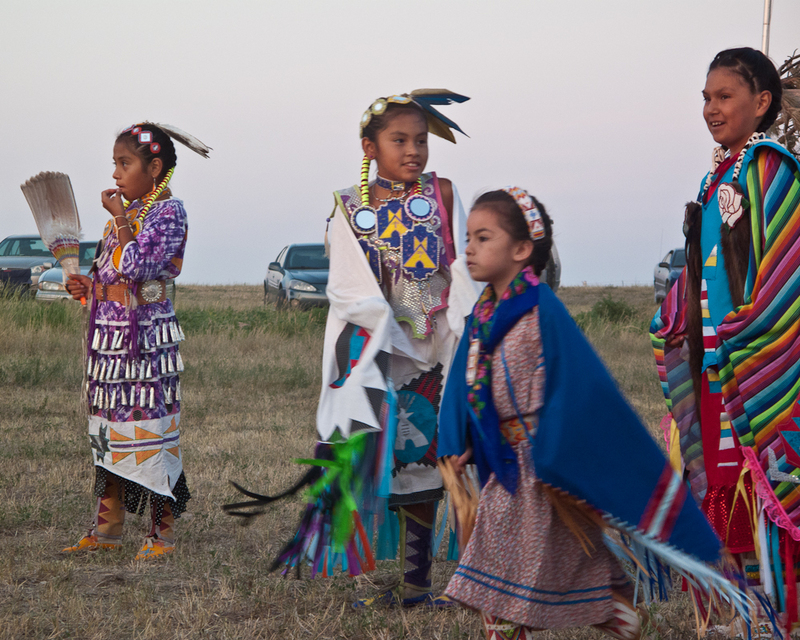 The story states “In February, the Oglala Sioux filed a federal lawsuit against the stores and Anheuser-Busch and several other brewing companies, accusing them of encouraging the illegal purchase, possession, transport and consumption of alcohol on the reservation. 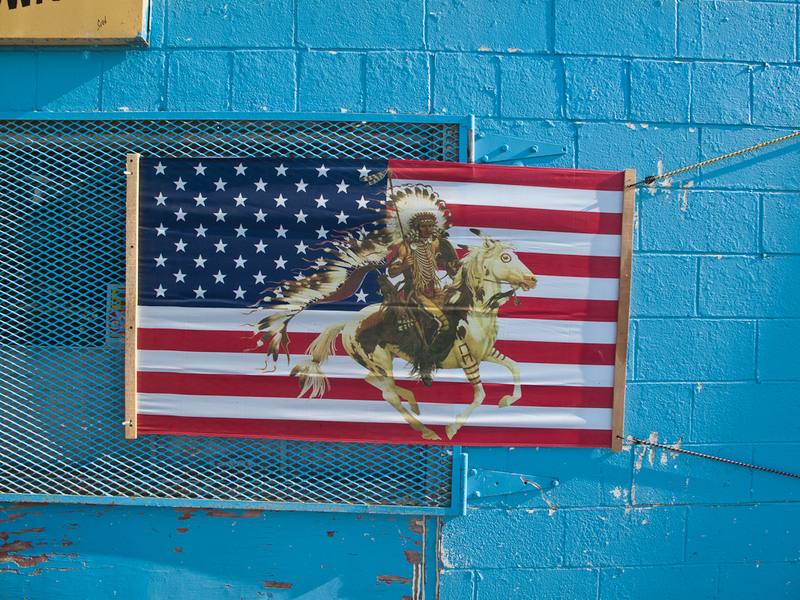 Fetal alcohol syndrome, fatal drunken driving accidents and beer fueled murders have cast a pall over Pine Ridge for decades.” It is estimated that 1/3 of the women on the reservation have been raped. I had never been in a town where everyone was drunk all the time. Zombie-like men staggered down the wet sidewalk and collapsed. 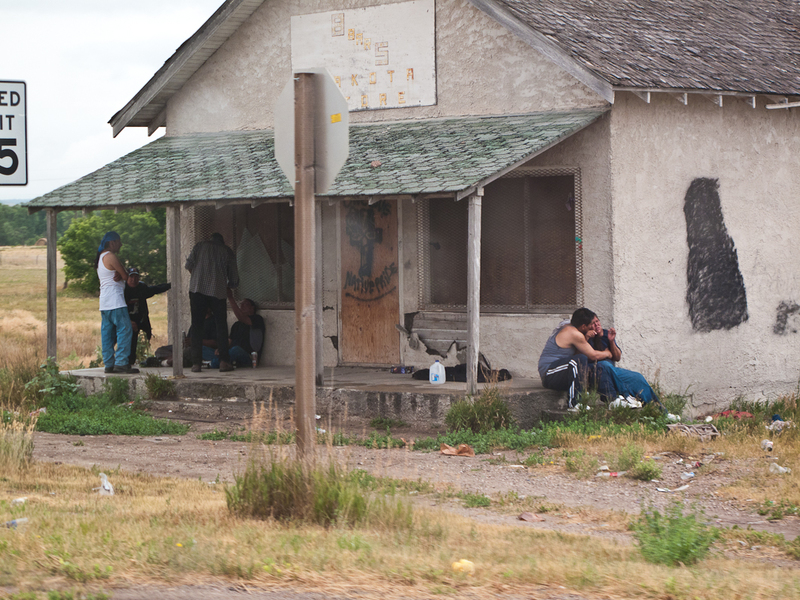 The gloominess of the day added to the desolation of Whiteclay. Walker went into a food store to get a sandwich while I fended off drunken men rapping on my car window begging for money for booze. I texted Walker that he should get back to the car “quick” but in my haste sent it to my wife Ellen back in San Francisco. She was quite concerned. We couldn’t get out of Whiteclay soon enough and spent the rest of the day trying to recover from this horrible experience. Neither of us had seen anything quite this bad, except perhaps Walker’s trip to Dhaka, Bangladesh. 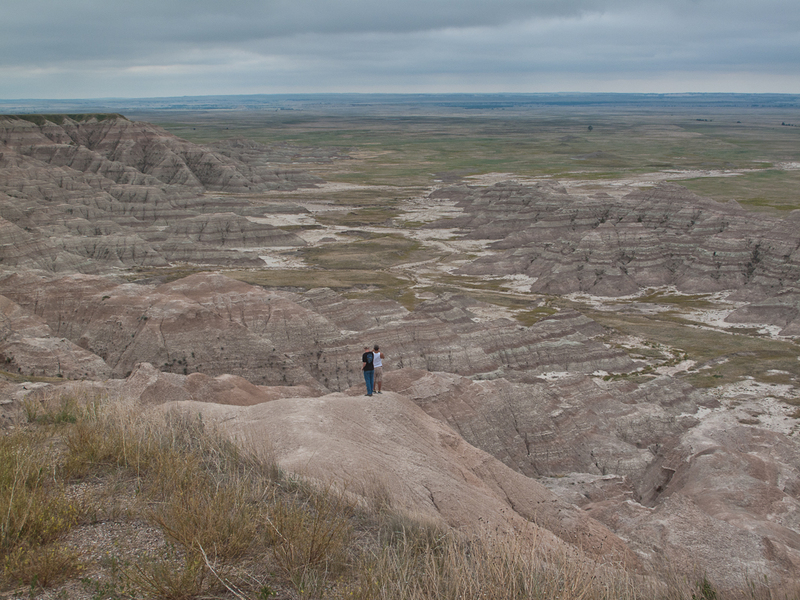 We eventually made it to the Black Hills of South Dakota. Here was the scene of an earlier tragedy and also the creation of an American icon. After signing a treaty with the Indians in the 19th century guaranteeing them ownership of the Black Hills forever gold was discovered. General Custer (yes, that Custer!) was brought in to remove the Indians and make the area “safe for the prospectors”. No Indians live in the area today. 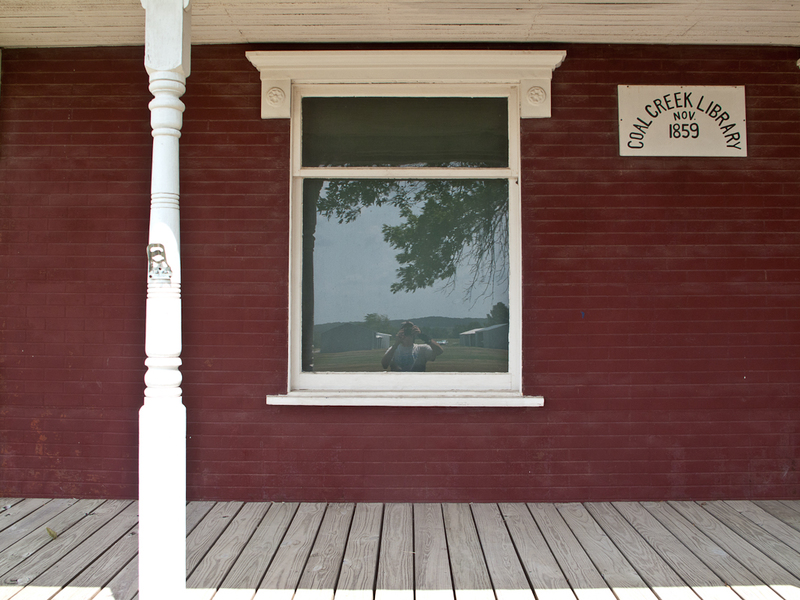 After photographing the old Carnegie library in Hot Springs, SD we wound our way through the length of the Black Hills. 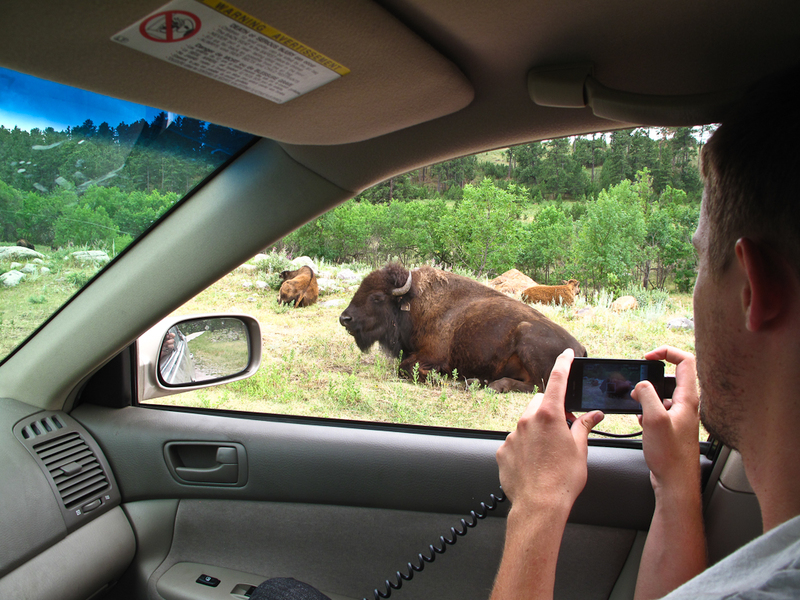 We photographed buffalo and antelope by the side of the road in the beautiful Wind Cave National Park and the Custer (yes, that Custer!) State Park. History is indeed written by the victors. 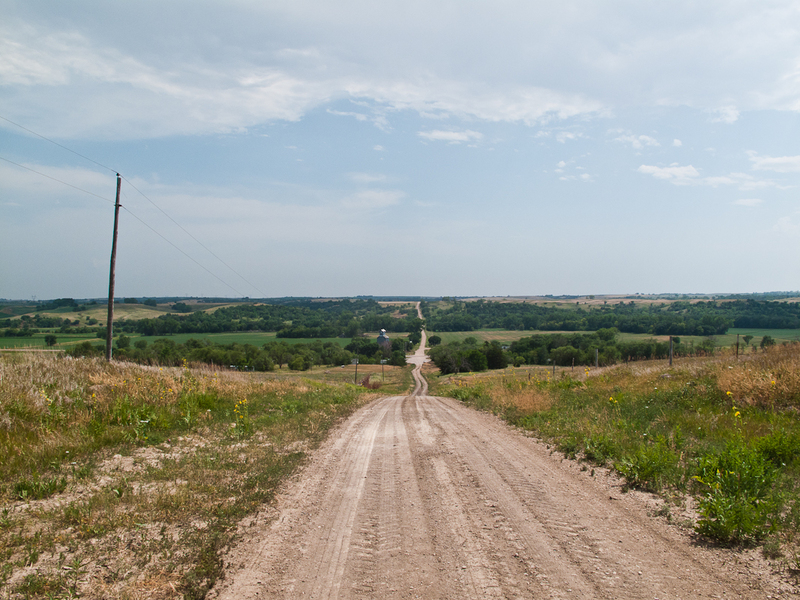 We were desperately in need of the solace of open spaces after what we had seen in Whiteclay. 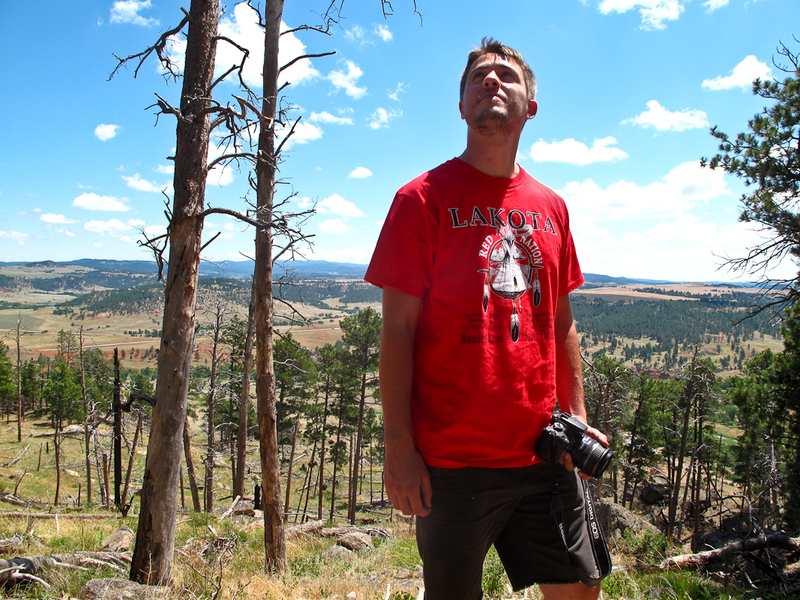 The Black Hills were beautiful and we could understand why they were sacred to the Indians. Mt. Rushmore is impressive, even from a distance. The Iron Mt. highway is absolutely insane with its one-lane tunnels, 360-degree hairpin loops and tiny wooden bridges. It was actually fun to drive this crazy but beautiful highway. Mt. Rushmore was even more impressive up close. I was last here with Ellen on our honeymoon in 1983. It was much more chaotic back then and again I applaud the NPS for making this place a great and accessible experience. 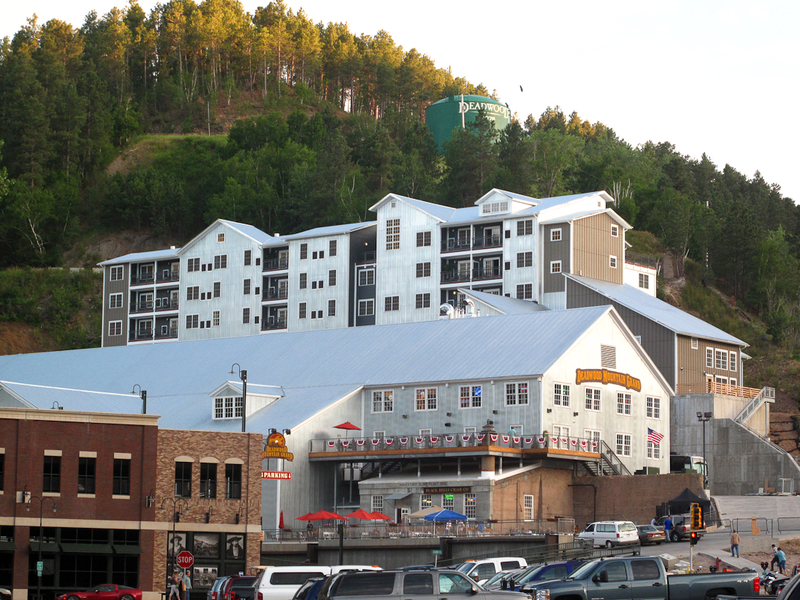 We ended our drive in Deadwood, SD. This was the colorful 19th century mining town that today is a western theme park living off its past. I called it Disneyland in Deadwood. Walker and I were both overwhelmed by the range of experiences that we had today. 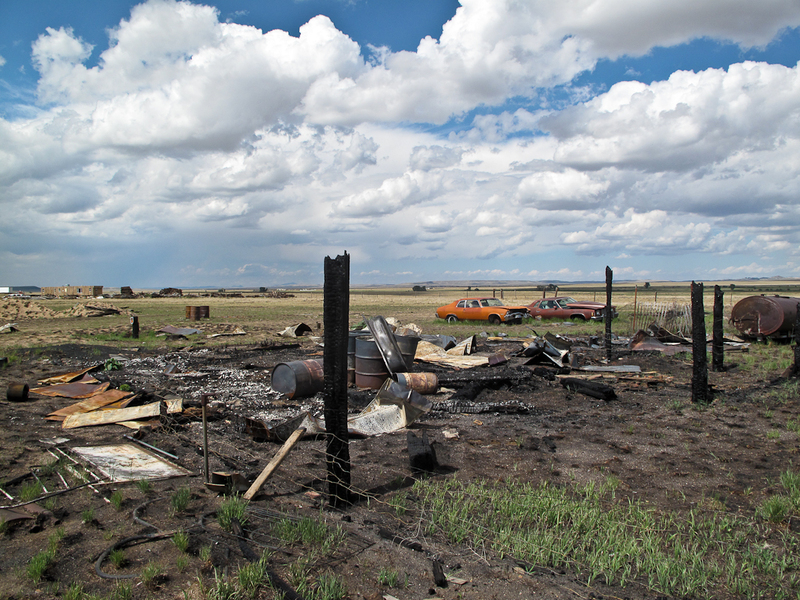 The destruction of the Indian tribes continues in Whiteclay and Pine Ridge. Good people are trying to change that but is an ongoing struggle. 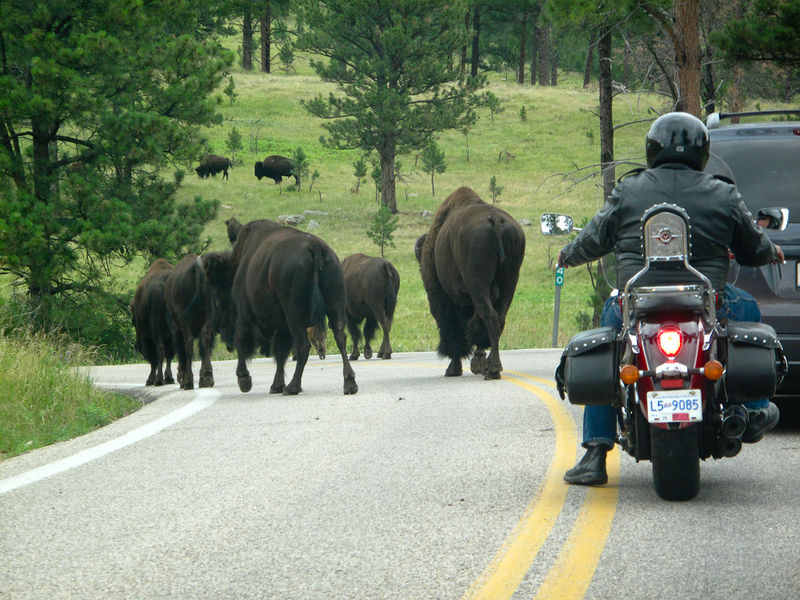 The Black Hills saved our sanity. The redemptive power of nature is real. But at night as we were trying to sleep both of us were silently crying inside with grief for the insane, third-world conditions that we saw today in this part of Native America. 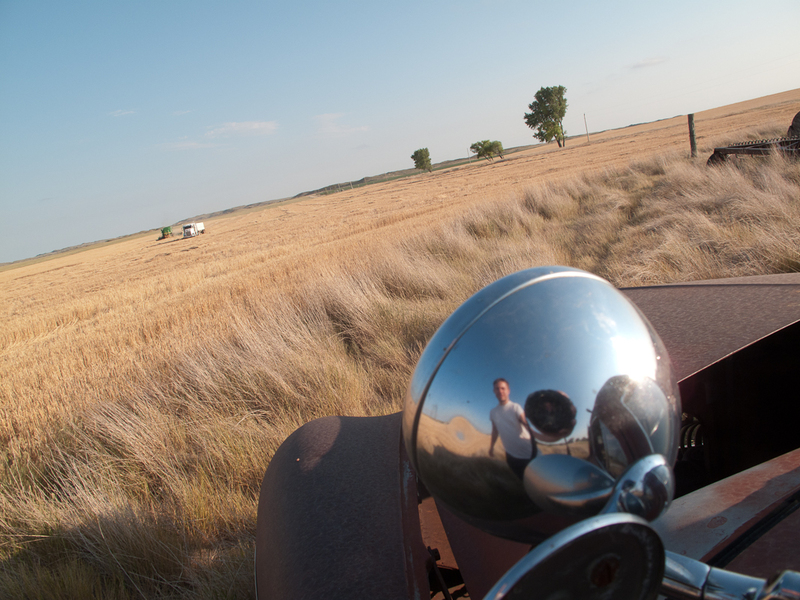 7/4/12 – As we entered Nebraska we quickly saw why it is called the Cornhusker State. Endless acres of corn stretched off to the horizon. Much of this was to feed Big Agriculture’s desire for corn-fed beef and ethanol. When we filled up our car I noticed that 10% of our gas was ethanol. 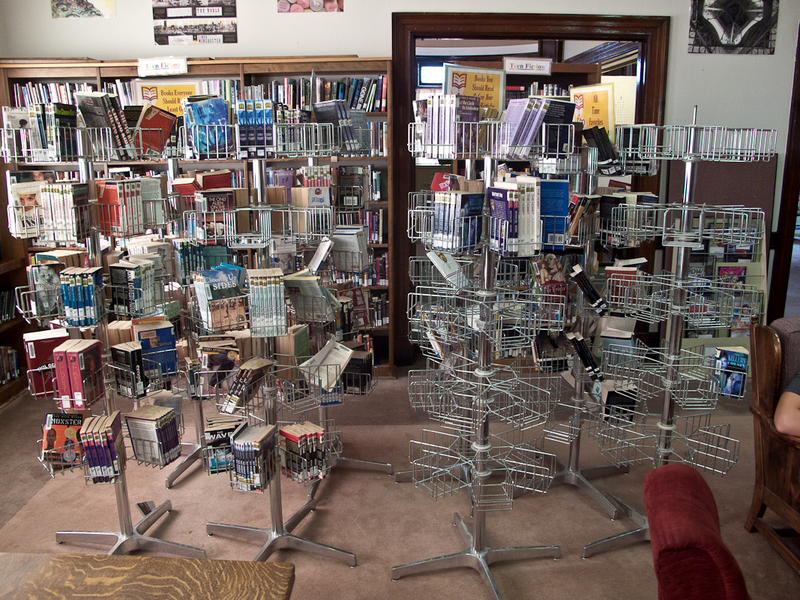 Nebraska was also the land of great libraries. Rulo and Pawnee City , NE were just the start. 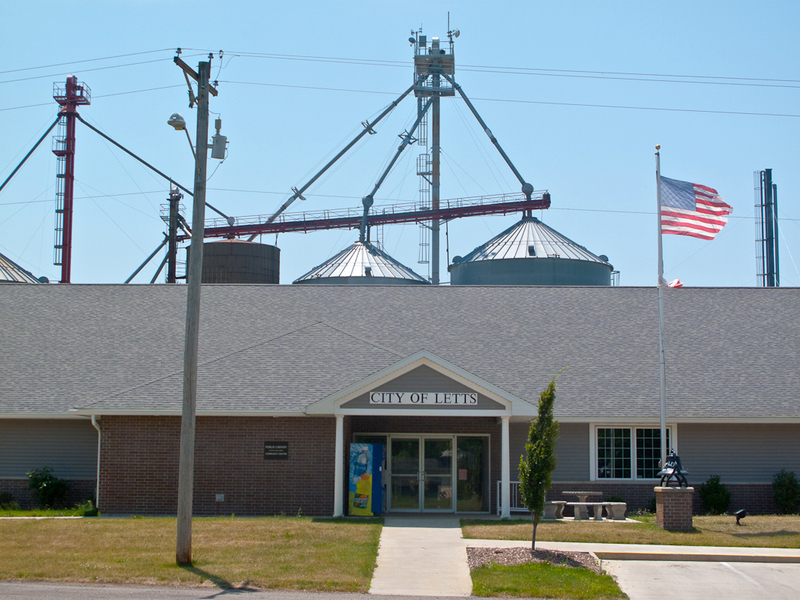 One of my favorite libraries of the trip was in tiny Burchard, NE. Although it was closed Walker noticed that the door was ajar. Inside was another archive of a small American town. 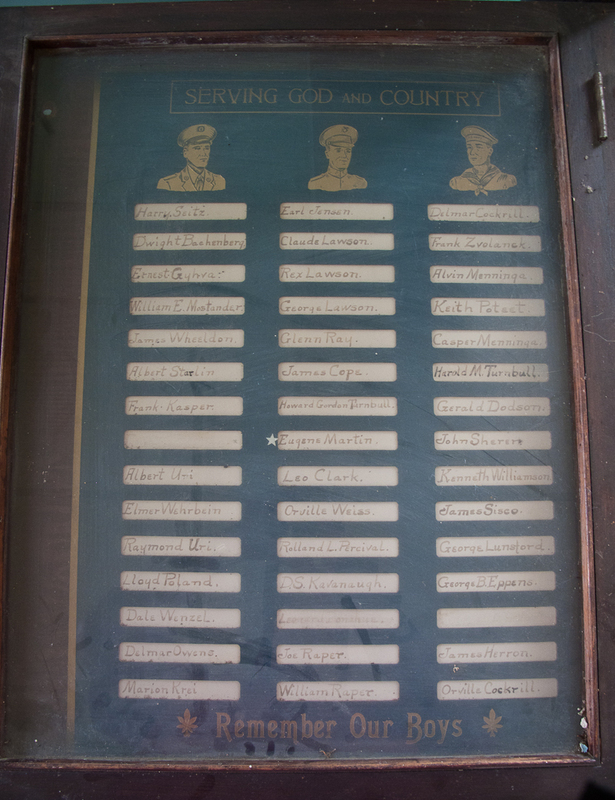 The library included lists of fallen American soldiers from WWI and WWII. 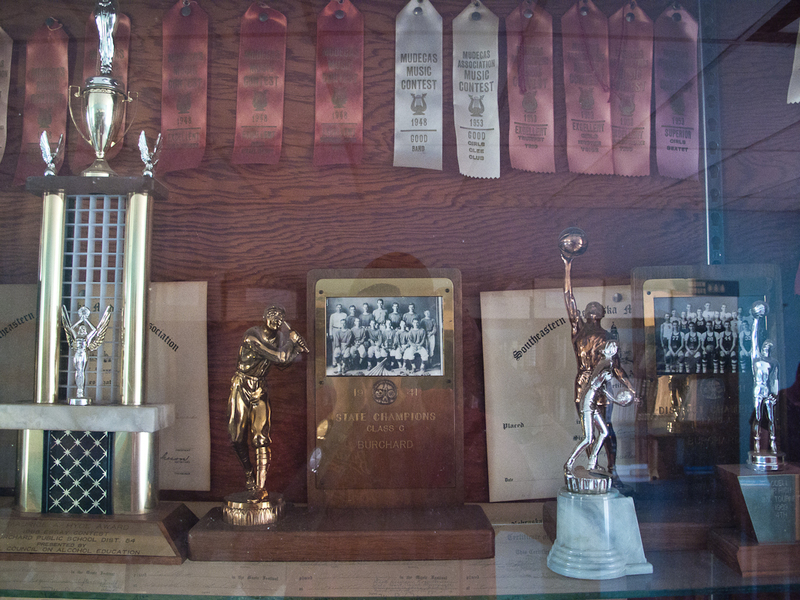 High School trophies and ribbons dating back to the 1930s were in a dusty display case. Dozens of mysterious small white crosses were in boxes. Old books and magazines were on the shelves. 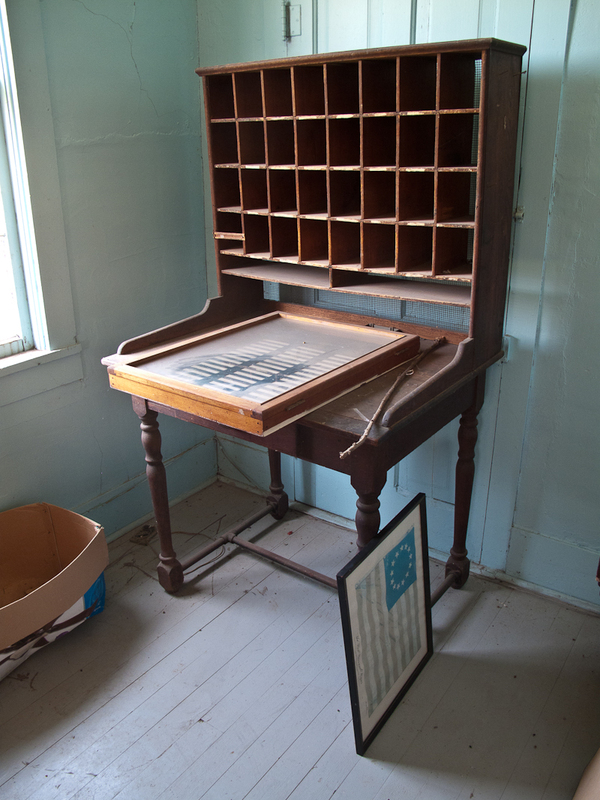 A beautiful wooden desk sat next to a window. 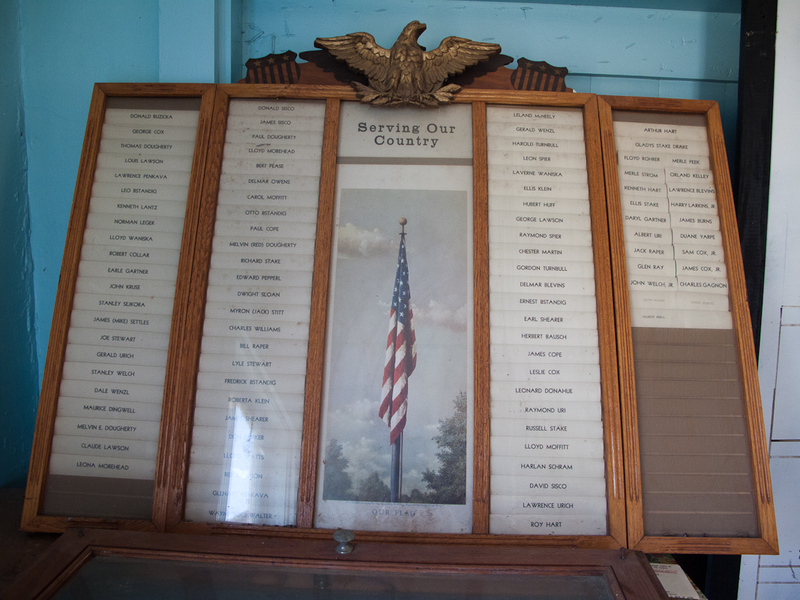 It had little wooden boxes each with the names of Nebraska cities. 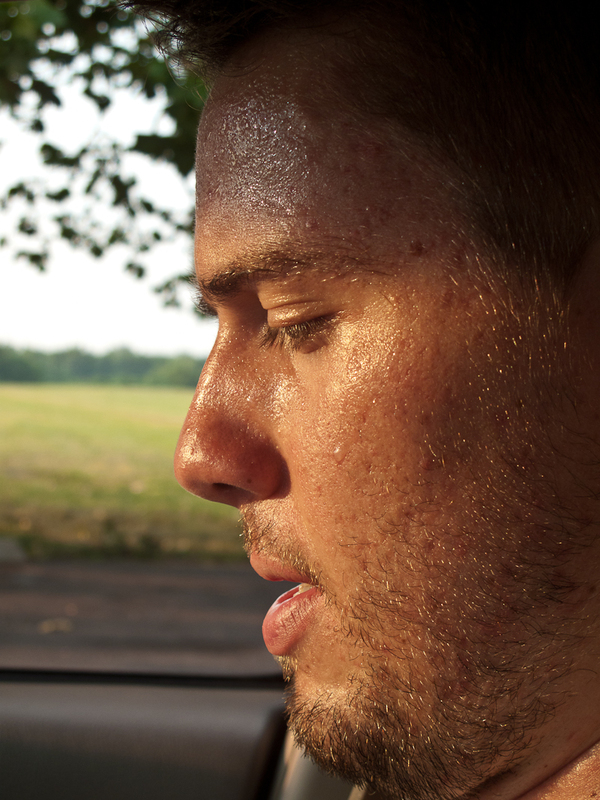 It was stifling inside and as I photographed I was literally dripping with sweat. We stopped briefly at the Homestead Act National Monument that was celebrating the 150th anniversary of this pioneering legislation. Walker and I had an interesting debate over whether this Act (generally seen as a good thing) was worthwhile. Undoubtedly it was crucial to the settling of the area. 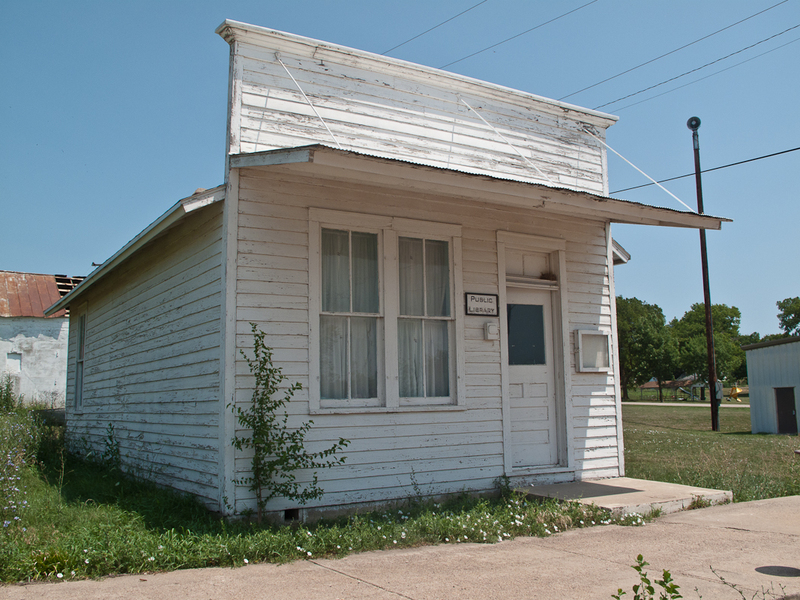 We tried to find a library in another small town but was told it had been torn down. 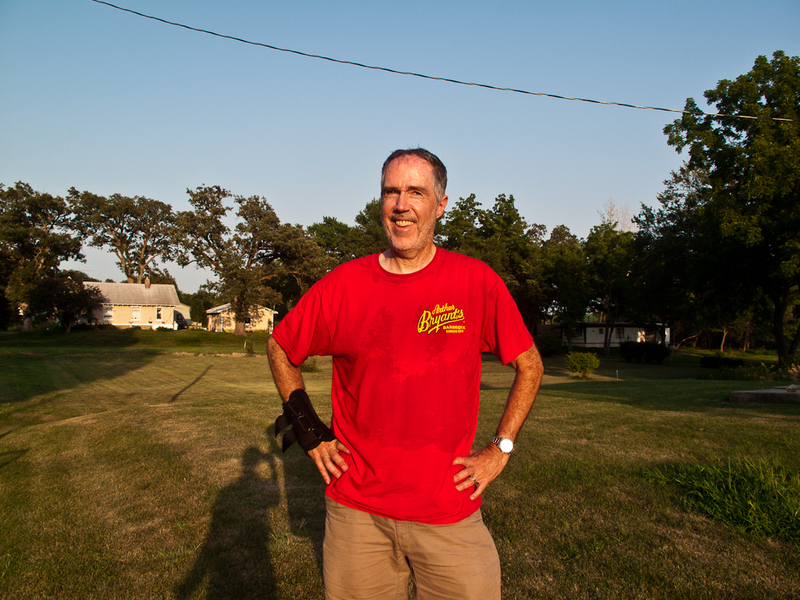 It was still well over 100 degrees when we came to Lincoln, NE. Because it was a holiday everything was closed including the library. I quickly photographed the exterior and jumped back into the car. We have been listening to “The Peoples History of the United States” and the reader Matt Damon was speaking about the Vietnam War period. For some reason when he started talking about Ron Kovac, the crippled veteran turned anti-war activist I really got choked up. He had written a book called “Born On the Fourth of July” about his experiences that later became a famous movie. 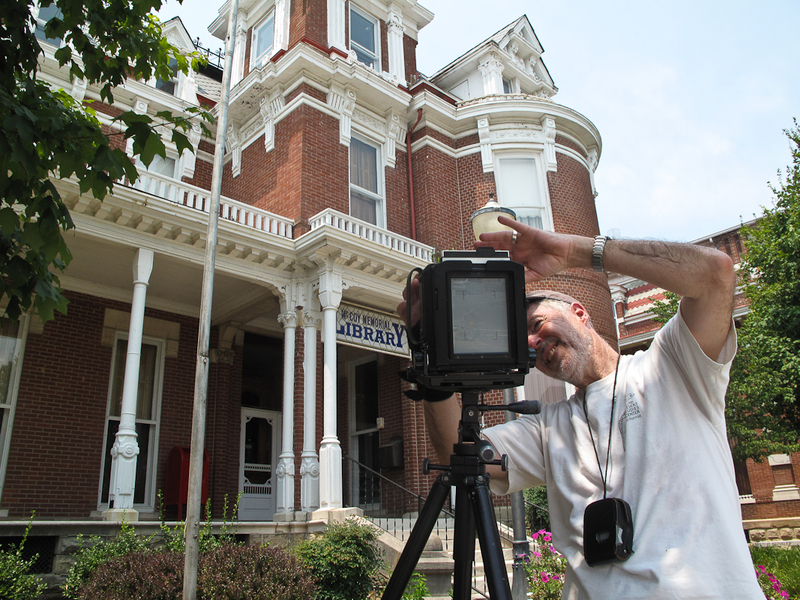 Here we were in the heat of the Heartland on the 4th of July photographing America’s public libraries. I started to think back to when I was Walker’s age living through those chaotic, revolutionary times of the Vietnam War. 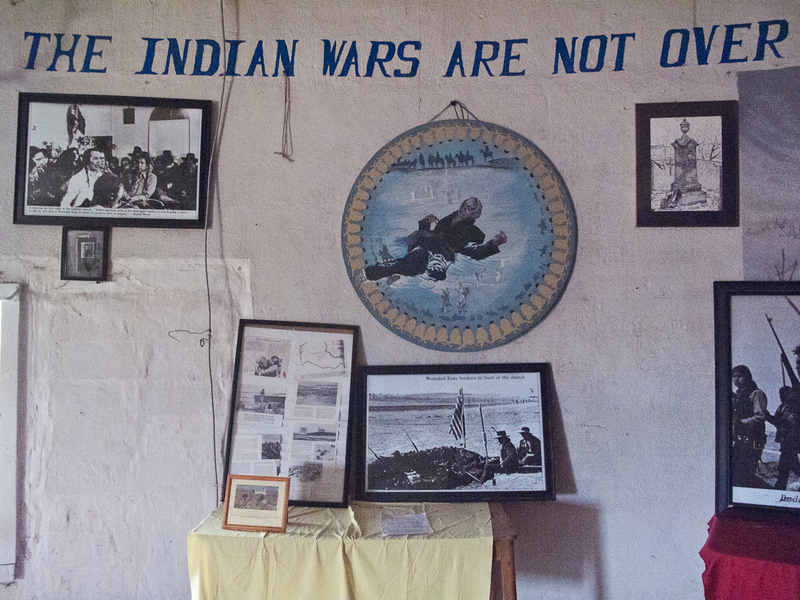 Each generation has its own cross to bear and ours was that war way back when. 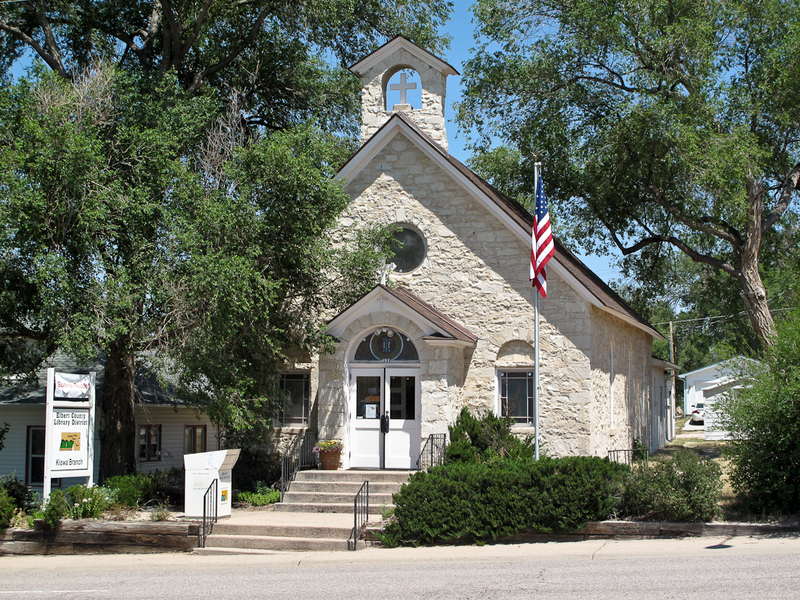 Weeping Water, NE got the award for the most poetic name for a library and a town. The library was originally built as a church and academy before it became a library. 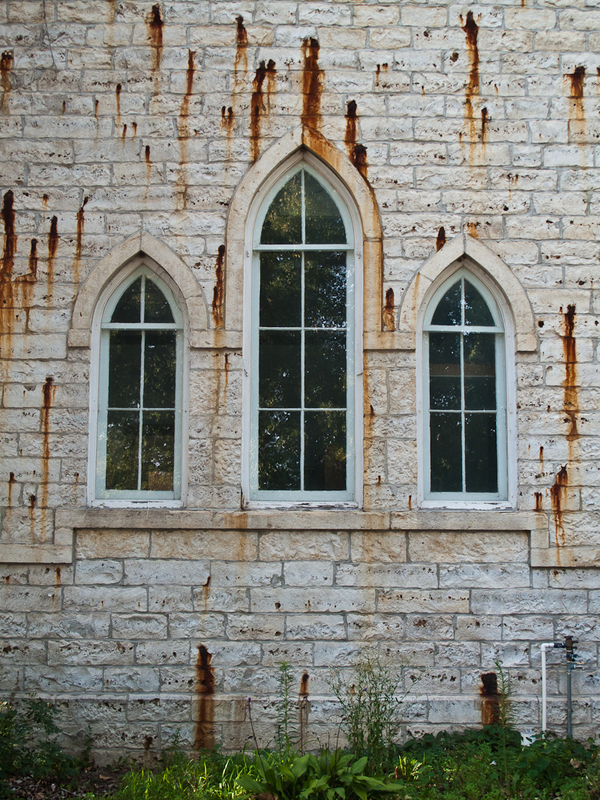 The old limestone walls exuded rust colored stains that made the library look like it was weeping blood. It was a strange but fascinating effect. 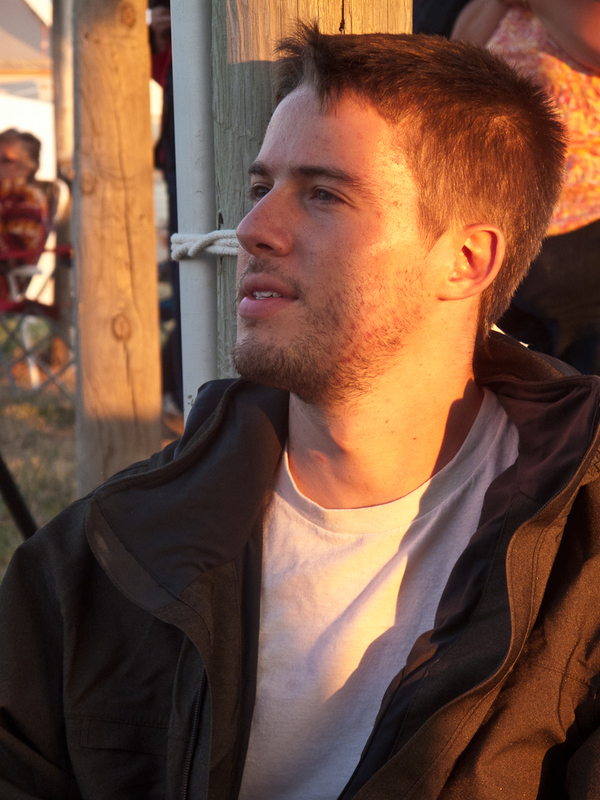 After driving many miles on dirt roads we were hot and exhausted but we stopped for one more library in Wehawka, NE. 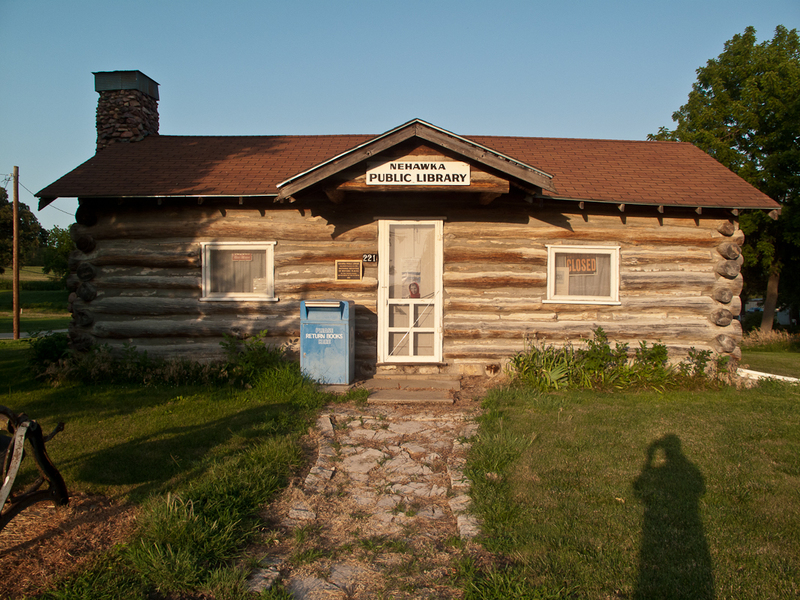 In the last sunlight I photographed this incredible log cabin library. 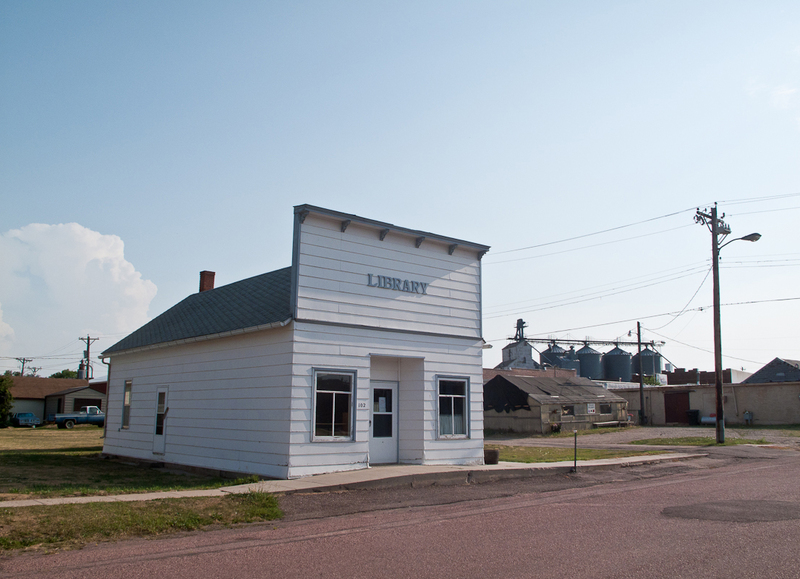 Nebraska has great libraries and the state gave us a good look into rural, mid-Western America. We ended the day in Omaha, NE and I felt like we had accomplished much during our long dive. As we watched the fireworks from our hotel I felt glad we were doing this project. 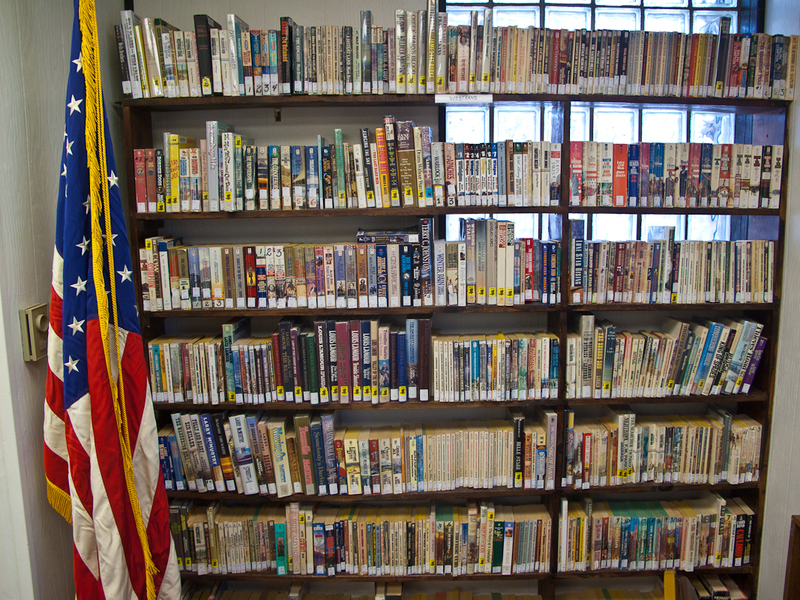 In a way, it is our chance to understand this big, complex, fascinating country through its public libraries. 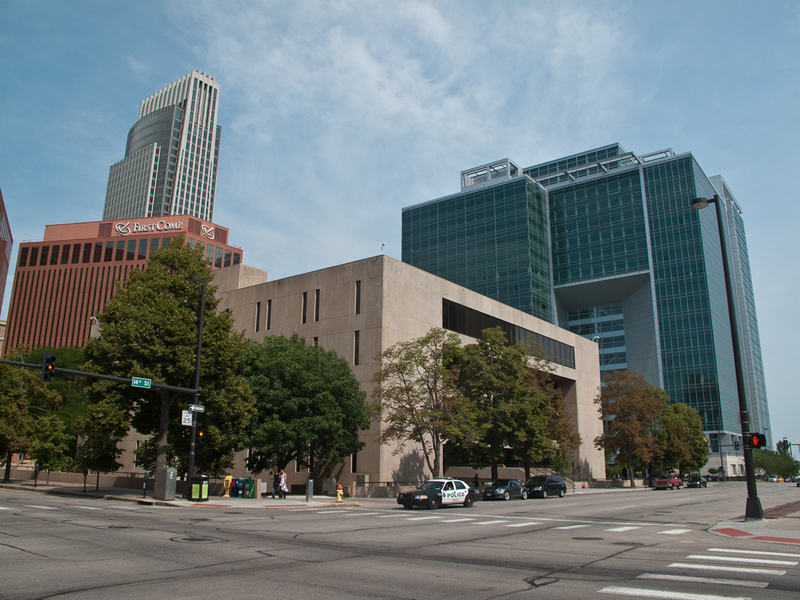 7/5/12 – The Central Library in Omaha was plain and boxy. But it was representative of a style of modern, utilitarian, urban architecture that is fairly typical throughout the nation. 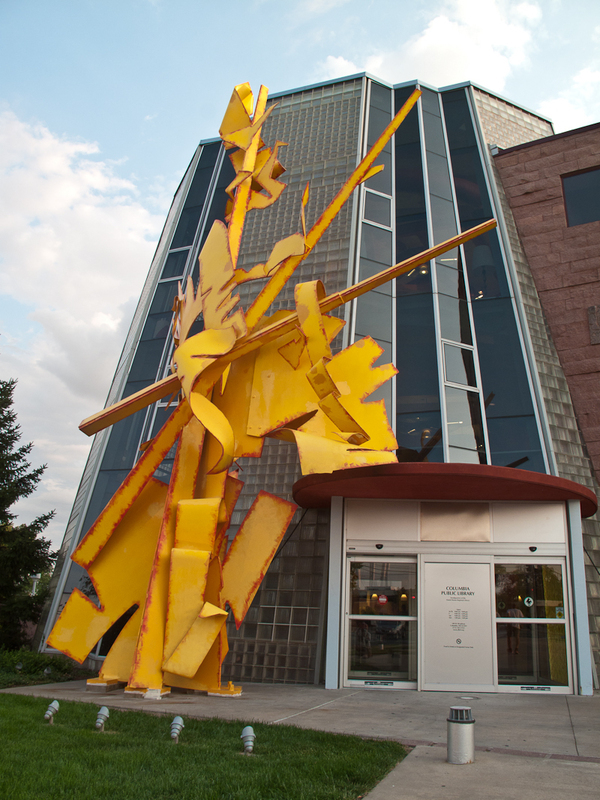 I hesitated but finally decided to photograph this library that was nicely situated amongst Omaha’s tall buildings. Also, this site was the location for the famous photographers William Henry Jackson’s first studio. His adult life spanned from the Civil War to WWII. He was best known as a photographer for the great 19th century geological surveys of the American West including the first one into Yellowstone. His photographs of that area were used in the effort to create the world’s first National Park. 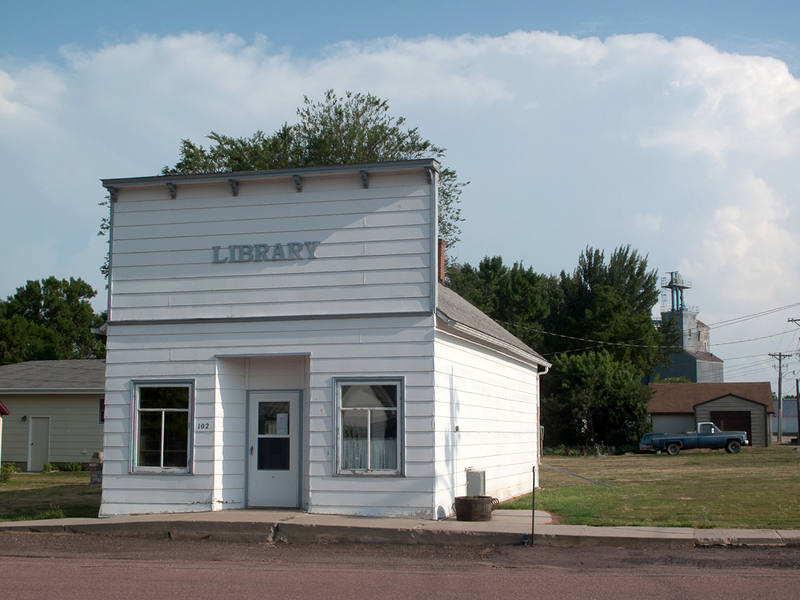 The small library in Wisner, NE had potential. Great silos and towers loomed in the background but from the street they were hard to see. I tried to go into every story across the street from the library to ask if I could photograph from the roof. Every one was shut as was much of the town including the library. It is hard to believe that Nebraska had so many topnotch libraries. 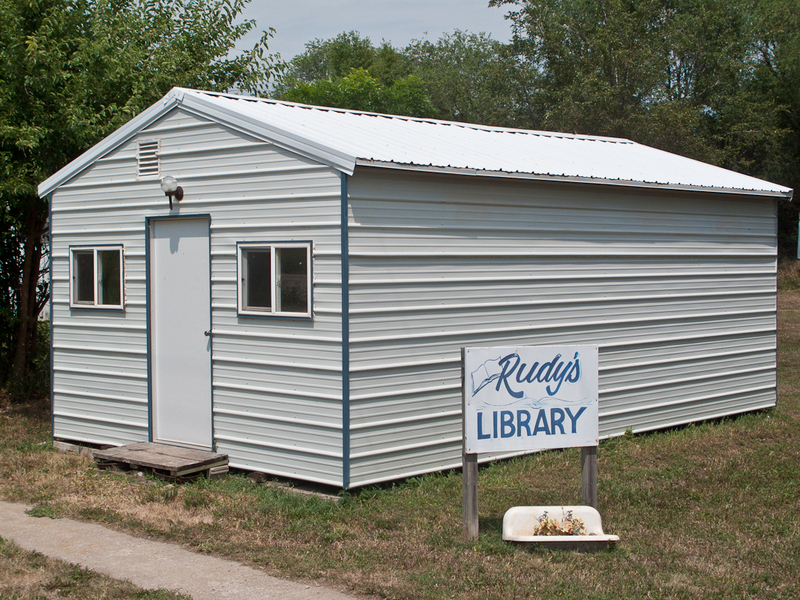 Rudy’s Library in Monowi, NE was one of them. 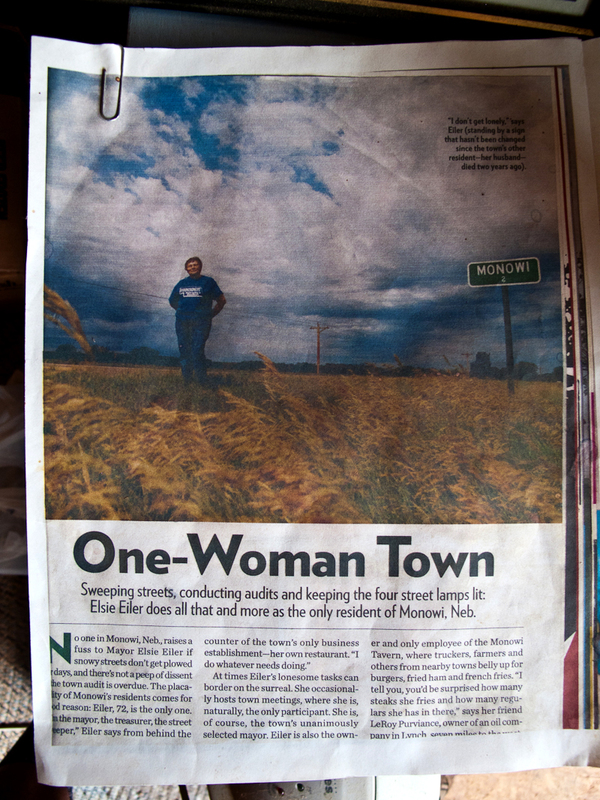 The entire population of this town consists of one woman, Elsie Eiler. She runs the only business in town, a local roadhouse. 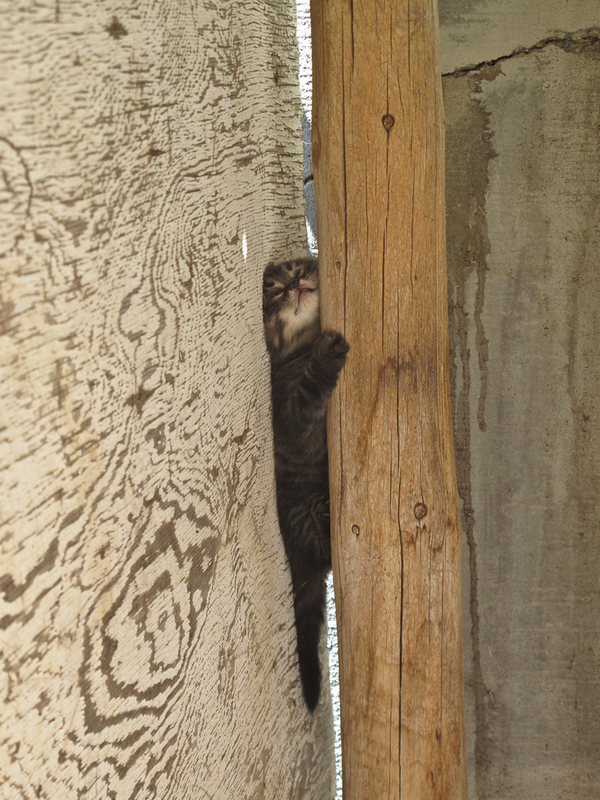 Over the years she watched all the other town residents move away or pass away. 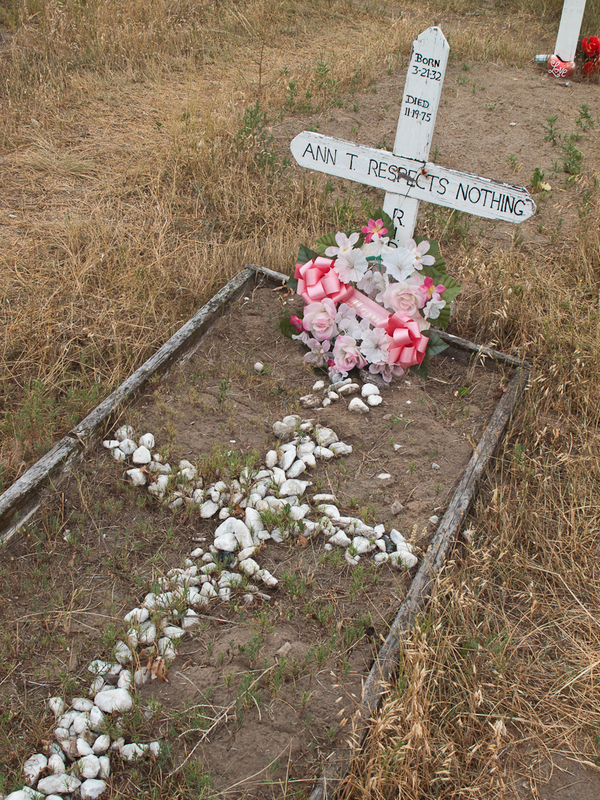 Her husband Rudy died a few years ago. 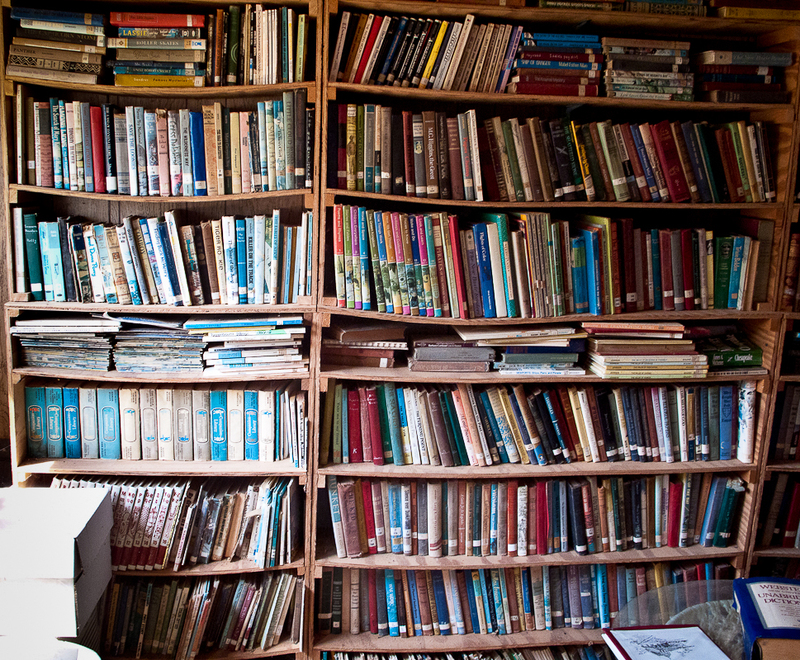 Because he had collected so many books she decided to pen Rudy’s Library in a small shed next to her home. The memorial to her husband was free and open all the time. 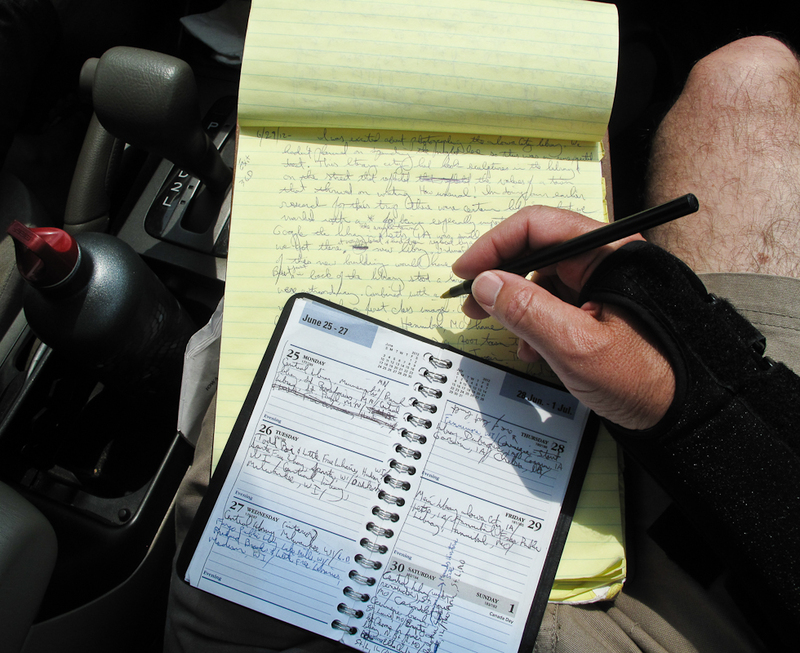 People can self-check out books by signing a notebook and return them when they are done. People from all over had checked out books and presumably mailed them back later. Again, the shed was stifling hot with seat pouring off our faces and hands making the photography a little slippery. I happily photographed the old books, magazines and newspapers. 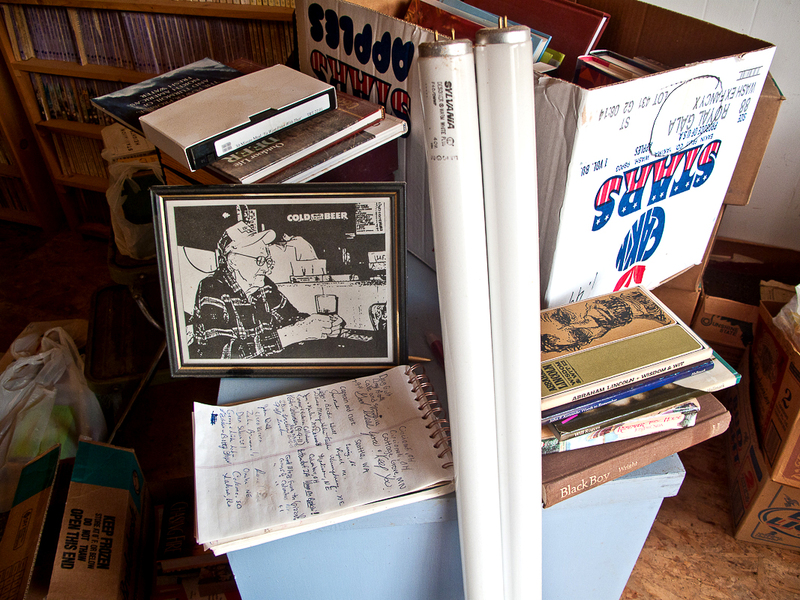 Some of the papers dated back to the 1940s. 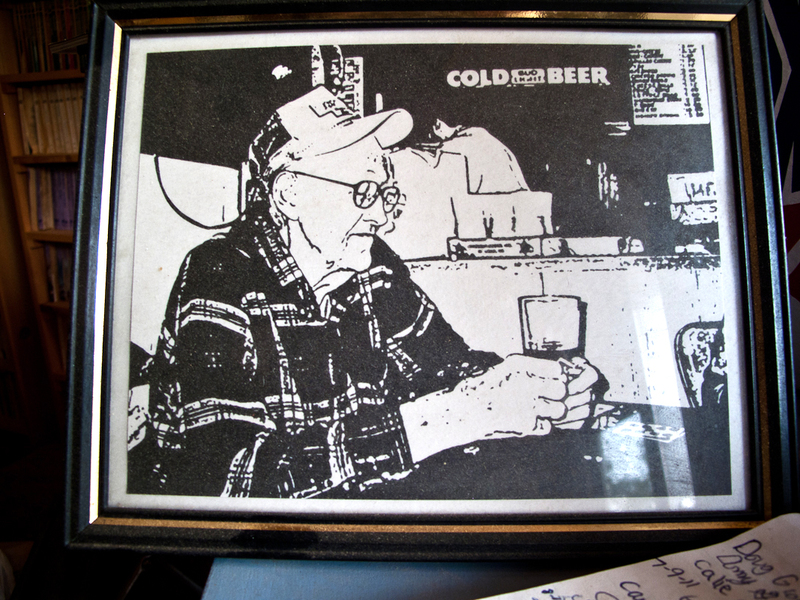 I photographed a magazine article about Elsie and an etching of Rudy having a beer in the bar. A wooden sign off in the corner simply stated “Rudy’s Dream”. After I finished I walked into the roadhouse, bought a cold soda and thanked Elsie for creating such a memorable library. 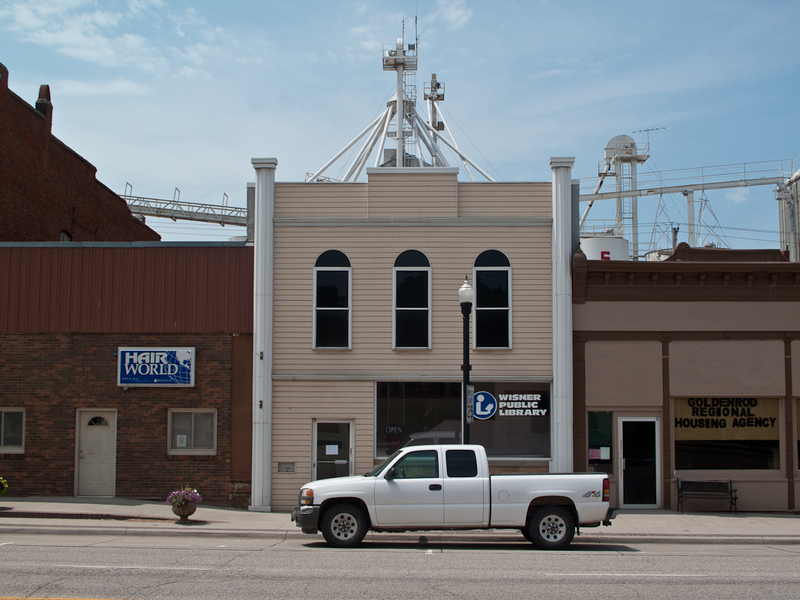 Our next step was in the tiny town of Lynch, NE. Its library had a simple style and the late afternoon light made it beautiful. One reason we found so many good libraries in Nebraska was because of Walker’s research. He discovered a Flickr page that sowed every library in this state and we were able to narrow it down to the most interesting ones on our route. Missouri came from a Google search for libraries in Nebraska. Little by little our research from many different sources produced the Library Road Trip for 2012. We entered into South Dakota again and soon crossed the Missouri River. 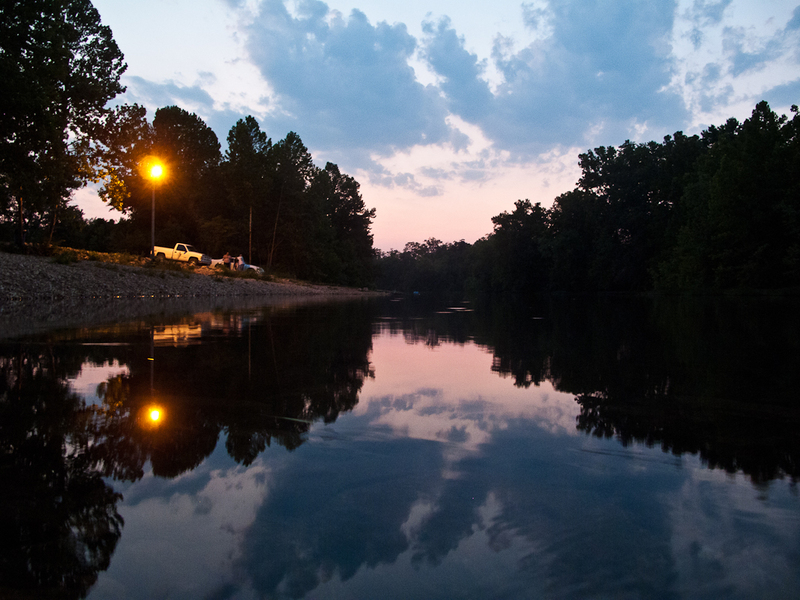 We had been driving north since the Ozarks and we could really tell the difference in the longer hours of daylight. 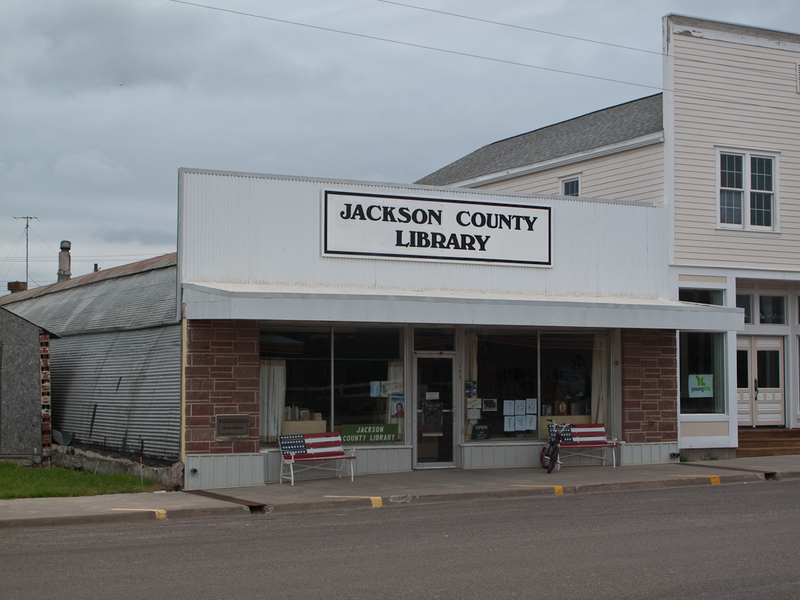 Our last library today was in Tripp, SD. This small farm town had a beautiful country library that glowed in the setting sun. Behind it towered a huge bank of clouds that seemed to envelop the whole blooming sky. We finished the drive at dusk in Mitchell, SD. We ended the day with our usual routine of a Mexican dinner, changing the 4X5 film in the motel bathroom, downloading the digital photos and then we crashed. 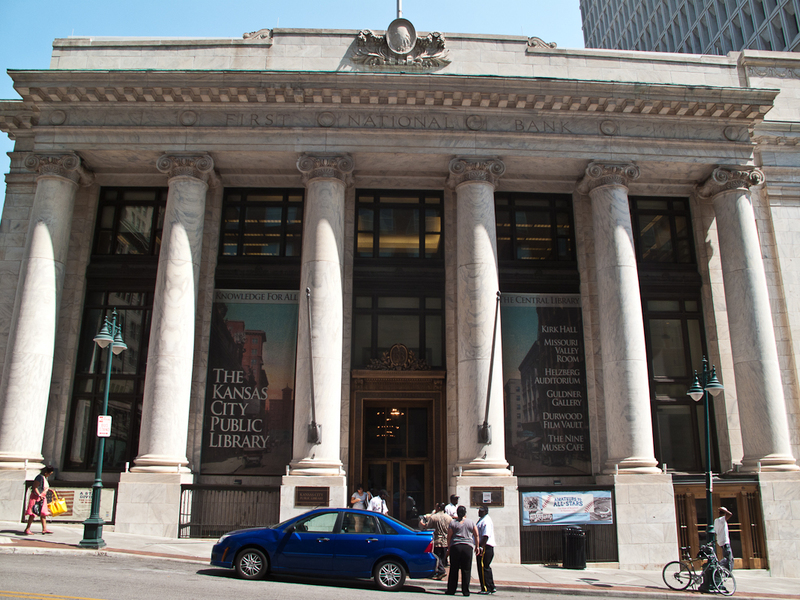 7/3/12- The Central Library in Kansas City, MO is housed in a former bank. 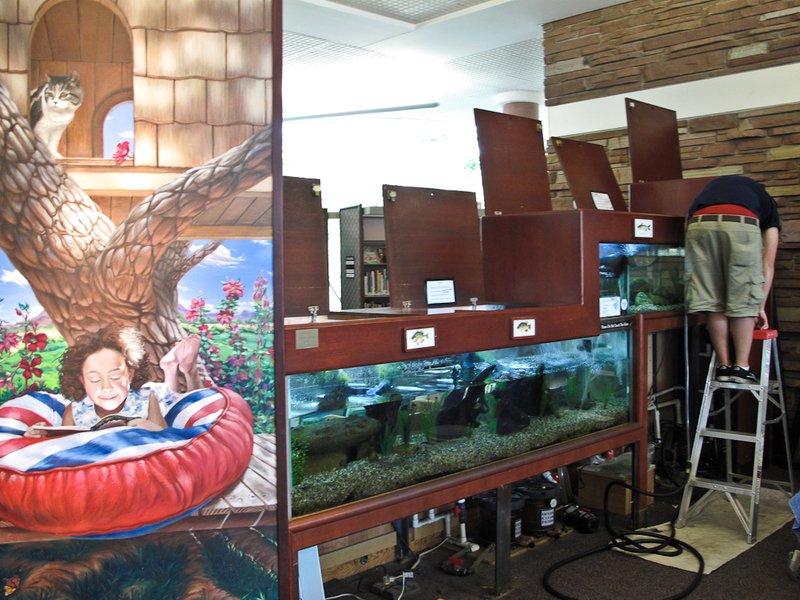 I had initially been attracted to this library because of the large book murals I had seen on Google and the library website. 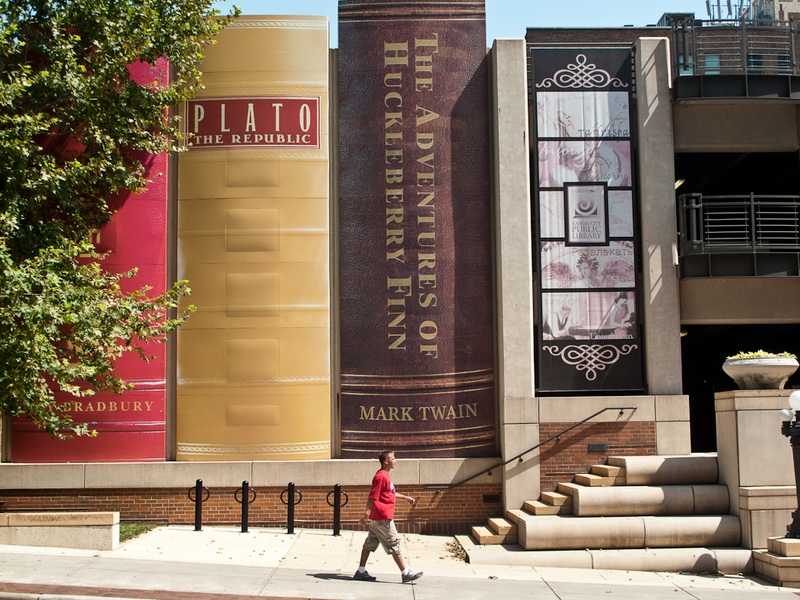 It turned out that the murals were on a nearby parking structure next to the stunning library. 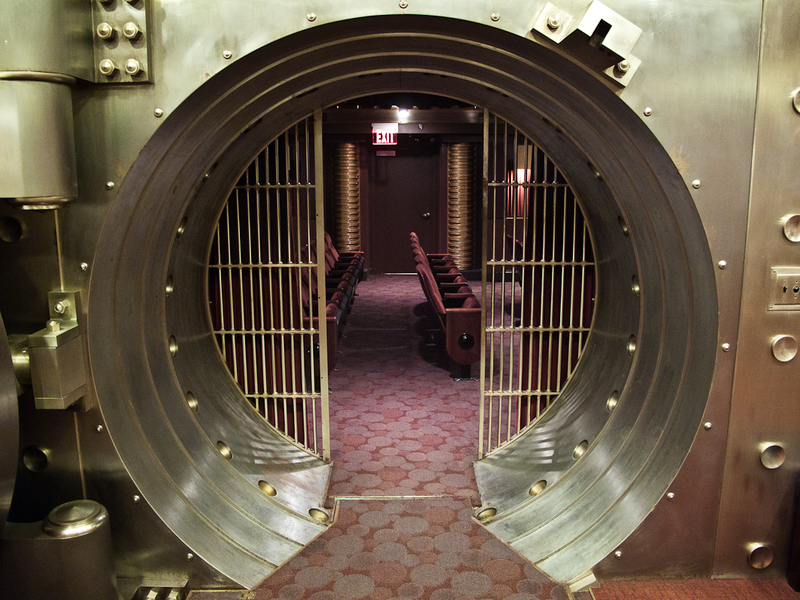 Inside the early 20th century design for a large bank was everywhere. Big columns, a large entrance and dark wood paneling gave the impression of dignity and authority. Downtown Kansas City was going through urban renewal and this former bank-now-library served as an anchor for it. One of the most interesting parts of the library was the old bank vault. It had been turned into a movie theater where they now showed free movies. It reminded me of some of the original Carnegie libraries that I photographed last summer in Pittsburgh. These first Carnegies were intended as more than just a place for books. They included gymnasiums, basketball courts, swimming pools and luxurious theaters. 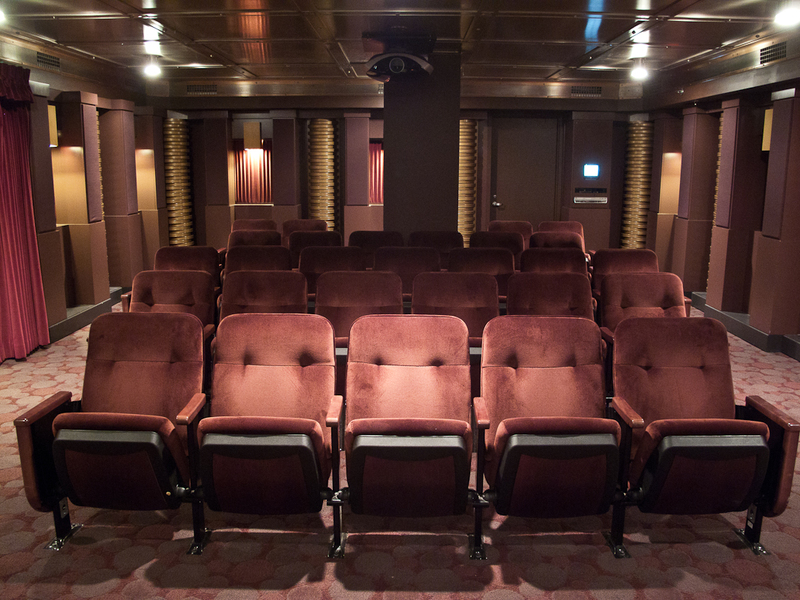 The small movie theater in the Kansas City library showed how some of our contemporary thinking about libraries is connected to the early Carnegie ideals. There was a large homeless population in and around the Kansas City library. It was over 100 degrees outside and I could understand the attraction of a large, beautiful, air-conditioned refuge. But the aimless wandering of some of these sad people clashed in a weird way with the luxurious setting of the beautiful building. 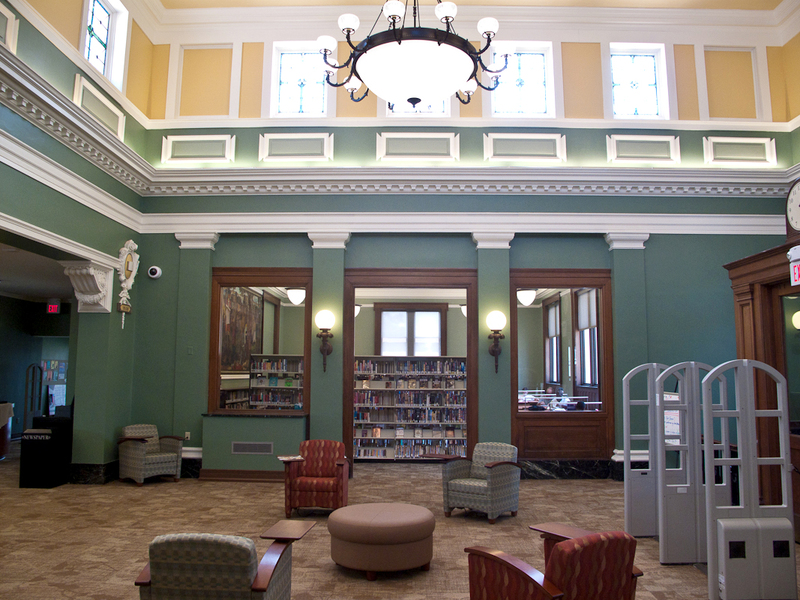 Until our society can find a way to compassionately help the mentally ill or the poor or the homeless this part of our nation will continue to use the public library as an opulent sanctuary. 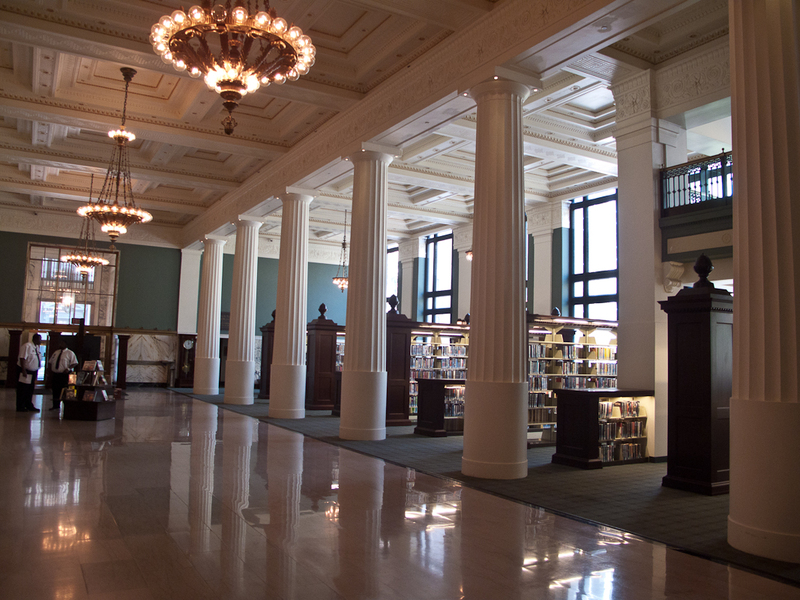 I spent several hours admiring and trying to understand the Kansas City library. Two hours later we drove across the river into Kansas. Because the distances were large and we had started late we were only able to photograph one library in Kansas. But it was a great one. 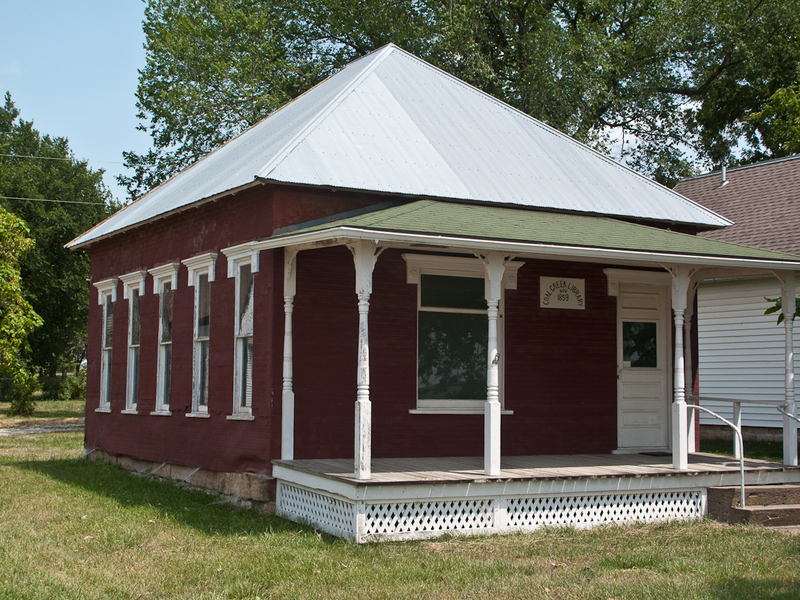 The Coal Creek Library was founded in 1859 and this building was built in 1900. 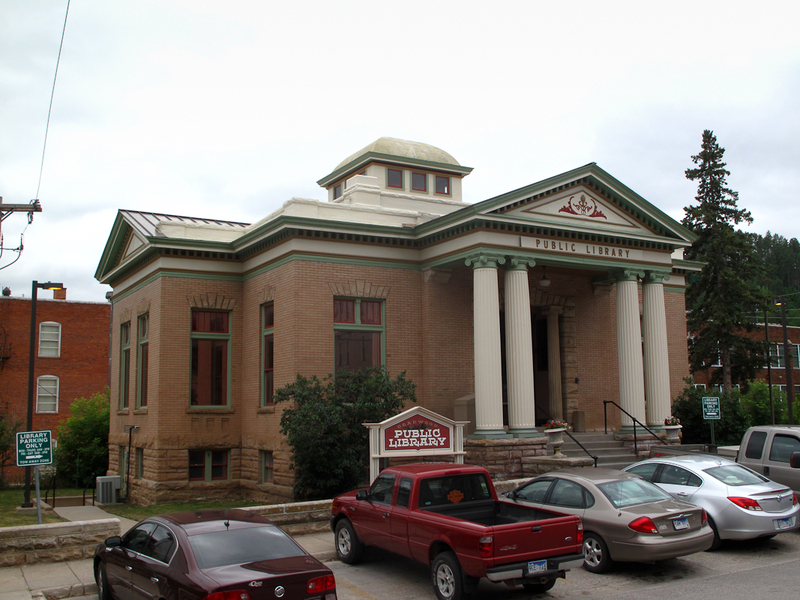 It was the oldest subscription library in Kansas and the oldest west of the Mississippi River. 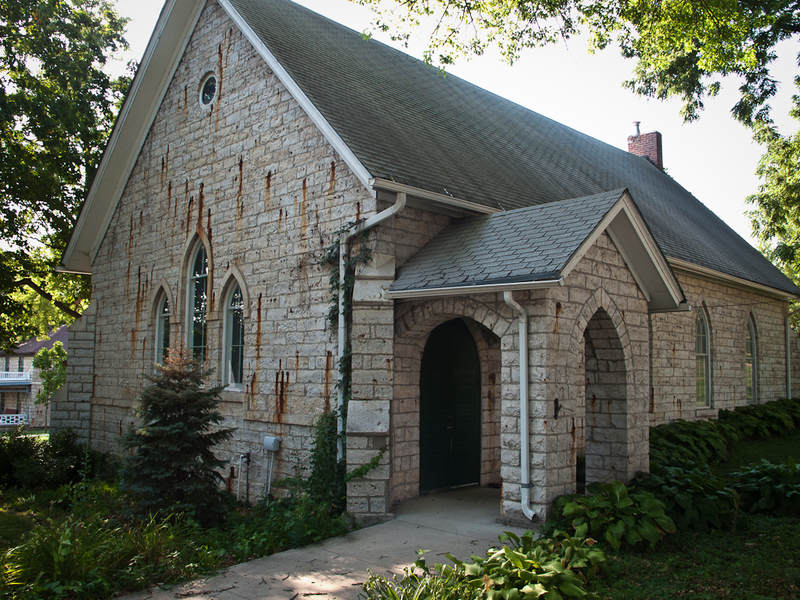 It was listed on the National Register of Historic Places. 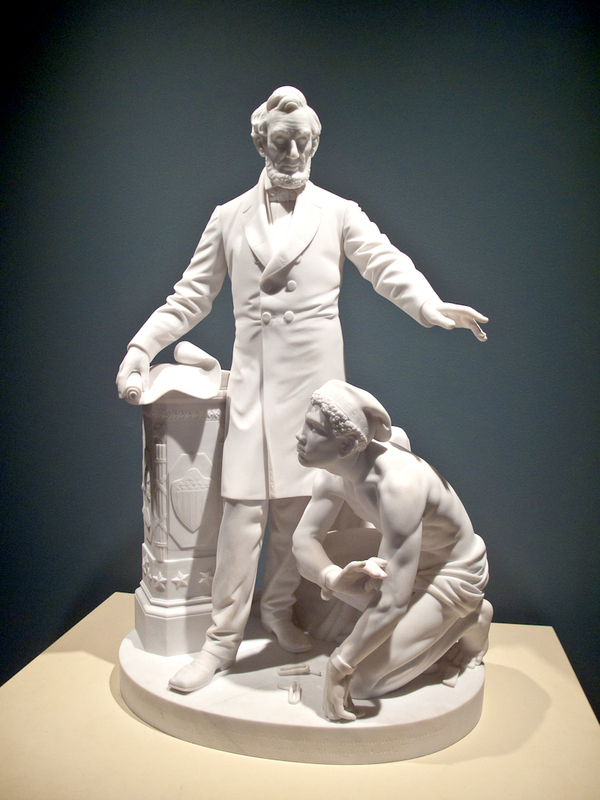 Abolitionists called Jayhawkers founded the community and it was in the pre-Civil War violence called Bleeding Kansas. I spent over an hour in the +100 degree heat photographing this link to the past. 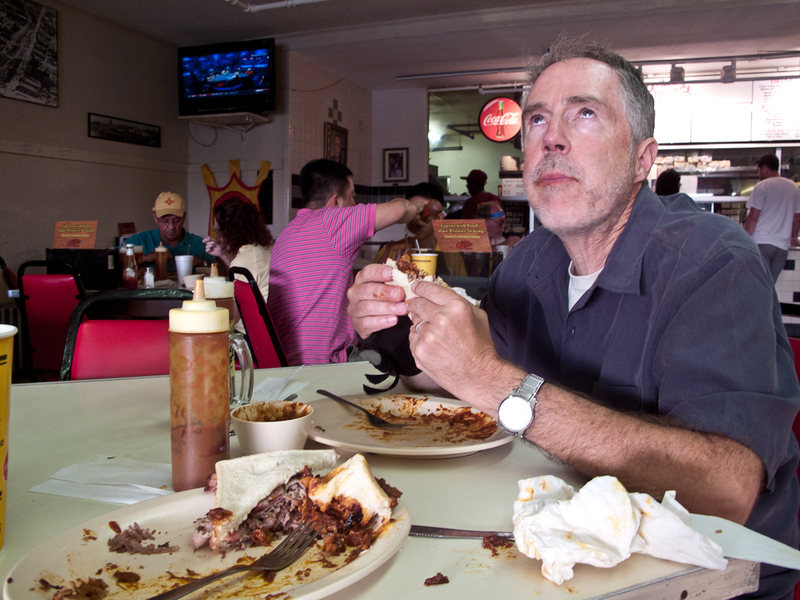 We drove back to Missouri and went to a Kansas City barbeque landmark – Arthur Bryant’s. 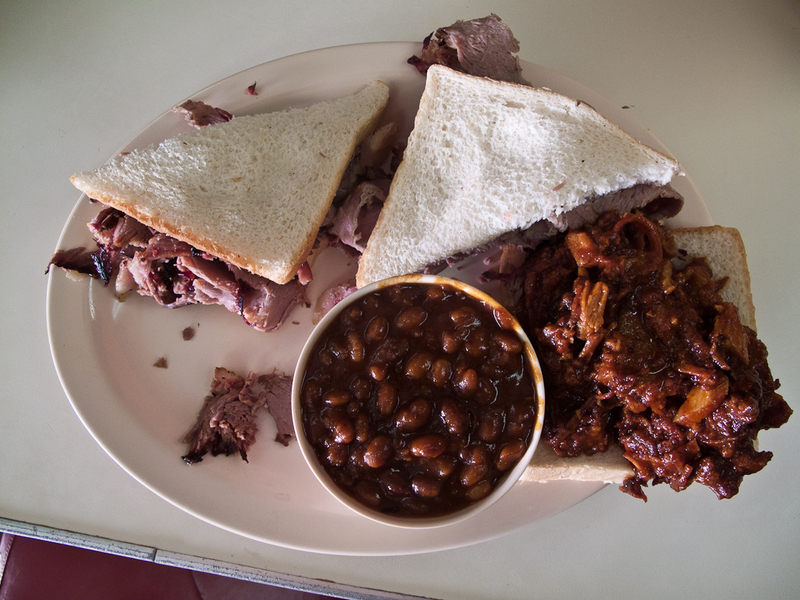 As I later wrote to my friend Craig Weiss this was the “best damn barbeque on the trip”. After eating our way through Texas and Oklahoma last summer we had high standards. But unlike last summer this incredible place was a black owned, urban steak house that was as plain on the inside as the food was good. Photos of customers included Danny Glover, President Jimmy Carter, candidate John McCain and (gasp!) Sarah Palin. After dinner we needed to walk off the rich meal. Walker discovered the National WWI Memorial. 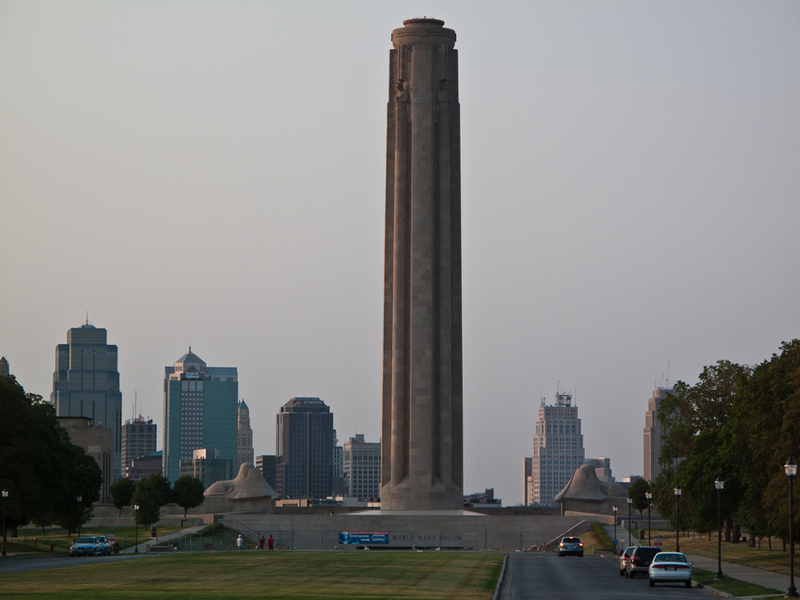 It was a stunning monument built in Egyptian Revival Deco style in the 1920s with great views of the downtown. It was huge and almost Stalinist in concept and scale. It would be appropriate on the National Mall in Washington, DC. We wondered why this monument to a war in Europe was built here. Perhaps it was because we are near the geographic center of the US. Perhaps it had something to do with Kansas City itself. This City has been called the Paris of the Plains because of its great architecture, broad boulevards and tree-lined streets. It has the second largest number of fountains of any city in the world after Rome. 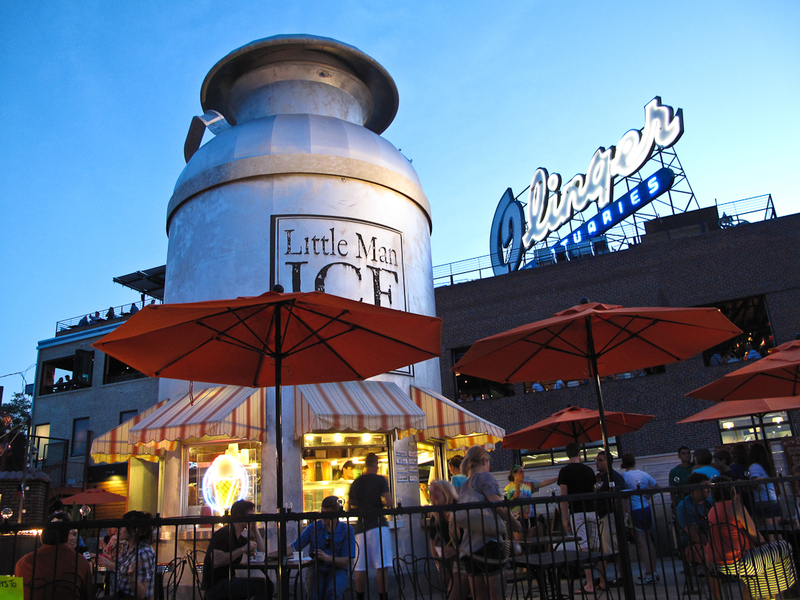 Disproportionate to its size, it has made a huge contribution to American culture through its jazz music and food. We looked out over this beautiful place and savored the meal, the heat and the sunset. 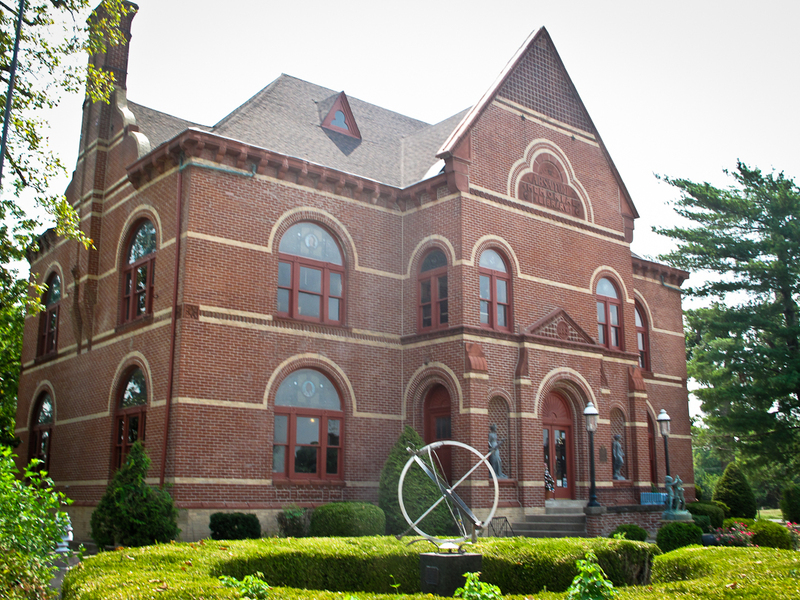 7/1/12 – The two southern Illinois towns of McLeansboro and Cairo were way off our route but had incredible libraries. We had tried to go to Cairo last summer but we just couldn’t make it fit our tight schedule. Today we plunged into the heat and humidity determined to make it work this time. 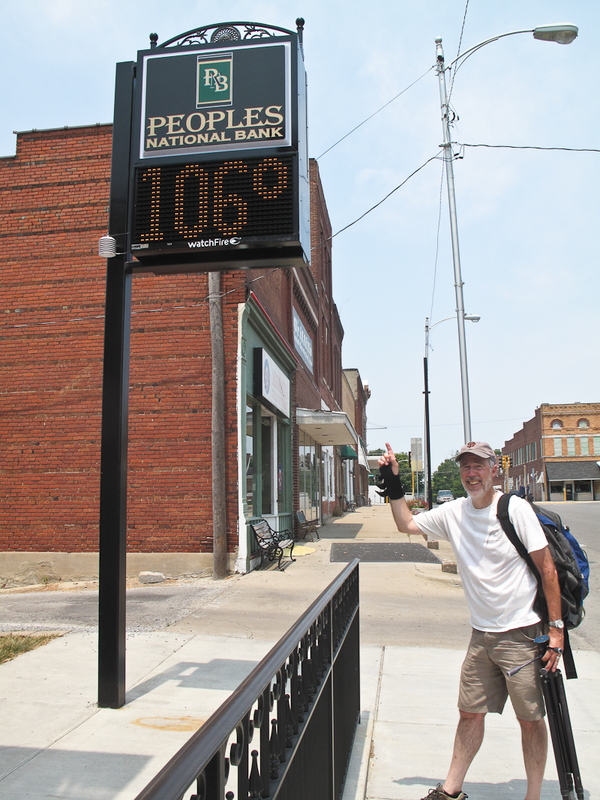 The sign next to the library in McLeansbooro said 106 degrees but later went up to 108 degrees at 1:08 in the afternoon. The library was closed on this Sunday but was truly a gem. The town was closed up tight with only the Dairy Queen open. Even the charity run had been cancelled because of the oppressive heat. We drove to the southern tip of Illinois and entered the northern edge of the Mississippi Delta. 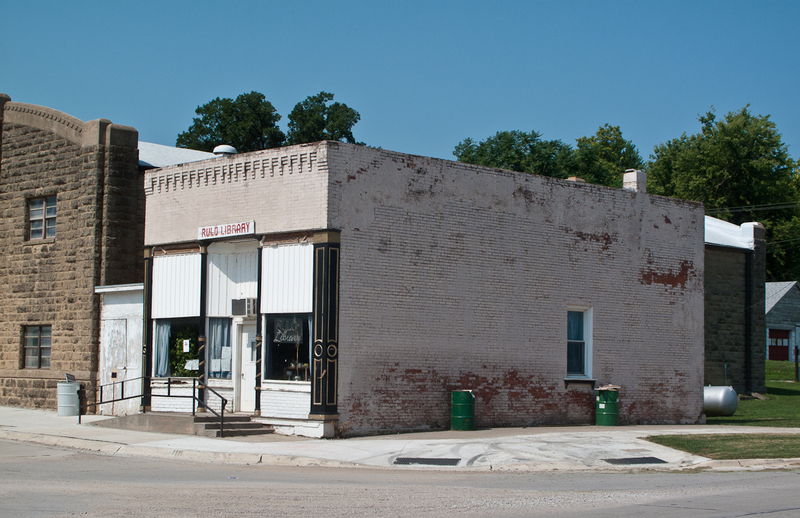 Cairo, IL was an important steamboat and shipping town during the Civil War. It had fallen on hard times and had an astonishing history of racial violence during the 20th century. I gasped as I read to Walker the details of this history from Wikipedia on my iPhone. Like many of the shattered towns we have visited (East St. Louis, Detroit, Newark, Camden) it had an incredible library built during better times. Walker literally ran around the almost empty town taking pictures while I focused on the library. It was difficult to understand how towns that are suffering so much had once been able to produce such opulent libraries and civic infrastructure. Cairo’s racial violence was famous but so was the library, a symbol of hope and transformation. Although Illinois is considered a Northern state Cairo is culturally closer to the South. Its’ long history of black and white violence along with high unemployment eventually depopulated much of the town. Today it seemed like a collapsed city. 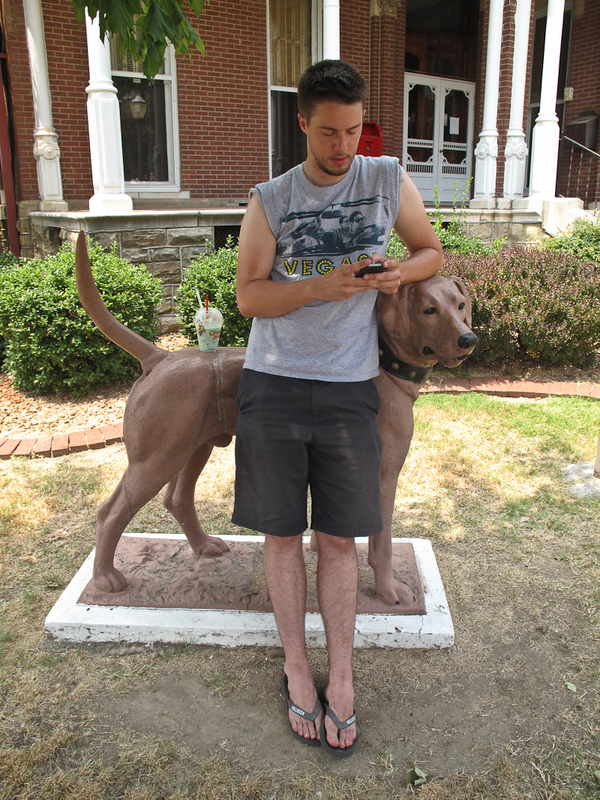 This was the southeast corner of this summer’s Library Road Trip. As we crossed the Mississippi River we turned west towards the Ozarks. Last year we had a wonderful drive through these unusual mountains with Nick Neumann. That day was mostly in Arkansas and today we were in the Missouri Ozarks. We ended our drive in the little town of Eminence, MO. This area is famous for kayaking, fishing and adventure sports and I was expecting it to be something like Moab, UT. There were some recreational tourists but mostly this was a poor, white town. We stayed in a cabin on the edge of town at the Shady Lane Motel and Cabins. I asked the clerk where she would recommend for dinner. She asked with great concern in her Southern drawl “Are you looking for a place that serves adult beverages?” I knew then that this was mostly a dry town and I went back to our cabin and drank one of our beers. 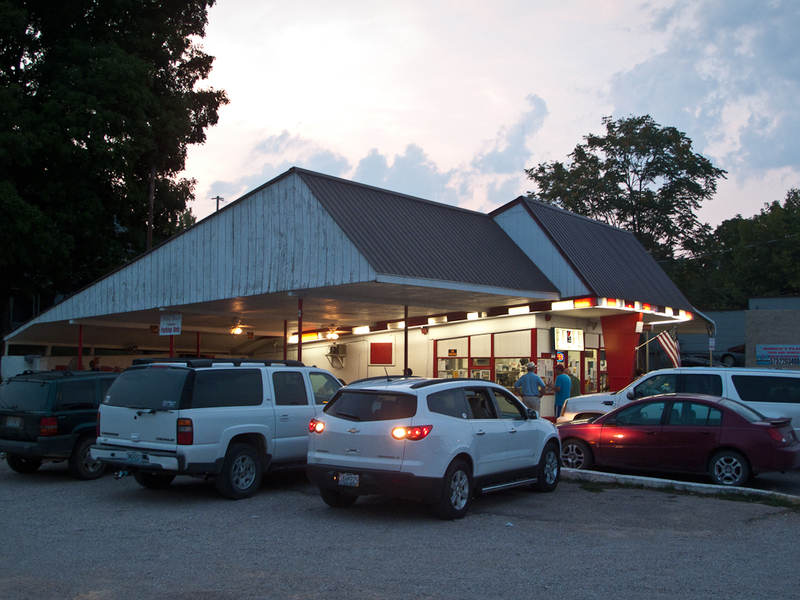 We had dinner at a drive-in restaurant called Hawg Heaven. 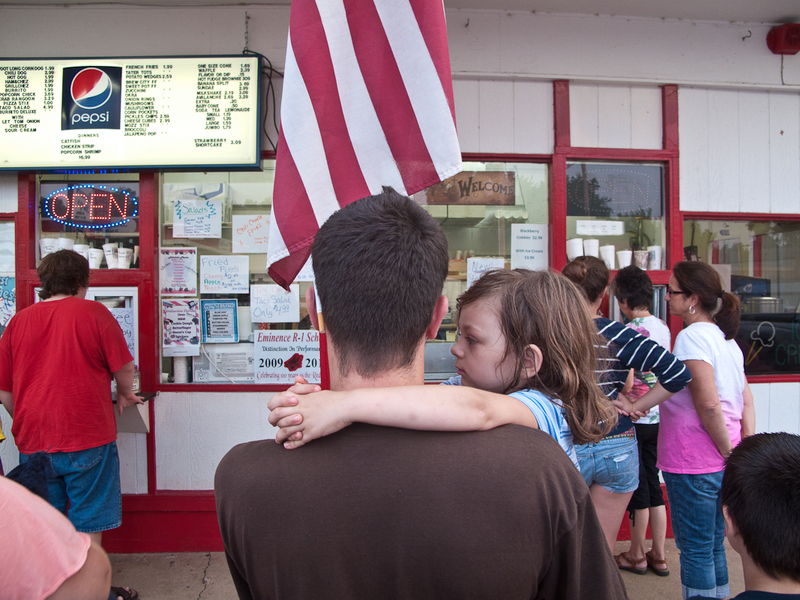 It was incredibly packed on this warm night and felt a little like our favorite rural Vermont drive-in called Sandys. Except this was Sandy on steroids. Everyone was white and either a hell raiser or a Bible thumper. Walker and I felt very out of place in our “Vegas!” and “Zzyzx” t-shirts. As it was getting dark we went down to the nearby river. The water was cool and we could see little critters scampering in the woods. The sun finally set over the good old boys with a Confederate flag on their pickup truck. 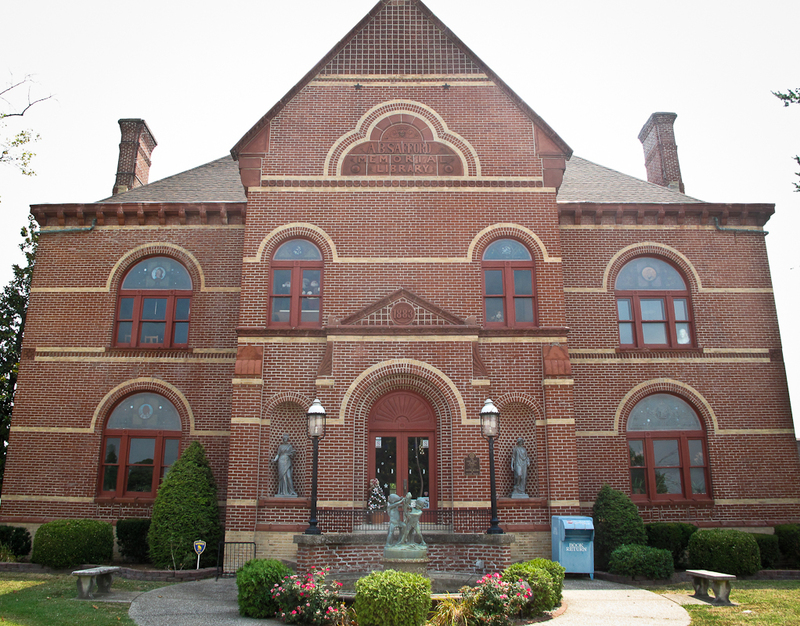 7/2/12 – Eminence had a red brick City Hall/Library combination in the center of town. 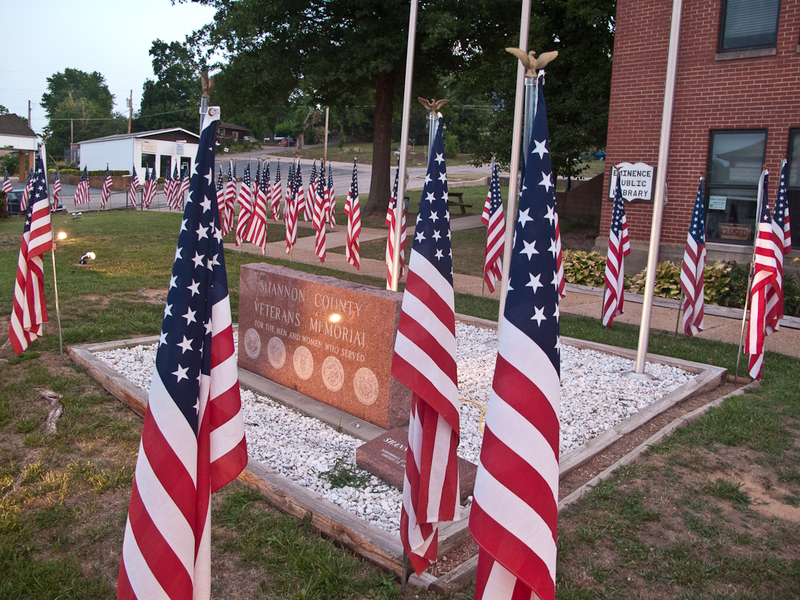 It had dozens of American flags next to the prominent Veterans Memorial. Some of the flags had the names of individual soldiers attached presumably from our recent wars. 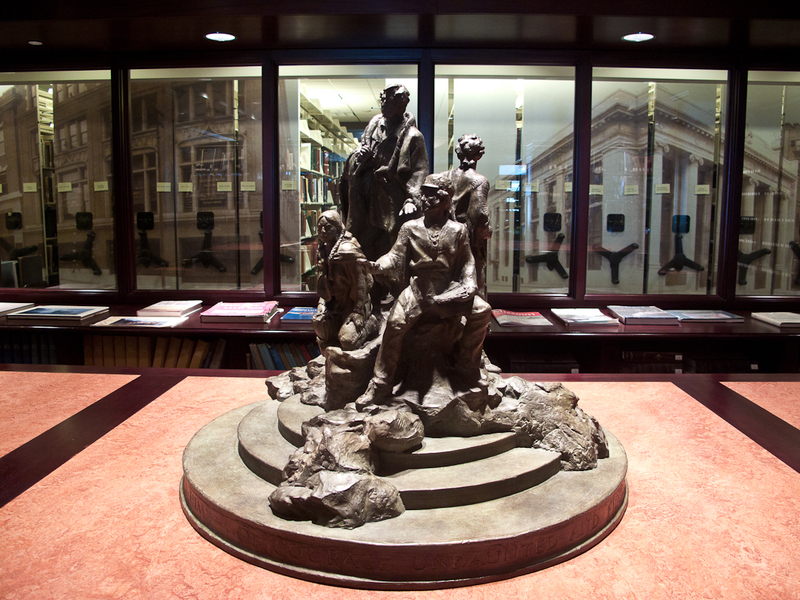 These memorials are another example of the library as a home for the collective memory of a community. 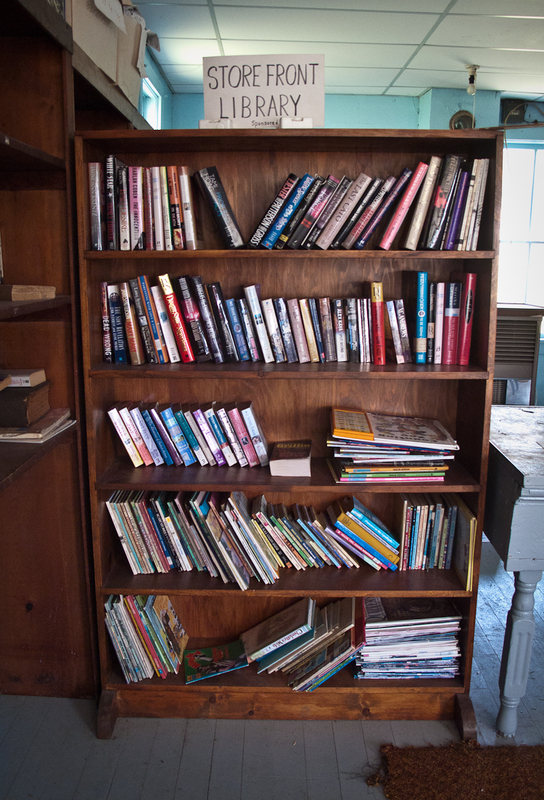 Although we photographed one small library in Bunker, MO today was more of a vacation from libraries. 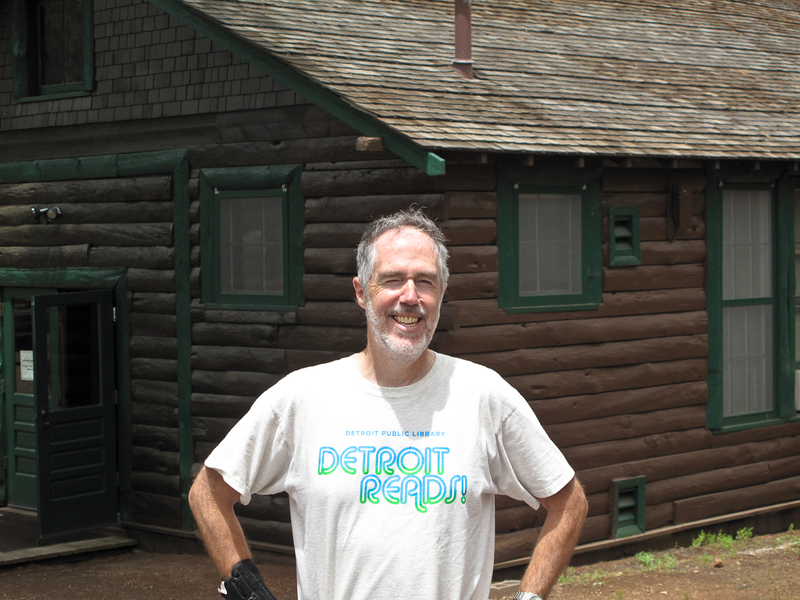 Walker had discovered a Missouri State Park called Johnson’s Shut-In. The name referred to a geological formation that was like a box canyon with a river running though it. 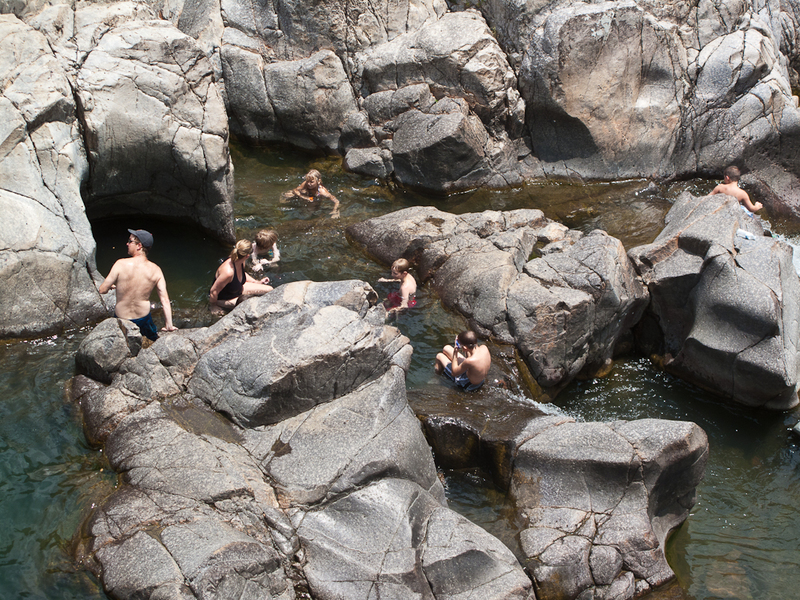 The rocks of the riverbed had been wildly eroded and there was a large, happy crowd of people splashing in the water. We enthusiastically joined them. 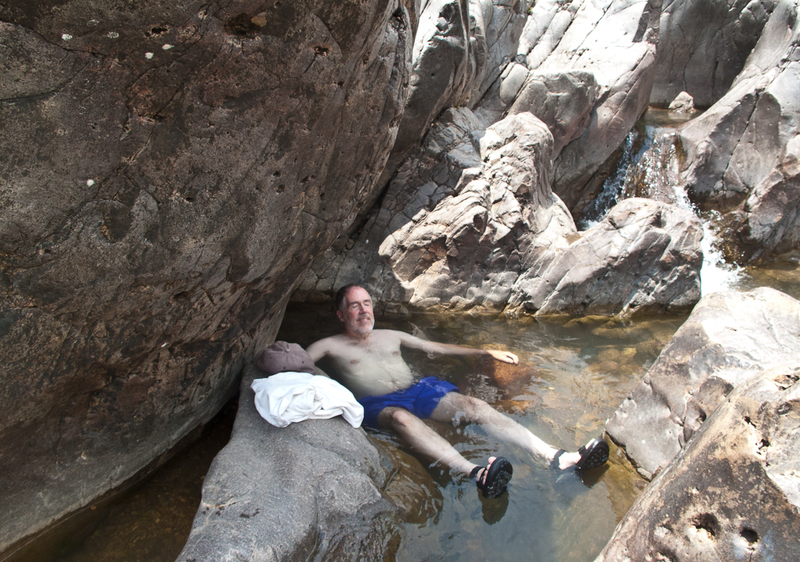 It felt great to chill in the pools of water in the middle of the Ozarks. We felt very far from San Francisco. We spoke with a man floating in the water who told us about the extreme meth problem throughout this area. The white poverty we had seen reminded us of the movie “Winters Bone”. 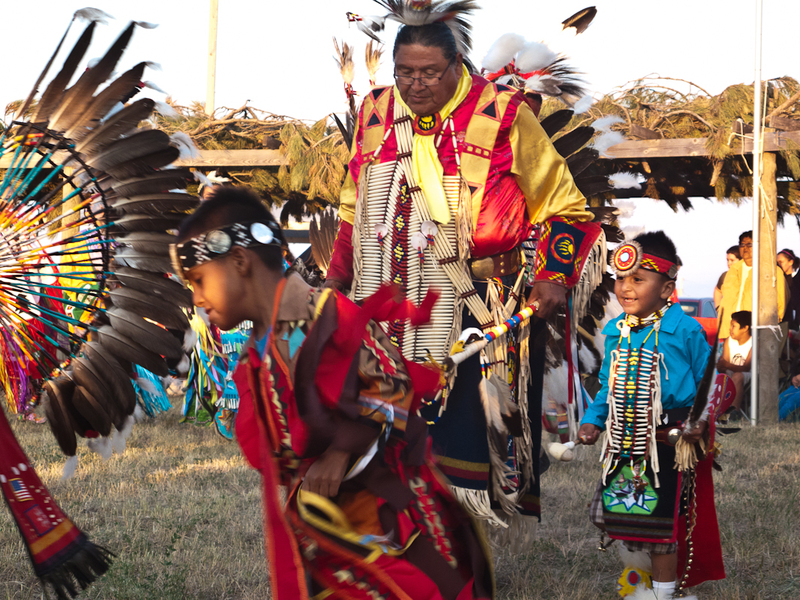 This area is both culturally and geographically remote from the rest of the US. The twisty roads and the isolated valleys help create pockets of poverty where the production of meth for some seemed like the only way out. 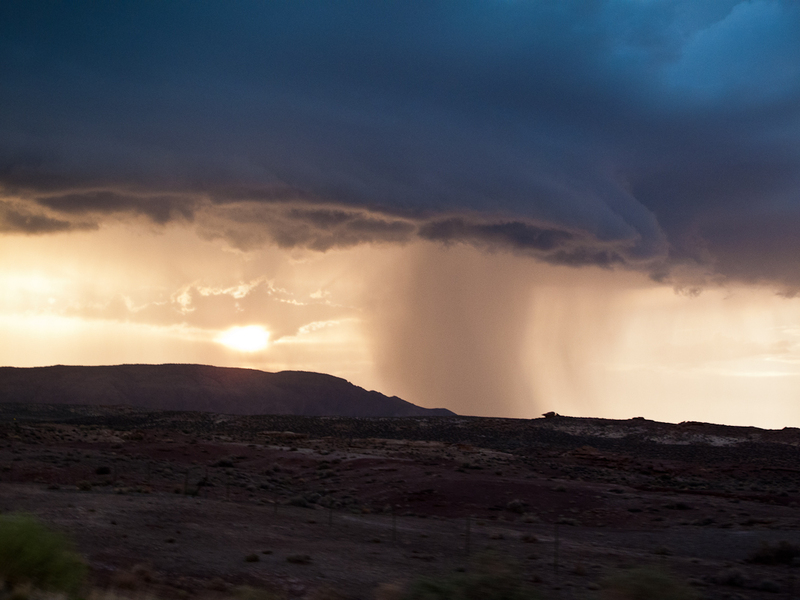 We drove north through occasional pounding rainstorms that helped cool the temperature below 100 degrees. 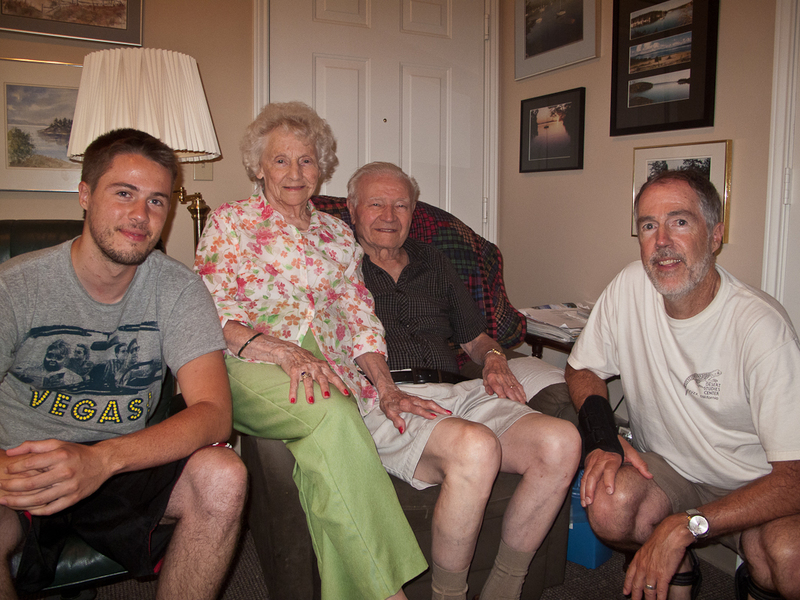 After many hours we arrived in Columbia, MO to visit the parents of our friend Michael Black. Flos and George Black are in their 90s and in a very nice retirement home. When we left it was a bittersweet departure and we hoped to see them again soon. As we drove west we finished our book on CD called “1491”. We immediately started a new book on CD called “A People History of the United States” by Howard Zinn. I had read it before but purchased the CD set because I thought Walker would enjoy it. We ended our long drive in Kansas City, MO. 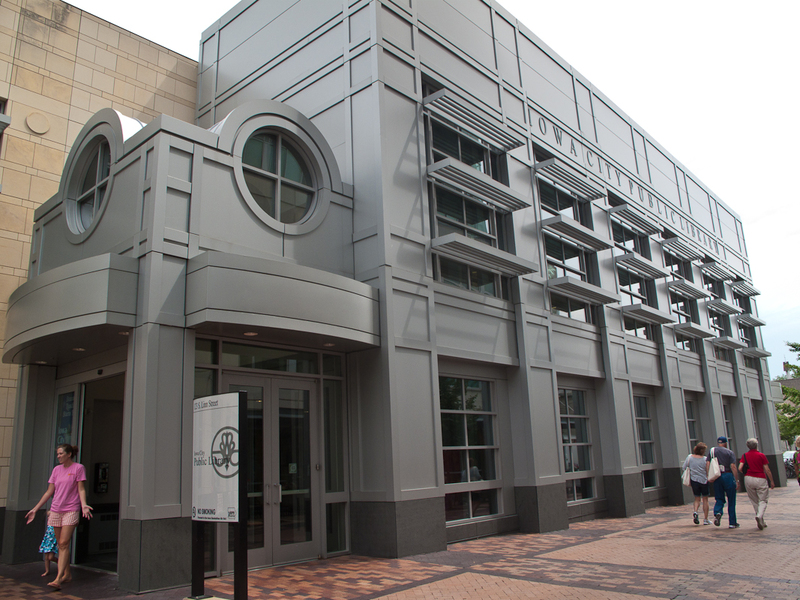 6/29/12 – I was excited about photographing the Iowa City library. We hadn’t planned on spending the night here so this was an unexpected treat. 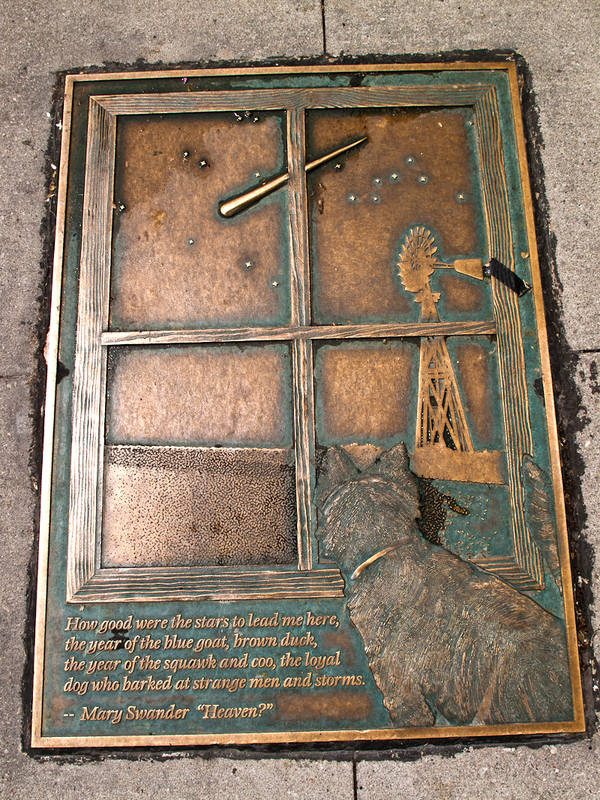 This literary city had book sculptures in the library and on the street that reflected the values of a town that thrived on writing. How unusual! In doing our earlier research for this trip there were certain libraries that we marked with a * for being especially important or beautiful. 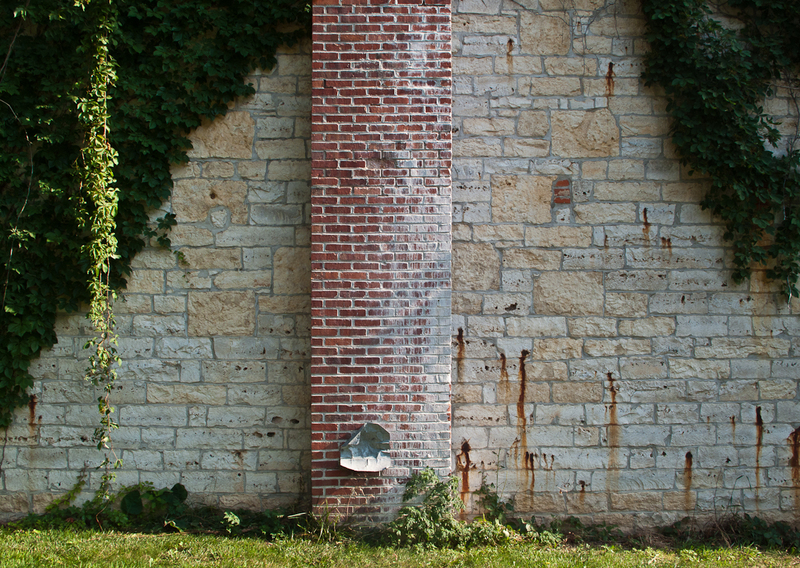 On Google the library in Letts, IA was small, old and beautiful. When we got there it was closed and had been replaced by a brand new library. Ordinarily the severe, clean lines of this new building would have been a big disappointment. But just in back of the library stood a large complex of silos and towers that were extraordinary. Combined with a flapping American flag it made for what could be a first class image. Again, Iowa forced me to adapt. We crossed the border dividing the Northern state of Iowa from the more Southern state of Missouri. 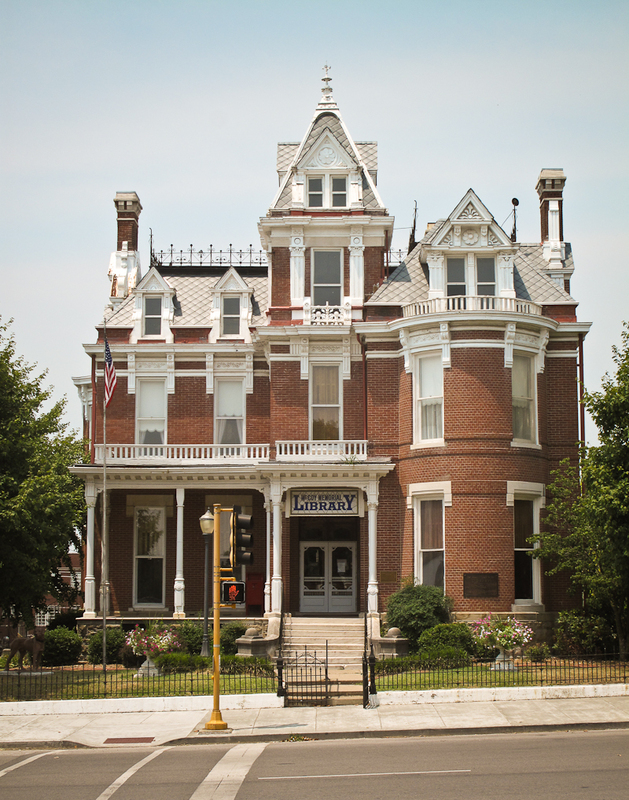 Another *’d library was in Hannibal, MO home to the famous writer Samuel Clemens. Hannibal was a poor town that was trying hard to cash in on the legacy of Mark Twain. 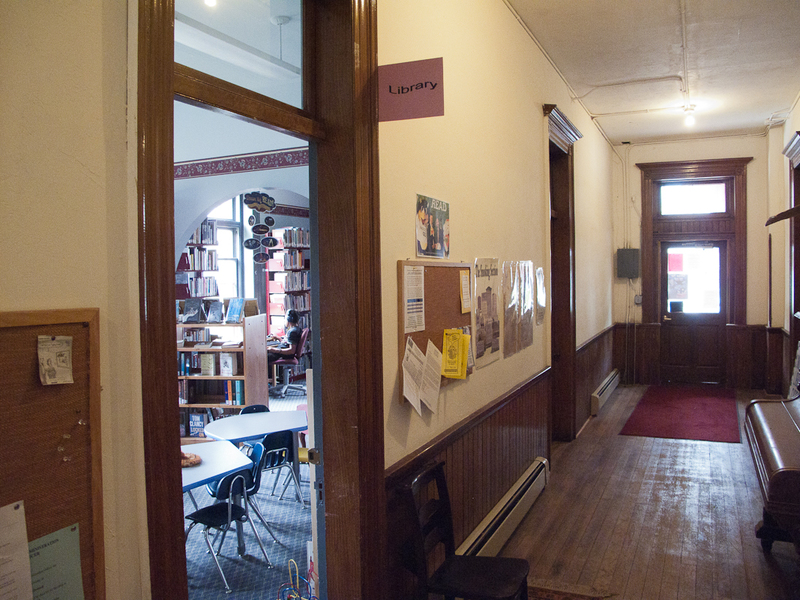 The library was built in 1901 and was a gem. Unfortunately, the inside had been all chopped up and the new additions did not integrate well with the old. The outside was spectacular. 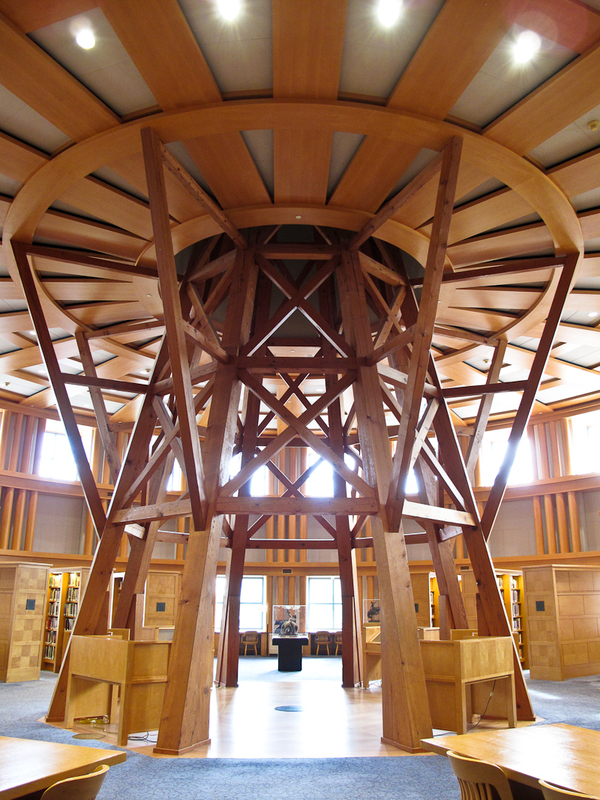 Even though it was 107 degrees in the shade I spent a long time photographing this unusually beautiful library. I finished by photographing parts of the interior that reflected the community. One display of old photographs had a haunting image of what appeared to be ex-slaves. It was faded and of poor quality. Someone had added back the eyes that presumably had blurred. Along with the more expected images of steamboats and panoramas of the town the photo of the African Americans added a surreal touch to this area’s history. Missouri was bitterly divided by slavery and the Civil War. The Ken Burns PBS documentary on Mark Twain helped explain some of this troubled past. 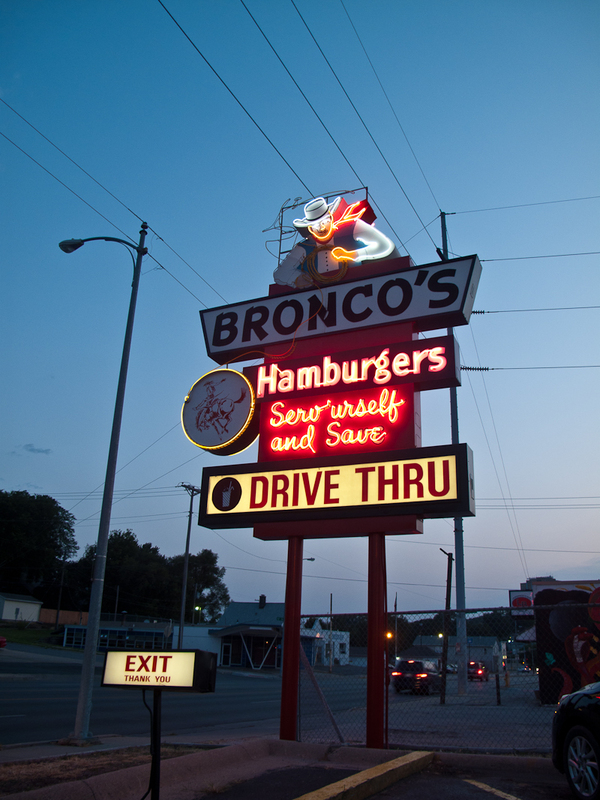 Perhaps we are overly sensitive to it but it seems that places like Hannibal, MO are still struggling with its bitter past. We finished our day in St. Louis, MO. Hannibal felt like a small Southern town but St. Louis had the complexity of a larger American city. Immense wealth and poverty existed side by side along with a recent history of racial tension and white flight. We saw gated, private streets not far from desperately poor neighborhoods suggesting a fearful place. One dinner at Milos Bocce Garden was an example. 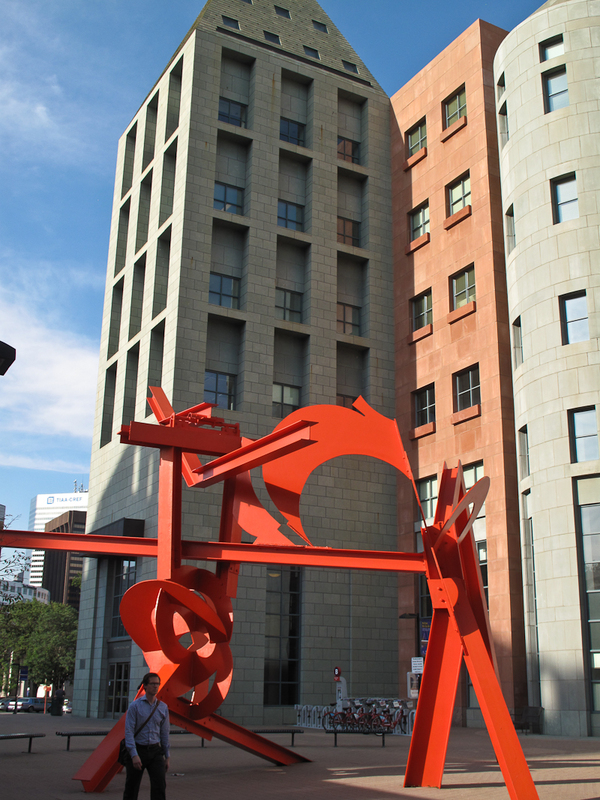 It was located in what appeared to us a remnant Italian working-class neighborhood. The inside was noisy, packed and air -conditioned. The outside patio was a tolerable 103 degrees and was next to the well used bocce court. This was an exciting sports bar/restaurant that gave us a glimpse into what much of St. Louis used to be. 6/30/12 – I knew that the Central Library in St. Louis was closed and was being rebuilt. I photographed it anyway as an example of another grand urban library. In this case with a chain linked fence around it. It was a hot Saturday but downtown St. Louis seemed quiet. A large group of homeless was camped near the library but otherwise we saw very few people. 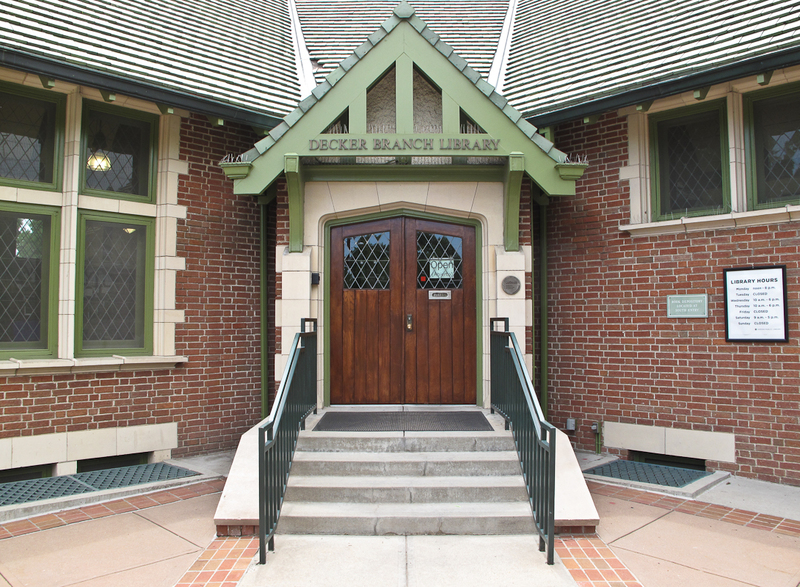 The Carondolet Carnegie branch library had just reopened two weeks ago. They had done a beautiful renovation on the inside. Unfortunately, the Central Library had failed to pass on my earlier request to photograph here. As a result, I had to jump through some hoops to be able to photograph this beautiful place. 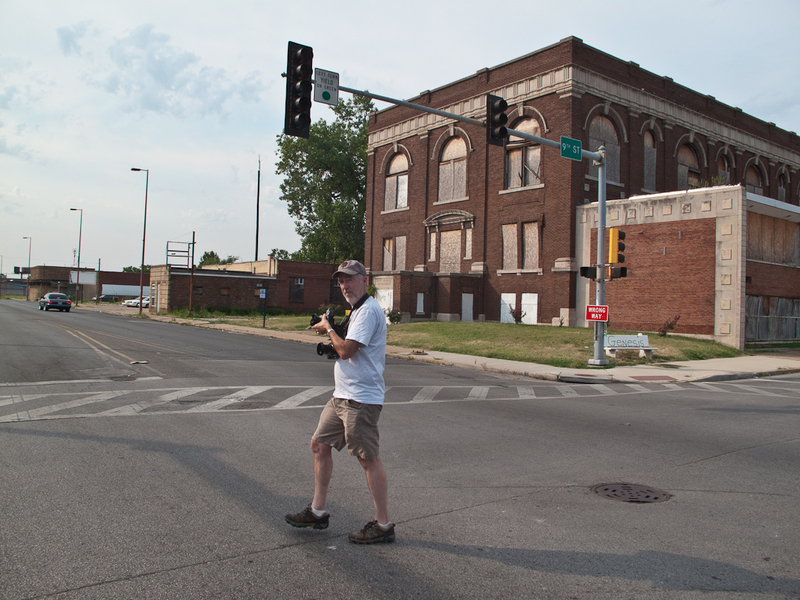 In a poor section of North St. Louis I photographed what used to be a branch library. 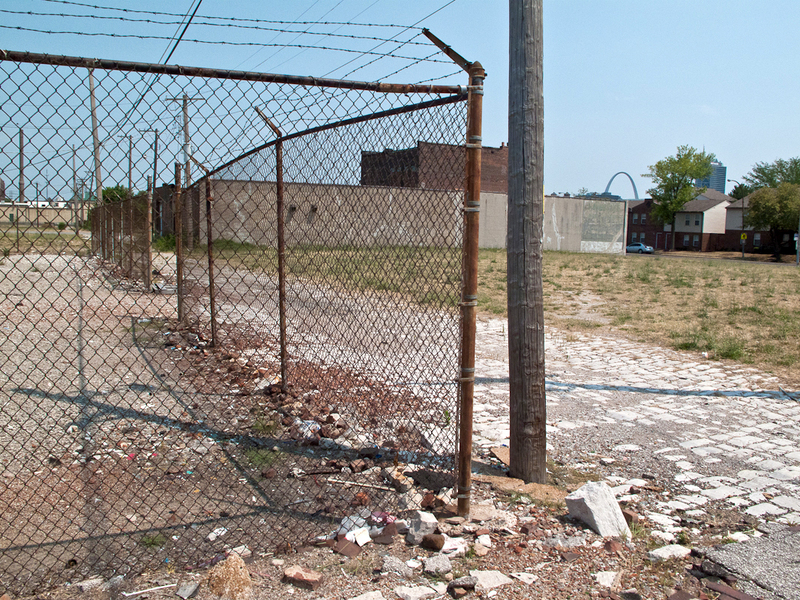 It is now an empty lot with the St. Louis Arch in the background. We were surprised to see such large areas of extreme poverty in this city. Both of us were exhausted from the heat so we spent the hottest part of the day indoors at the Missouri History Museum. We gulped down cold drinks and saw a good exhibit on the Civil War in Missouri. Coming from California where the Civil War seems far away it was useful to see how the effects of that terrible conflict are still felt here. After a few hours in the museum we felt refreshed and ready to plunge back into the heat. Right away we visited three extraordinary places. The first was an old club that later became a library and is now an abandoned building in East St. Louis, IL. Much of the town looked like a war zone. Empty buildings that you could see through sat next to open lots. Once beautiful structures had trees growing out of them with grass on the roof. The abandoned library had once been a nightclub where Miles Davis got his start. 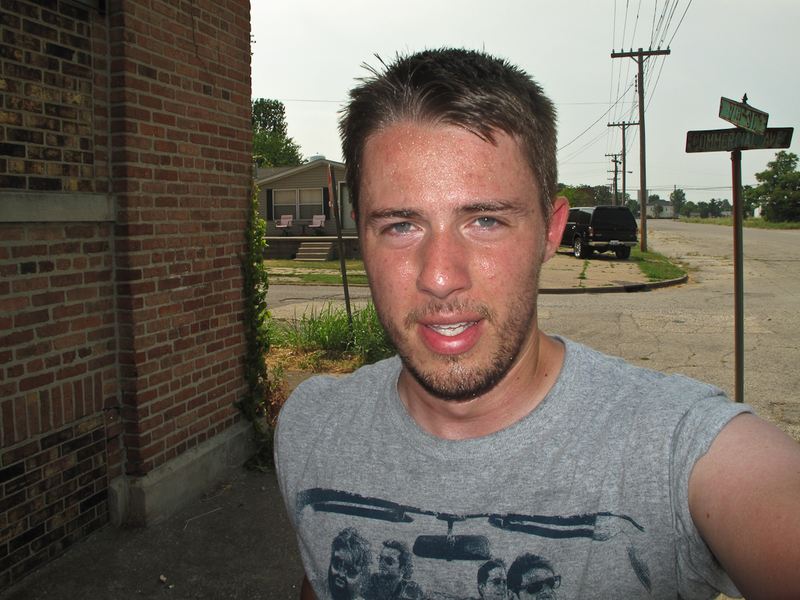 As in Detroit last summer, we felt that we were protected here by this brutal heat wave. Nobody messed with us because it was just too damn hot! After photographing this relic we almost ran out of gas in East St. Louis. We pulled into the only gas station around. I debated whether or not to become invisible while pumping gas. I realized that in this weather nobody cared about the color of my skin. 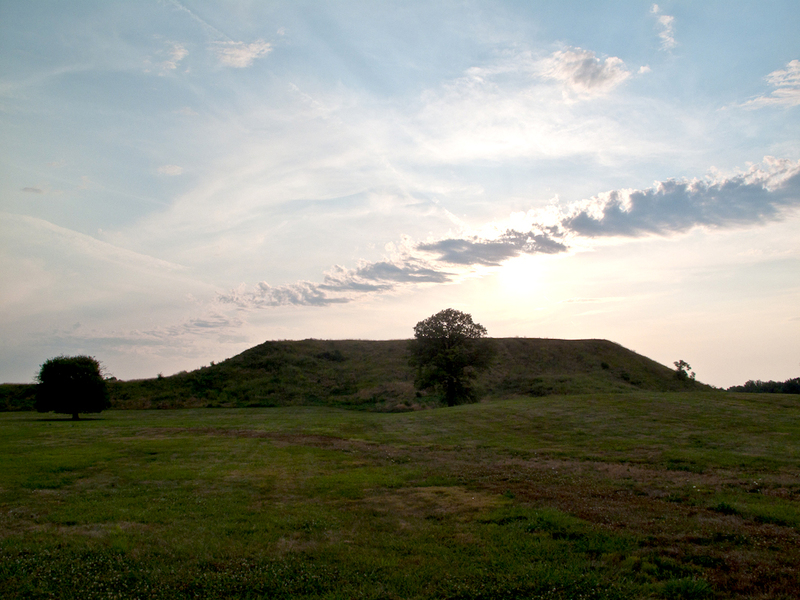 The second extraordinary place we visited was Cahokia Mounds Historical Site. We had been hearing a lot about this place in our book on CD called “1491”. In pre-Columbian times this was the only city north of the Rio Grande River. Because of its extensive network of mounds it contained the largest earthworks anywhere in the Western Hemisphere. “1491” has been invaluable on this trip by providing the historical context for what we are seeing. 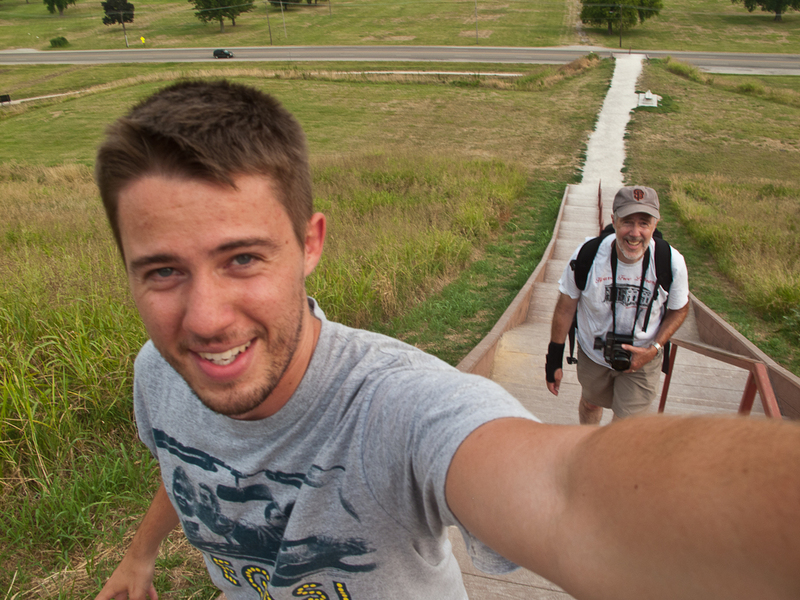 We climbed the stairs up the gigantic Monks Mound and off in the distance we saw St. Louis and its Arch and a giant chemical plant belching smoke. We sat on the far edge of the Mound in the late afternoon heat and light savoring this beautiful place. We imagined what it was like here 800 years ago at the height of its power. We think of the utter devastation we just saw in nearby East St. Louis. We wondered about this thing we call progress. Apparently, the Cahokian civilization ended because they destroyed their environment, were poorly managed and their leaders indulged in political hubris. Sounds familiar. 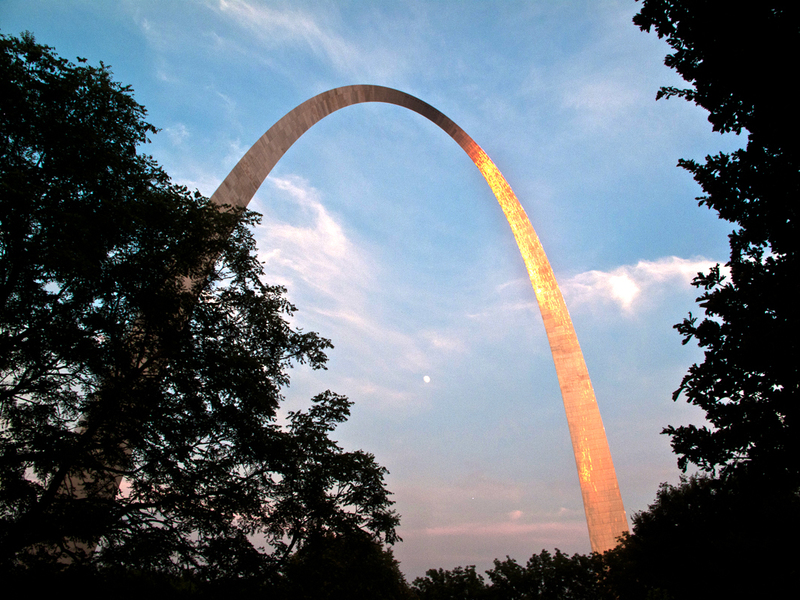 We ended the day by visiting one of the great American icons – The St. Louis Arch. 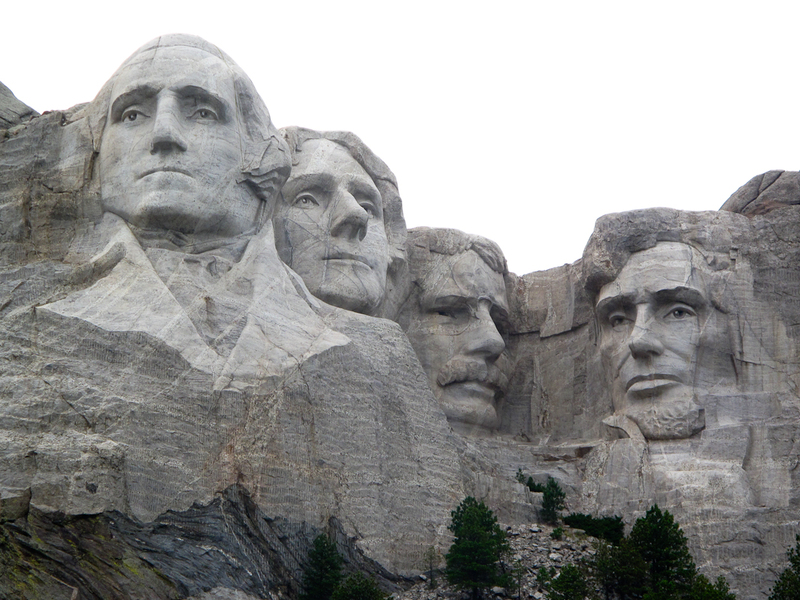 This extraordinary monument to Western American expansion is brilliantly conceived and produced. 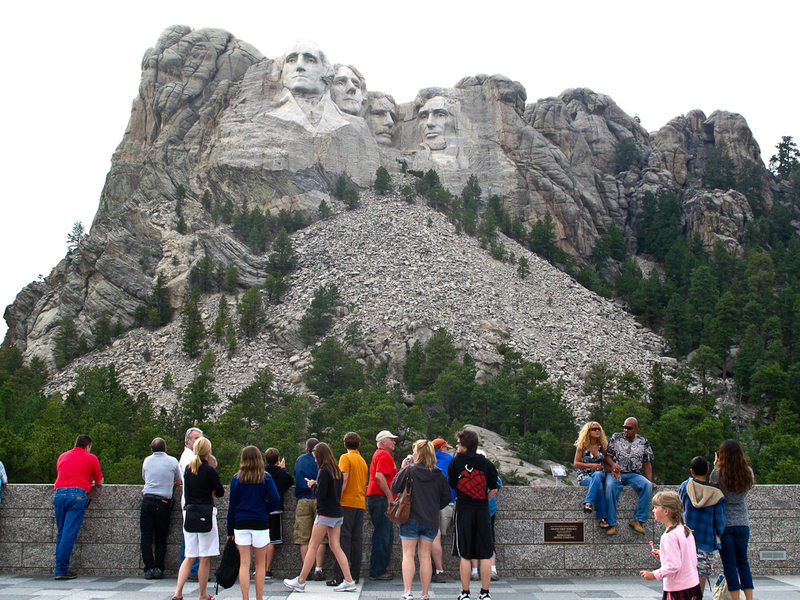 The setting is stunning and the National Park Service does a great job of managing it. However, in some ways it is similar to Cahokia. It is a monumental expression of our country’s great power and ambition. 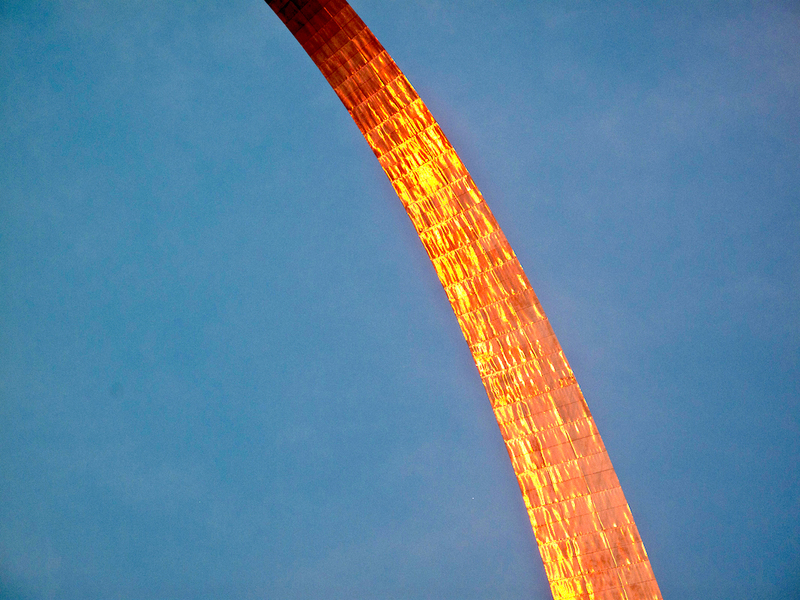 But across the Mississippi from the Arch is the collapsed civilization of East St. Louis.